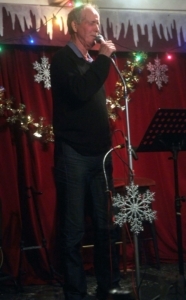 So far Ron Lester has created 47 blog entries. We had a fun night, and birthday cake courtesy of Mike, who had a big birthday. 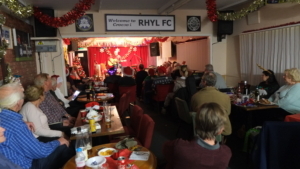 REMEMBER FOLKS, NO CLUB ON 3rd MARCH DUE TO FOOTBALL MATCH. 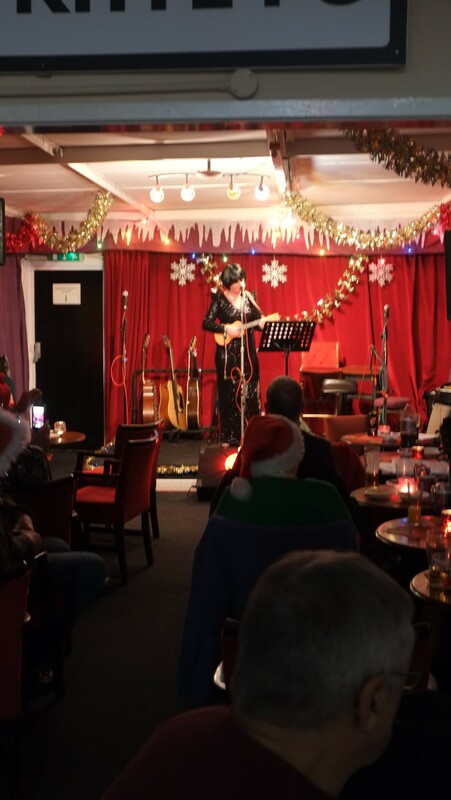 Here are some pictures from the night. 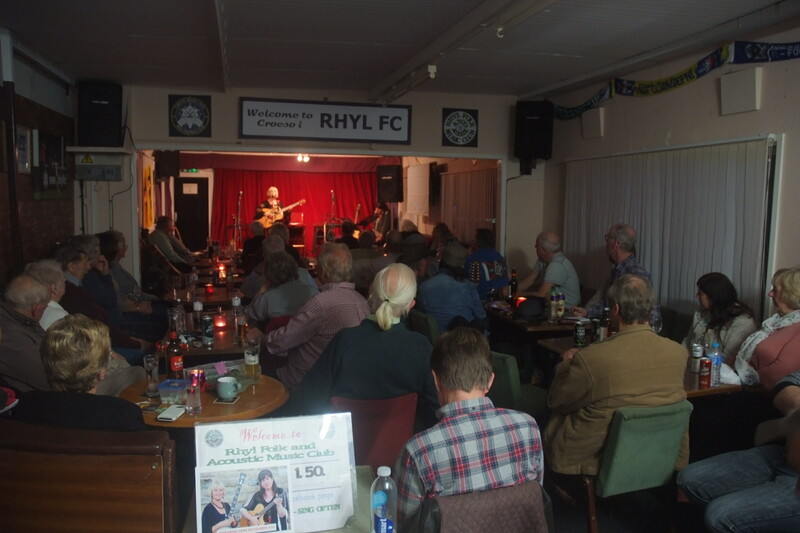 The club was full, there was no empty seats, and people standing at the back. 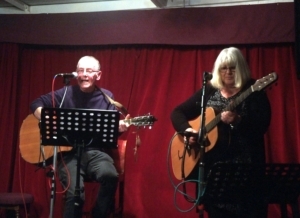 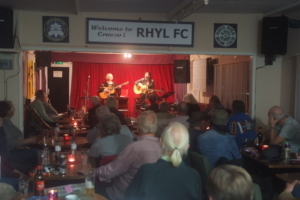 The evening started with Tom and Linda, and Linda sang The Northern Plains, a lot of new faces at the club looked a bit surprised when all the Rhyl members started howling along, a bit like a scene from Robert Rodriguez Dawn till Dusk! 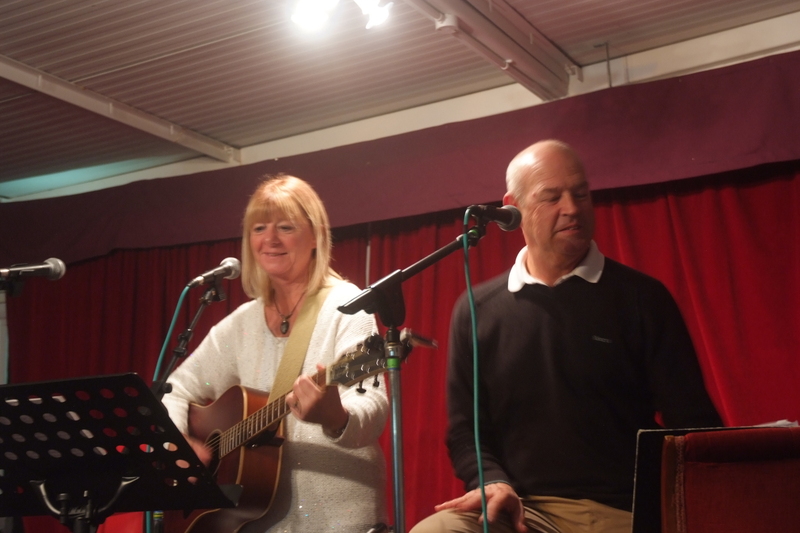 Wendy and Richard did a short turn next, and Richard calmed everyone down with a Jim Reeves song. Chris Birchall made the mistake of coming over to my table, and asking me if I could send him a couple of pictures of Merry Hell for his blog. 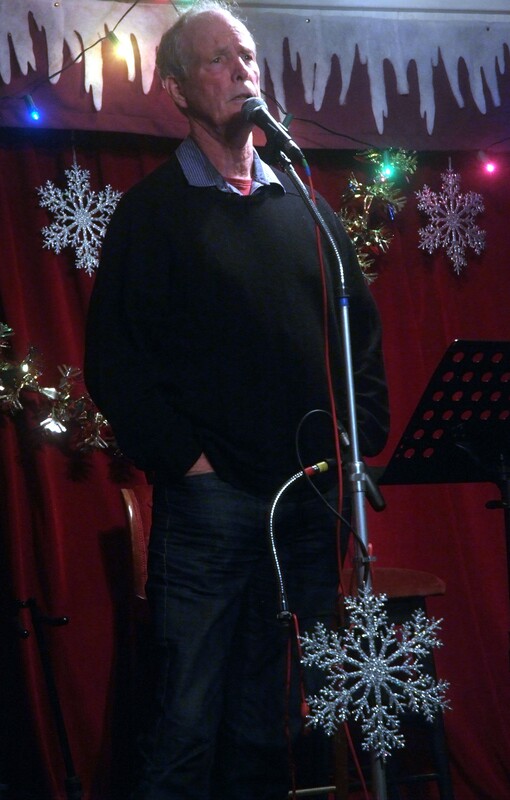 He left carrying my camera, muttering something about having a night off! 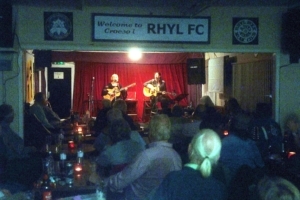 (Were thick skinned at Rhyl) Now I thought we would get to see one of the best bands in the country, and have it photographed by one of the best photographers. 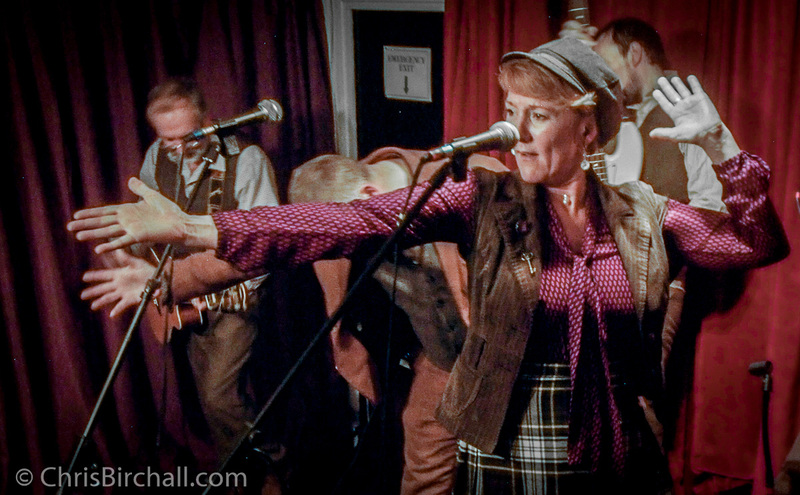 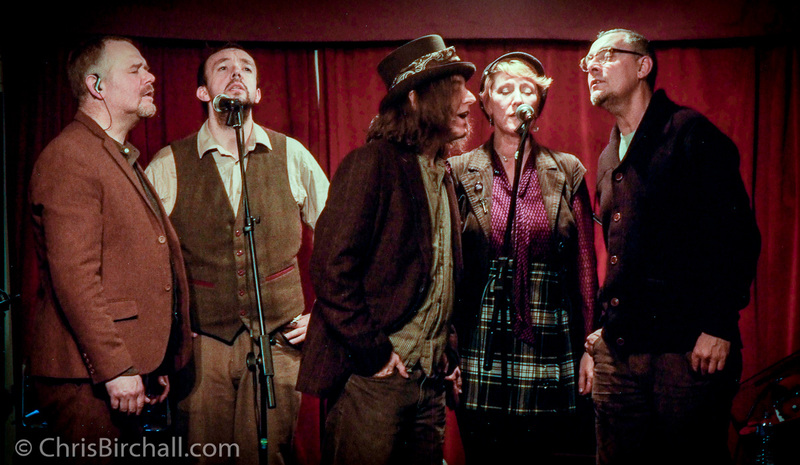 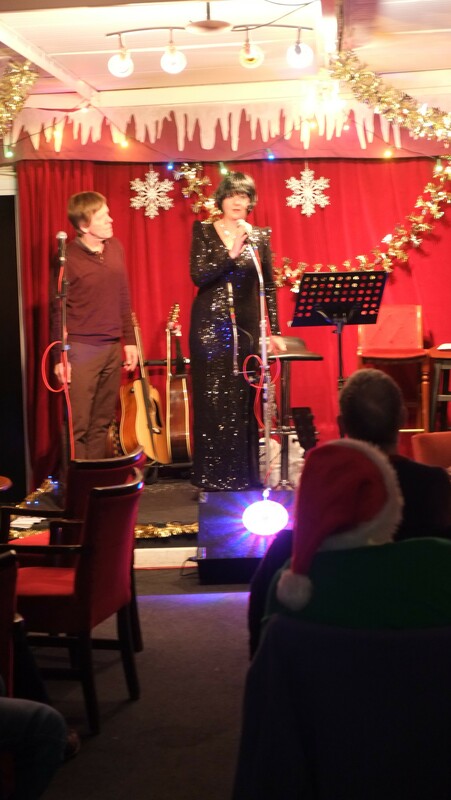 A sing along with Glyn and two songs from Penni and it was time to welcome Merry Hell for their first spot. As usual they were superb, The Kettles were in fine fettle, Andrew and Virginia’s voices, so different, yet compliment each other perfectly, as they always do, John unique and infectious guitar playing, and Bob the fine riffs on his mandolins. The Non-kettles, Nick, giving us a great bass line, and Neils superb fiddle playing adds the last bit of magic to the mix. 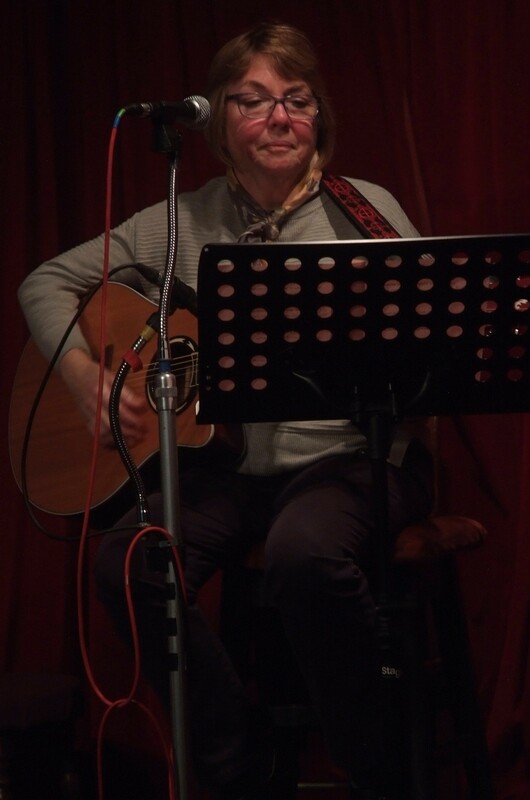 I caught odd sight of Chris with my camera hanging from the roof, he was obviously enjoying himself, which made me happy that I had lent it to him! 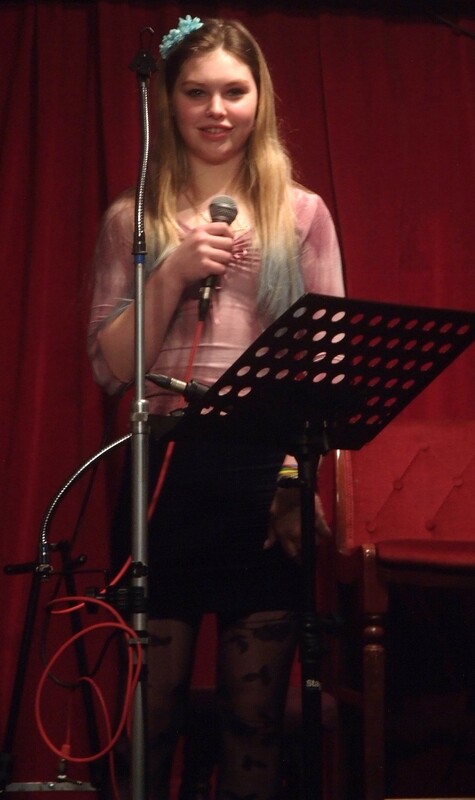 The Time went to fast. 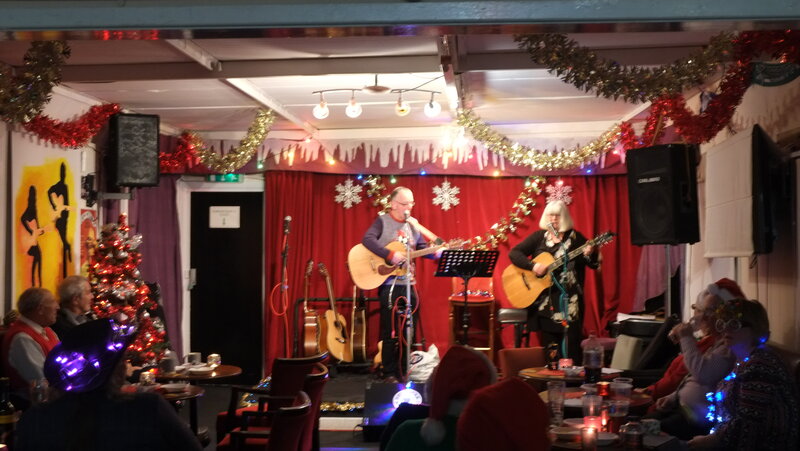 They went of for a well earned rest, while Neil had someone draw the raffle, and Barbra, Pam and Jackie distributed surprise plate loads of sandwiches! thanks to the girls who made the sandwiches, they made a fantastic evening even better. Could the evening get any better? 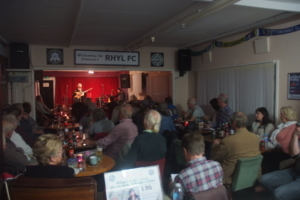 Yes, Whilst the band were enjoying their rest the Rhyl regulars did a song each, ending with Penni’s Falling Leaves. 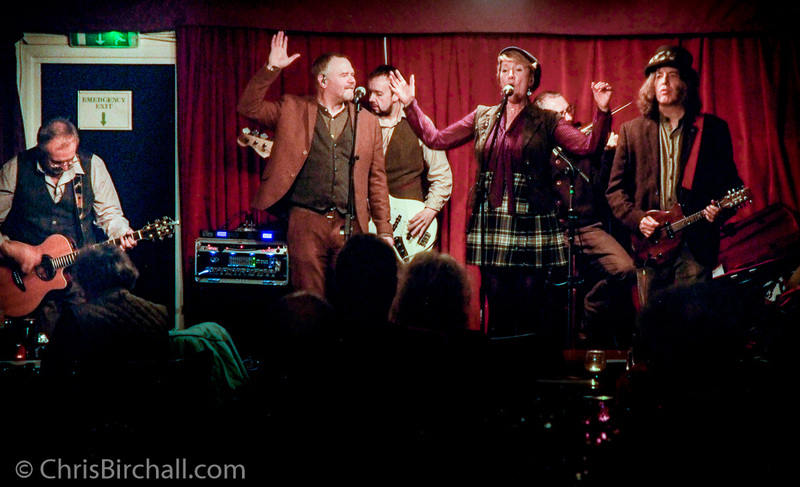 We then welcomed Merry Hell again , for their last spot and to close the evening. 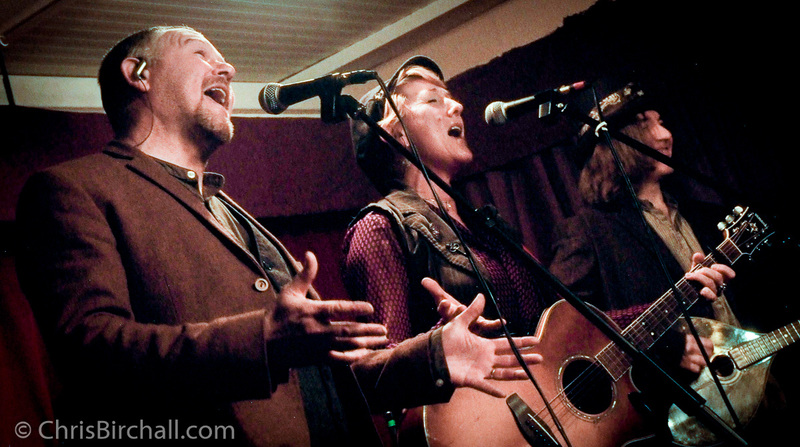 Those guys know how to write good songs, the night ended with the band giving us an encore. And so ended one of, if not the best guest night ever at Rhyl folk and Acoustic. 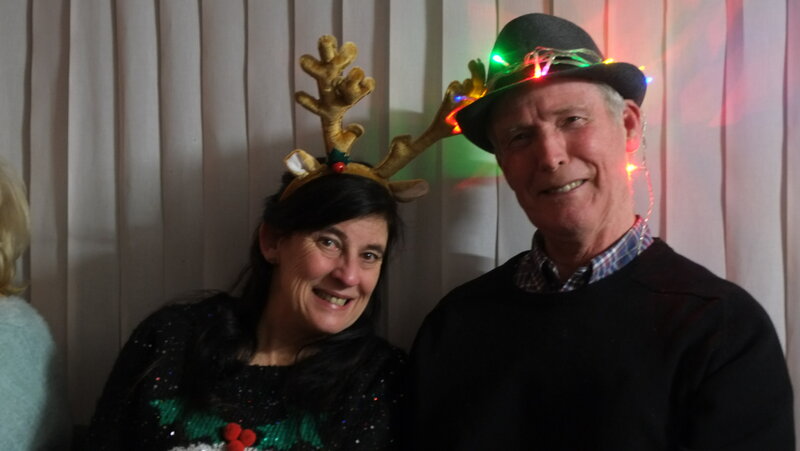 Chris returned my camera, and as he looked like he’d had such a good time taking the pictures, I suggested he might like to work his magic on the raw pictures, I was pleased he looked so happy about it. Tissues and razor blades were then handed out..
when Wendy sang a song, without her guitar, ( heavily inspired by Geoff Hollis) the 1934 Cole Porter song, Miss Otis Regrets, luckily, no one used the razor blades, but there was a few wet eyes in the room. she then cheared us up with Dusty Springfield’s I Only Want To Be with You, and finished with The Shires Daddys Little Girl. 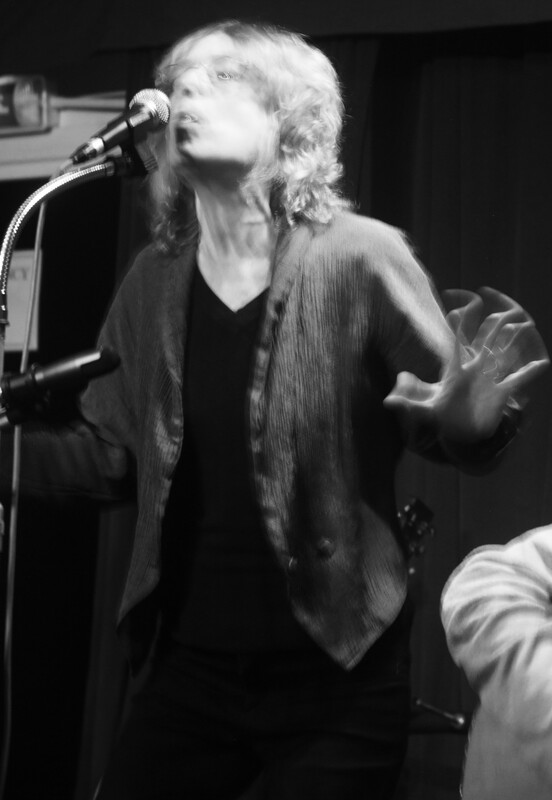 Have a listen to the original 1934 Ethel Waters Version!!! 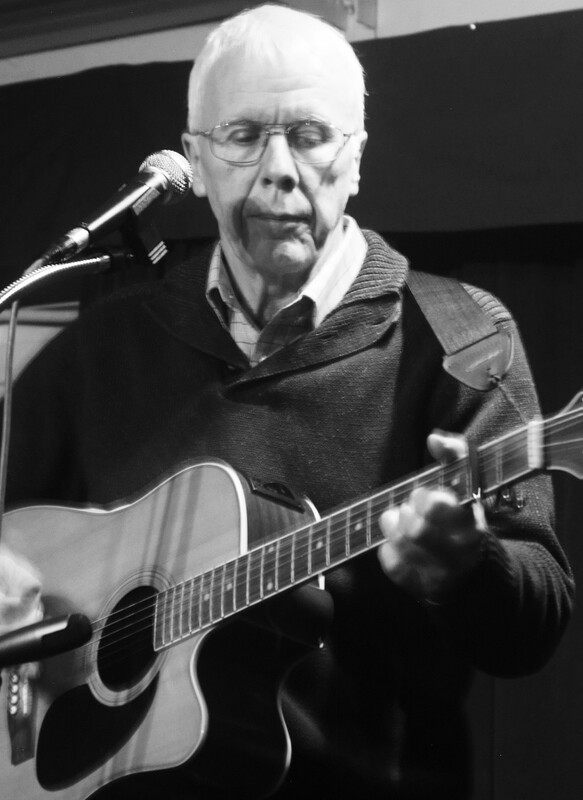 and singing a lot of songs he remembers from his days at the old Bee Folk Club, he started with Can.t Help But Wonder Where I’m Bound, (nothing to do with Shades Of Grey), and finished with white Cockade. 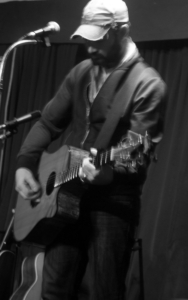 On his final apearence he finished with the Mary Ellen Carter. 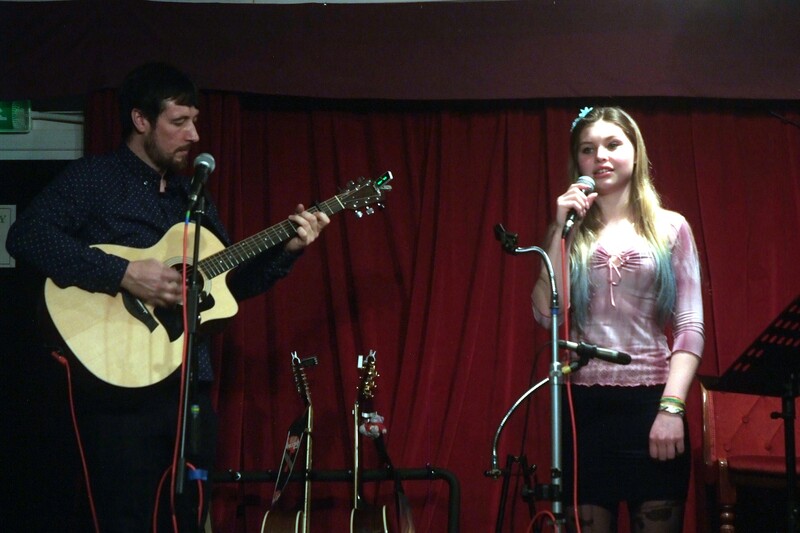 it was a good night, with a lot of good songs, Two people who were not regulars and came were Teagan, and John. He then accompanied Teagan on guitar when she sang Ed Sherans Angels To fly. 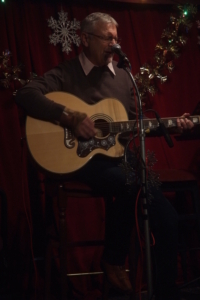 completely un-rehearsed, and it sounded great! 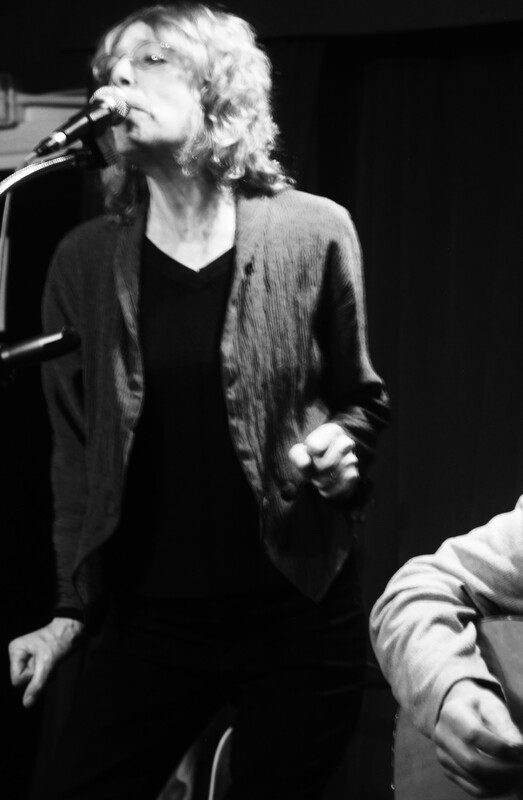 Lets hope they both come again soon. 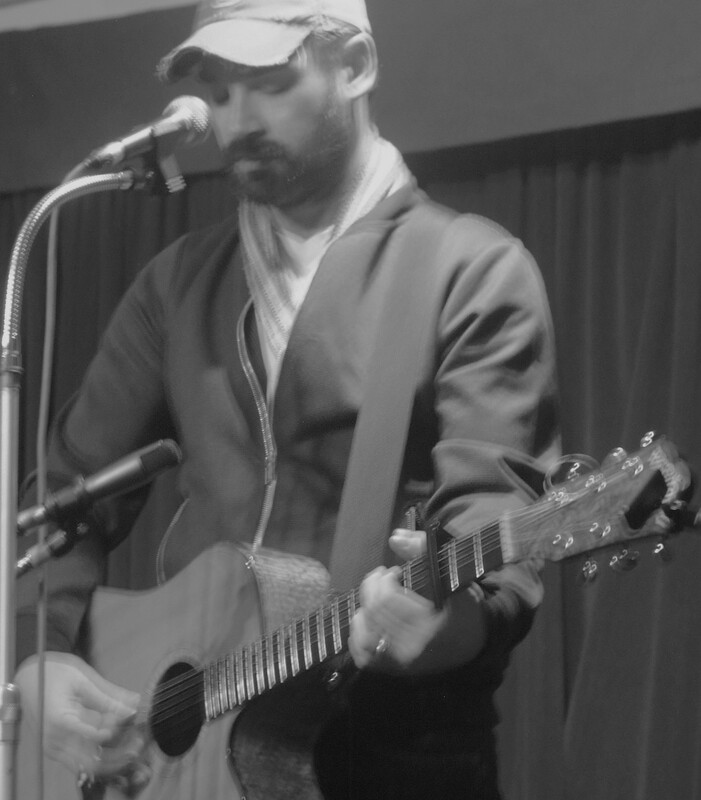 Now back to this week. John sang Billy Joel’s Piano Man, then after the break Ghost Riders in the Sky, don’t know who did it first, but Johny Cash did it best!, then finished with a Frankie Vaughn song. 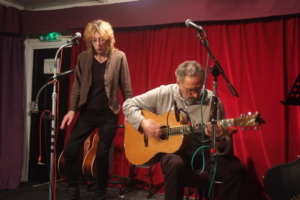 Penny and Bob Did a duo. 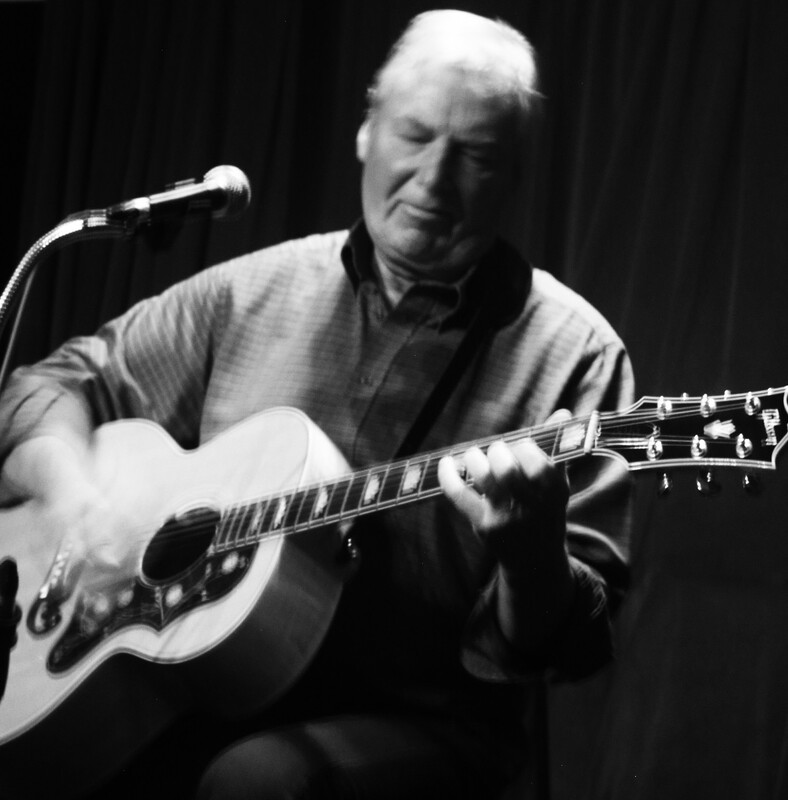 Bob carried on by himself and sang a Bob Dylan song, and John Prine’s Unwed Fathers. 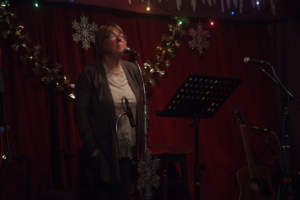 Penny then came back to sing James Taylor’s You Got A Friend, and the classic Autumn Leaves. 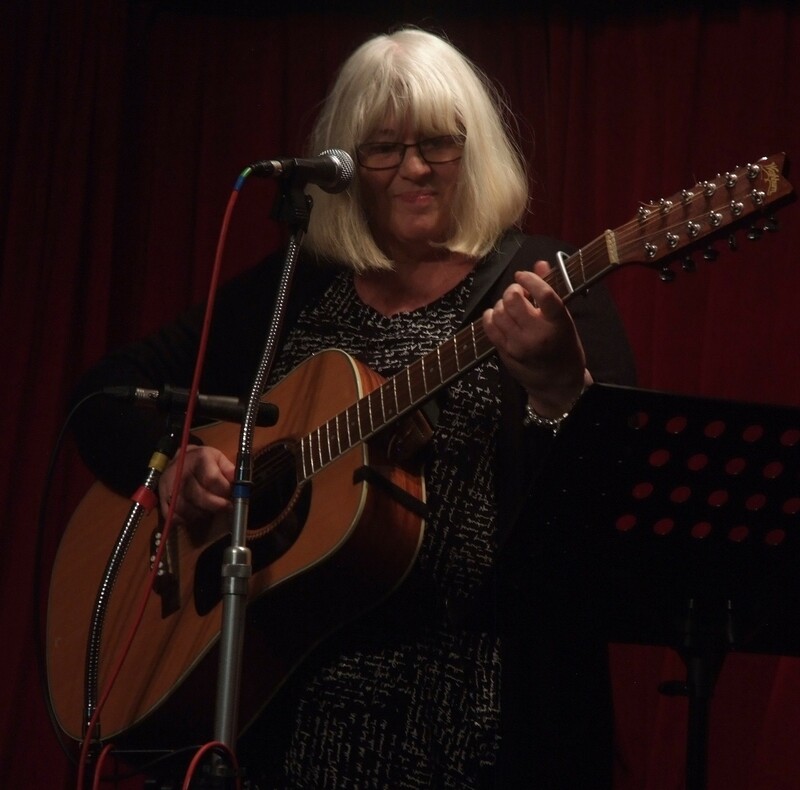 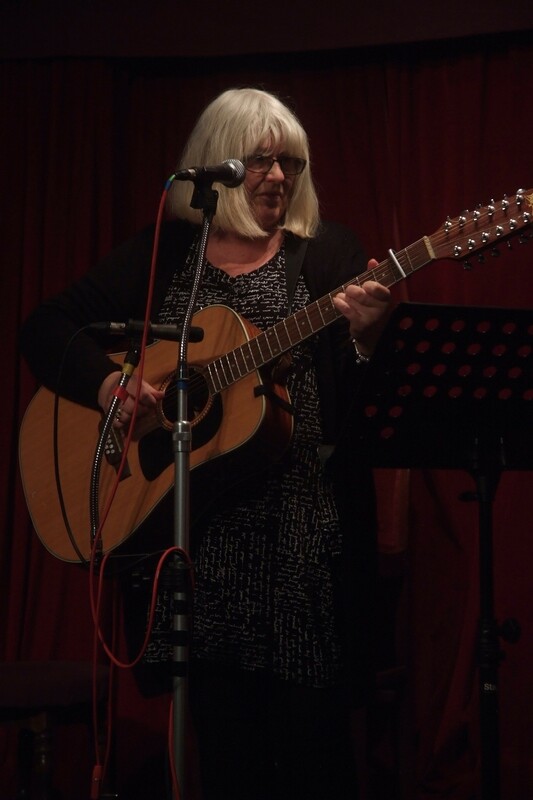 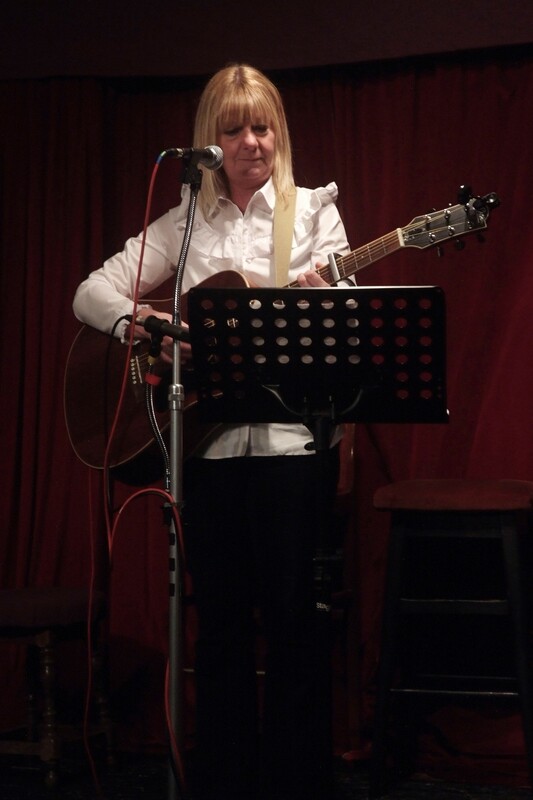 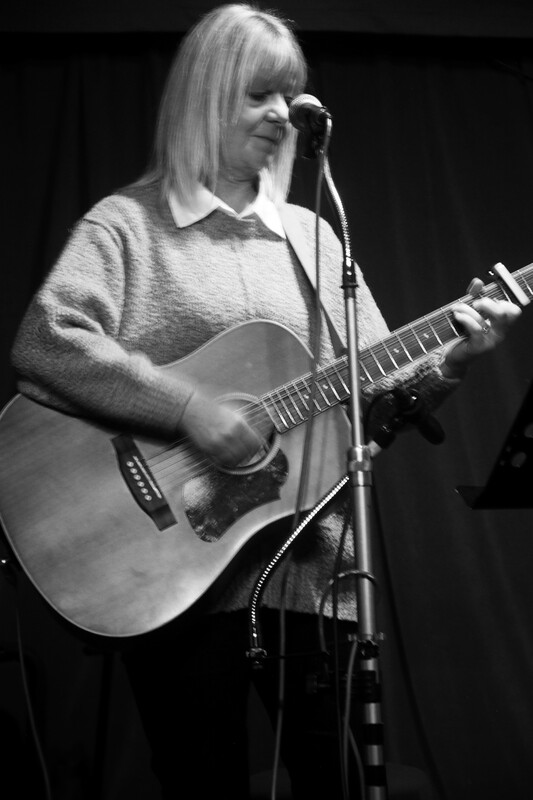 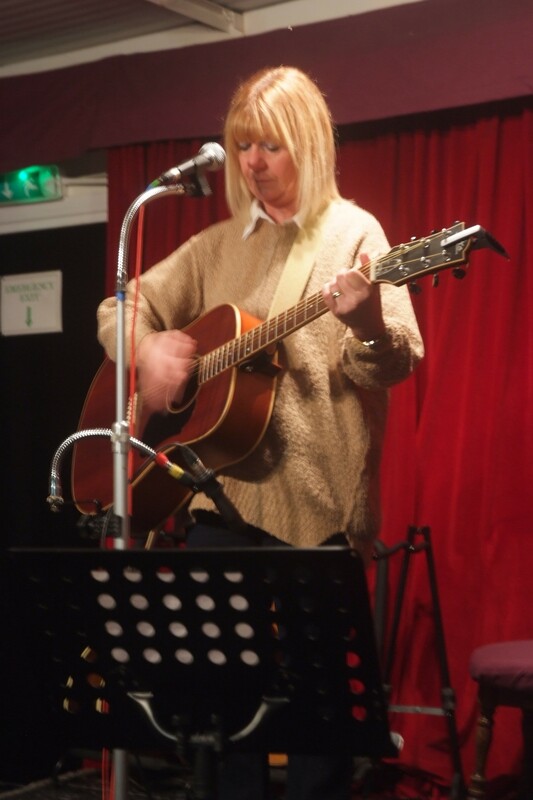 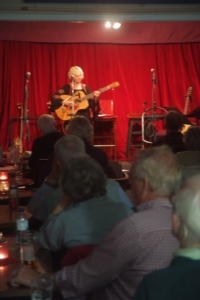 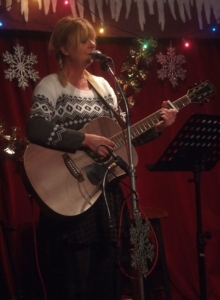 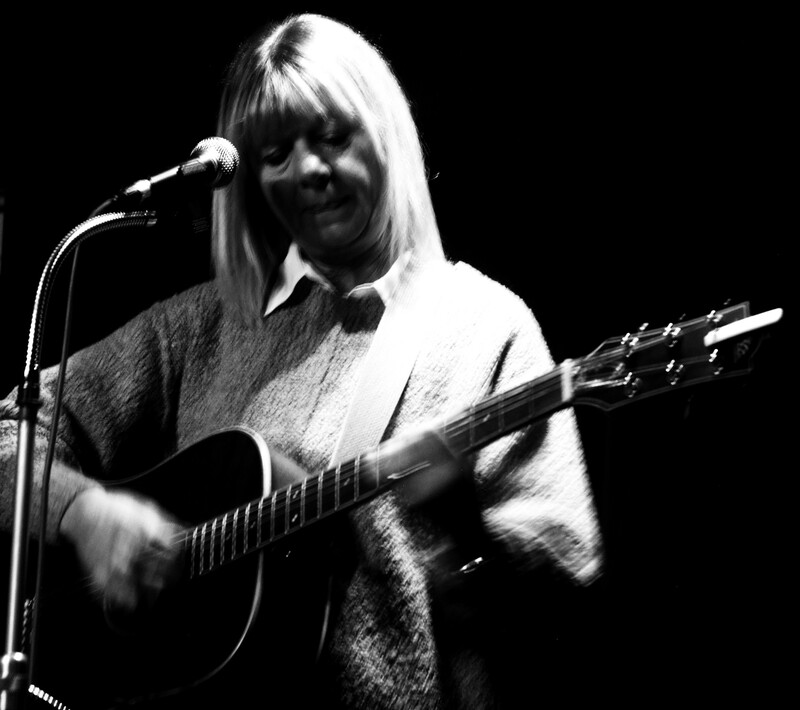 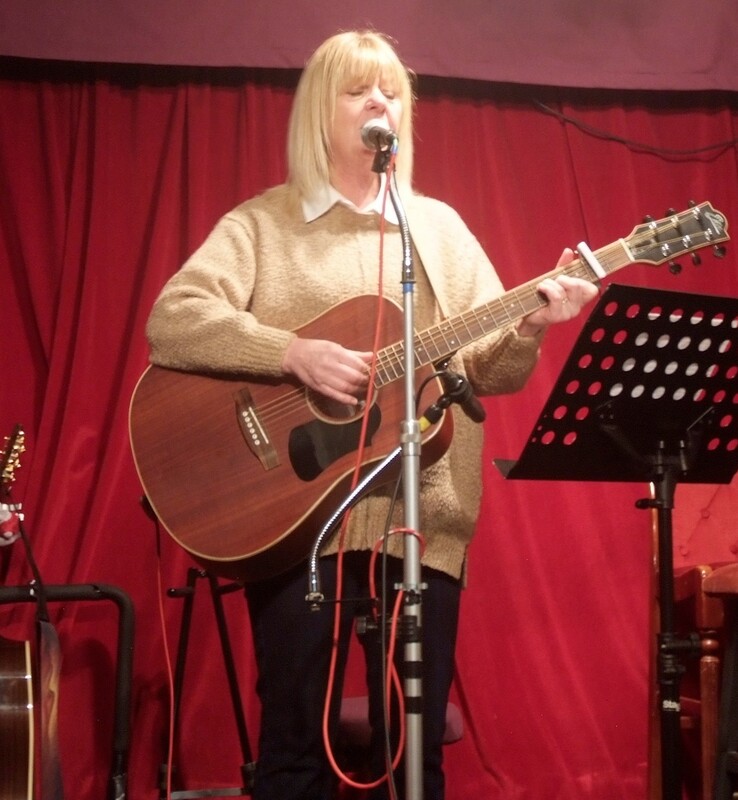 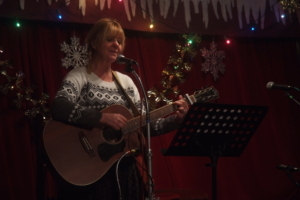 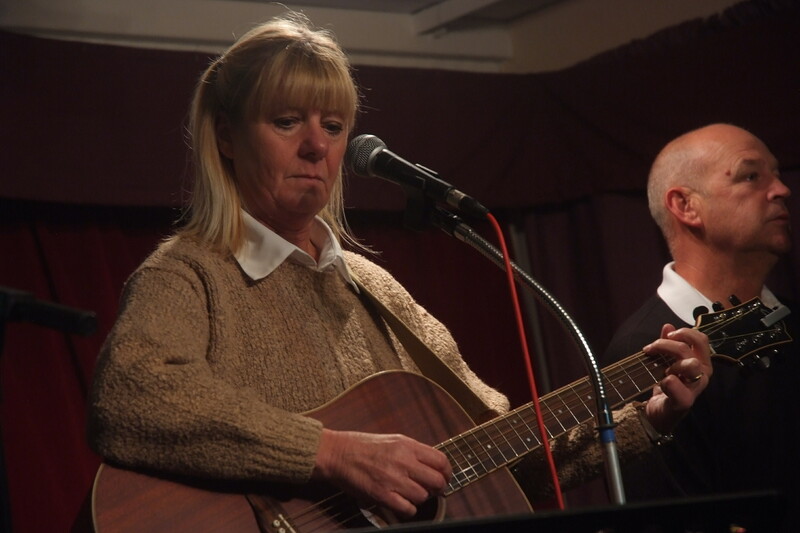 Glyn had her guitar with her, (no song sheets this week!) and sang Yellow is the Colour, (was that Donavan?) 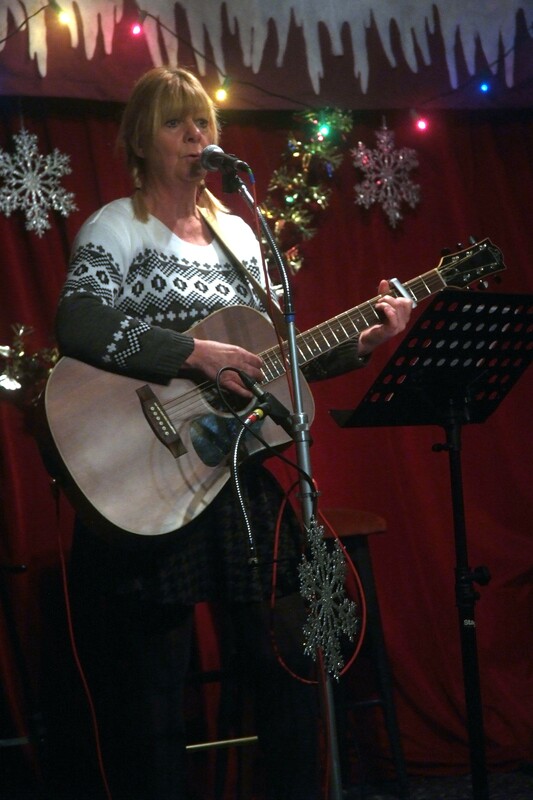 and Where have all the flowers gone, (Skeets doing a good job). 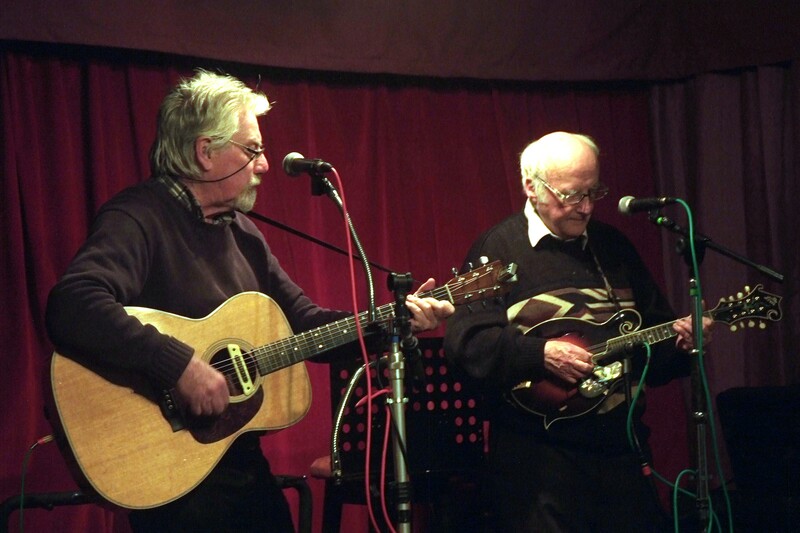 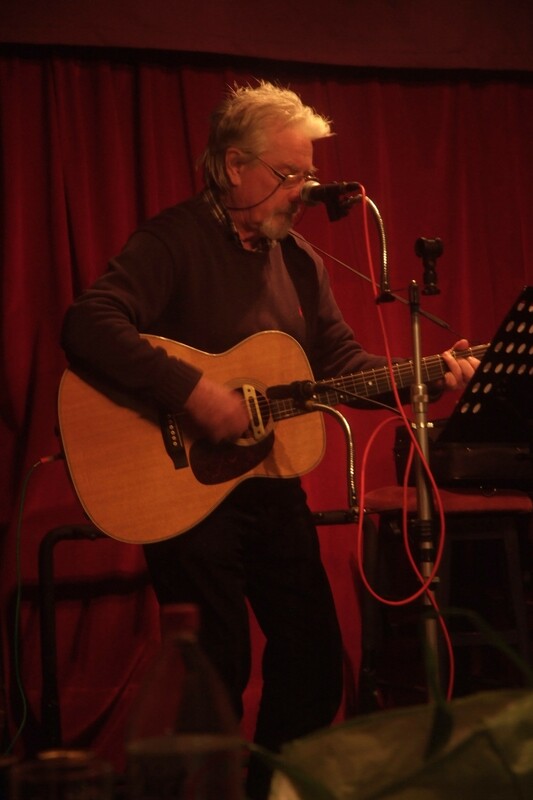 Geof continued his Tom Paxton Season with another two more of his songs, on his second spot it was back to a John Wright classic and finishing with The Old Boys are leaving. 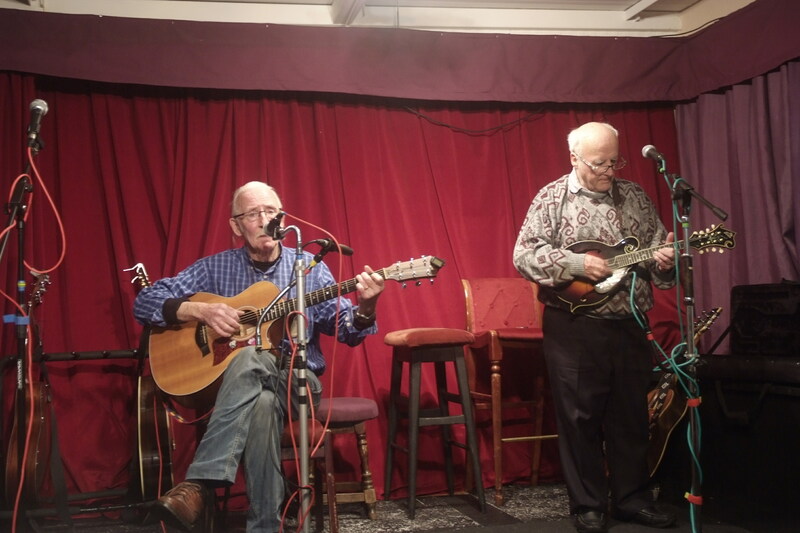 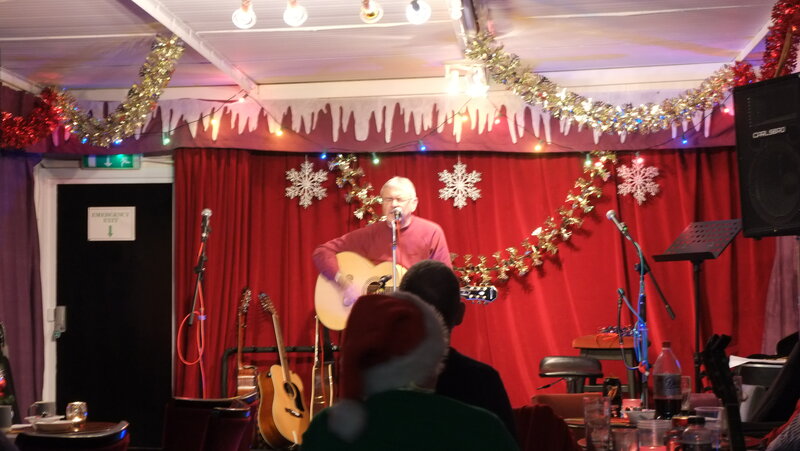 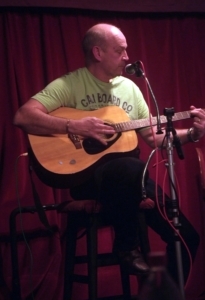 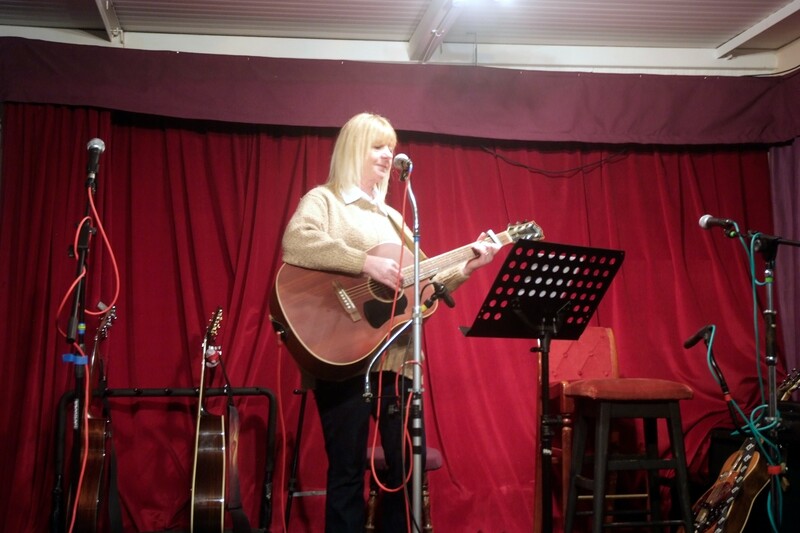 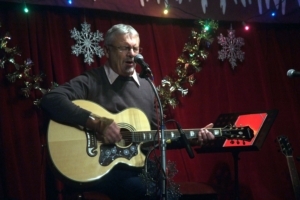 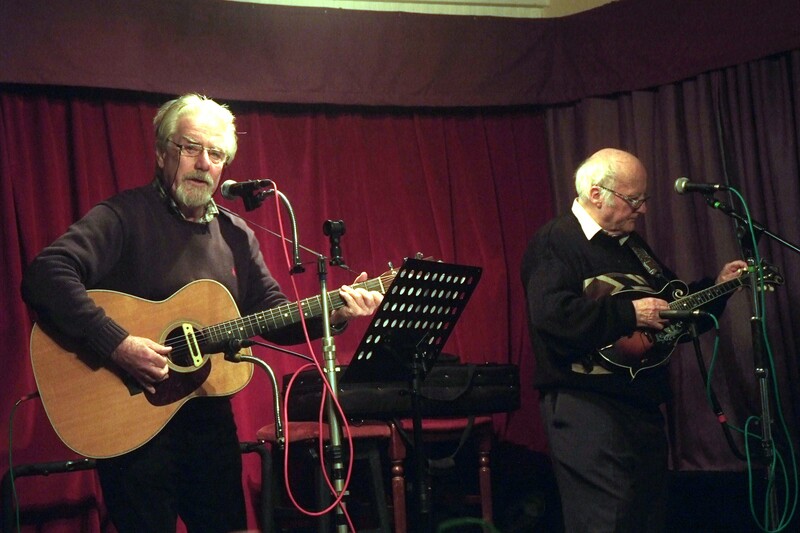 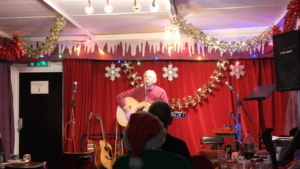 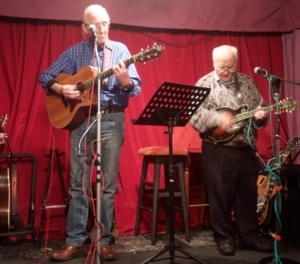 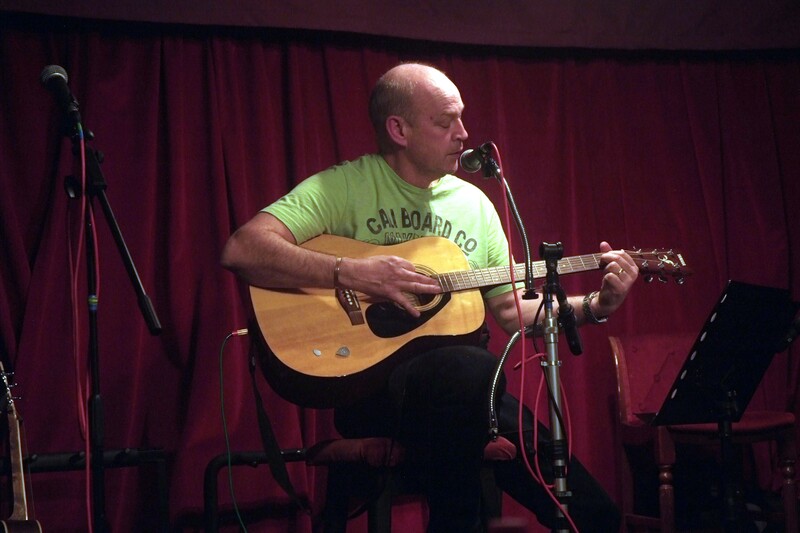 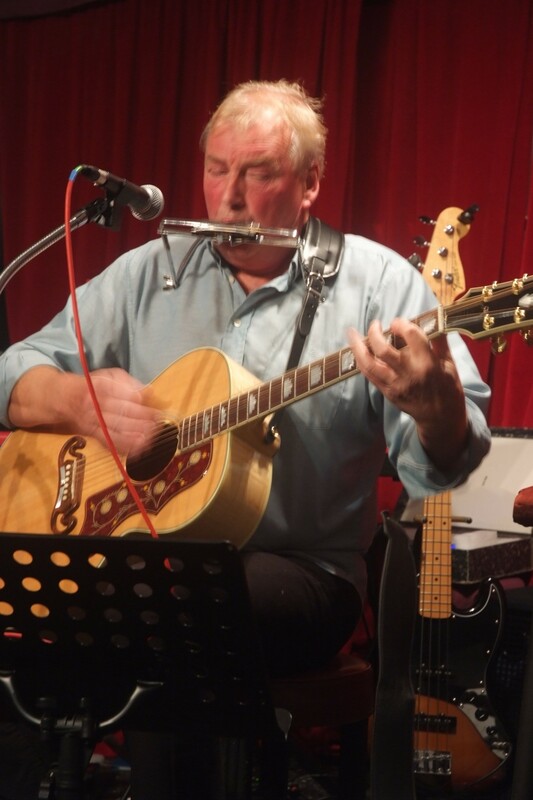 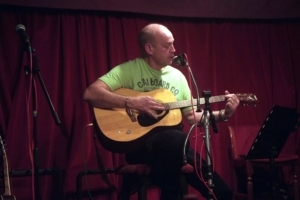 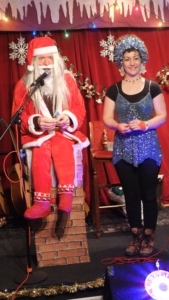 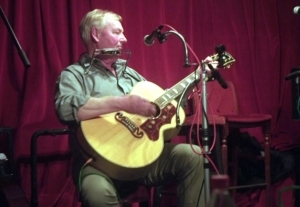 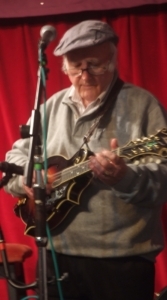 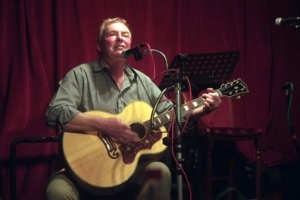 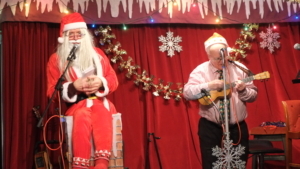 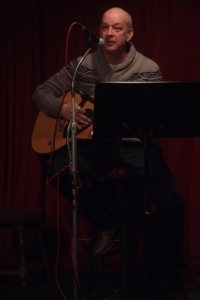 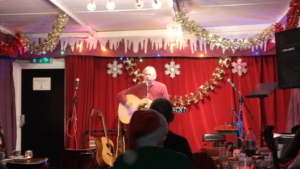 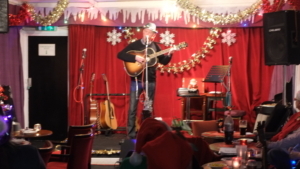 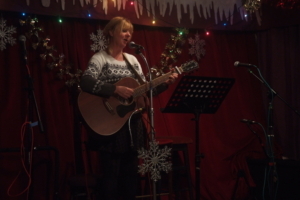 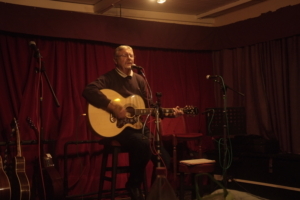 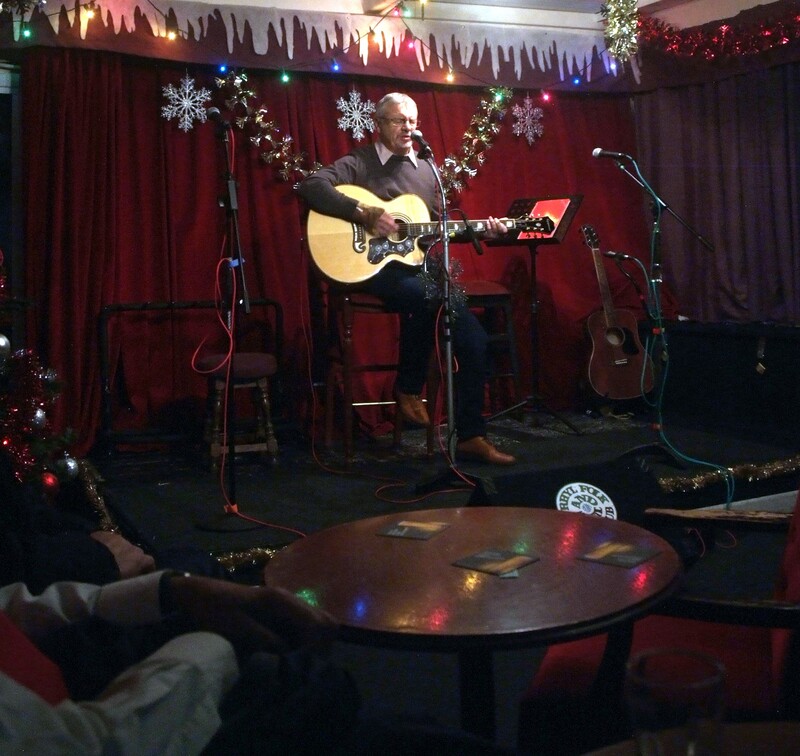 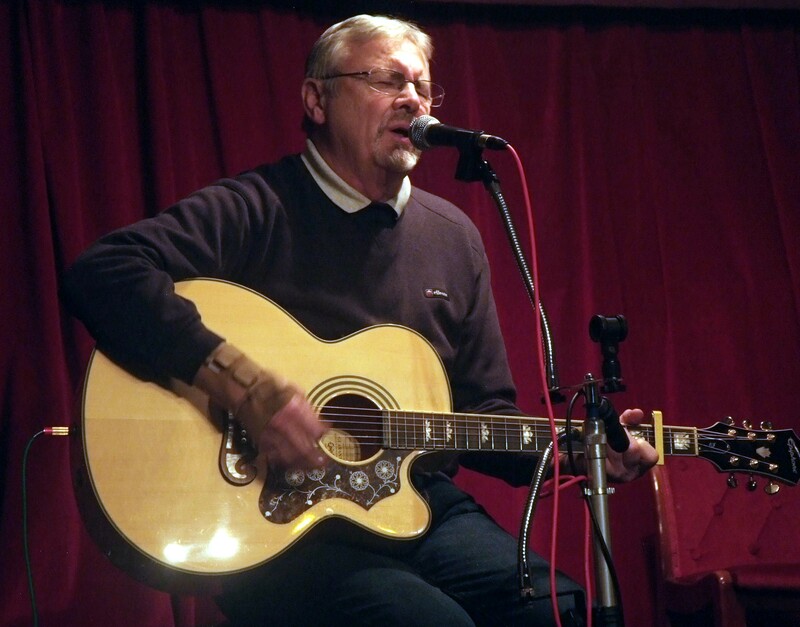 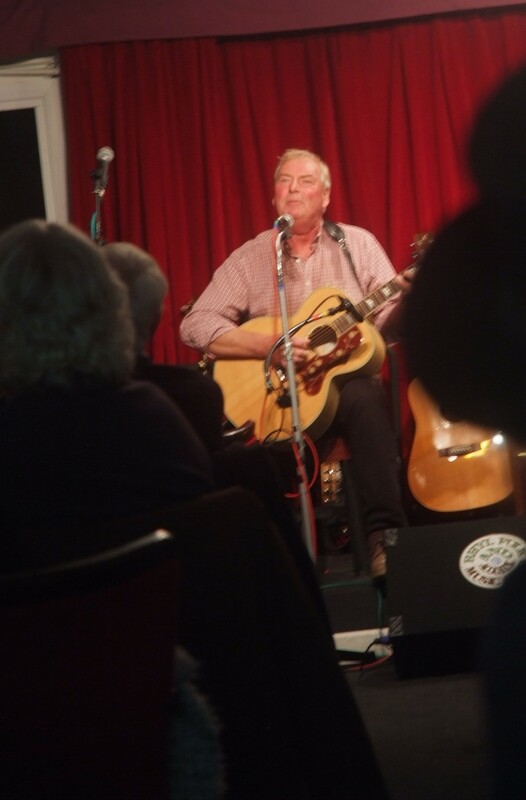 We were then entertained by our friend from the Ruthin Club (Thursday Night 7:30pm in the Feathers!) 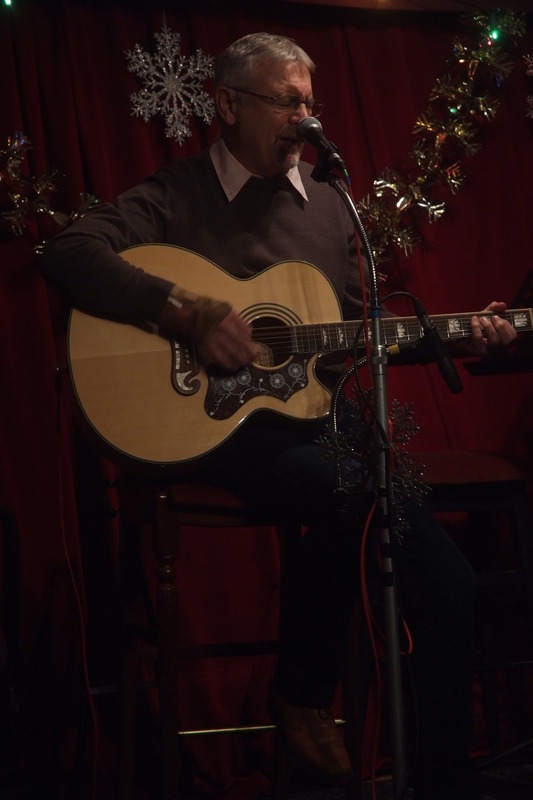 Mr. Chris Birchall. Tom and Linda started it, tom with The Land Of The Navajo, and Linda made us howl to the Northern Plains. 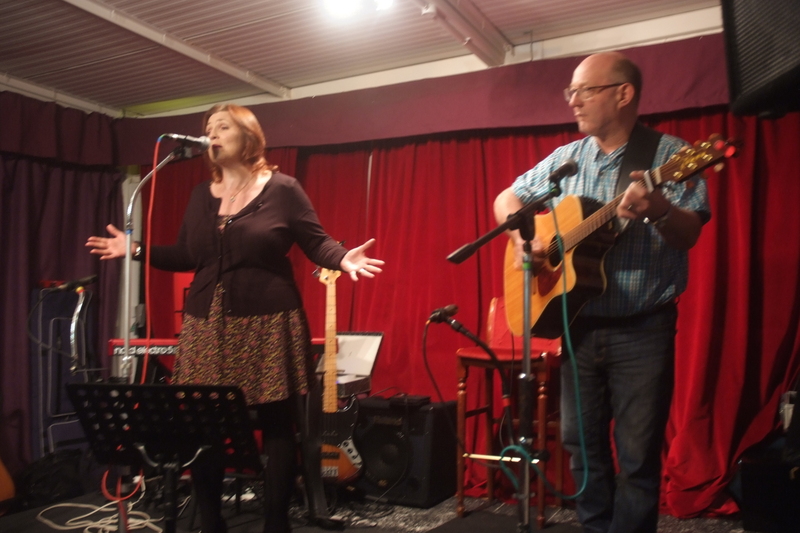 Richard sang Roses are Red, Wendy sang a nice Welsh song (something about a moor). 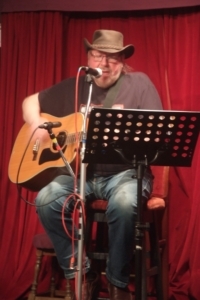 Cowboy hats back on for Ghost Riders in the Sky from John. 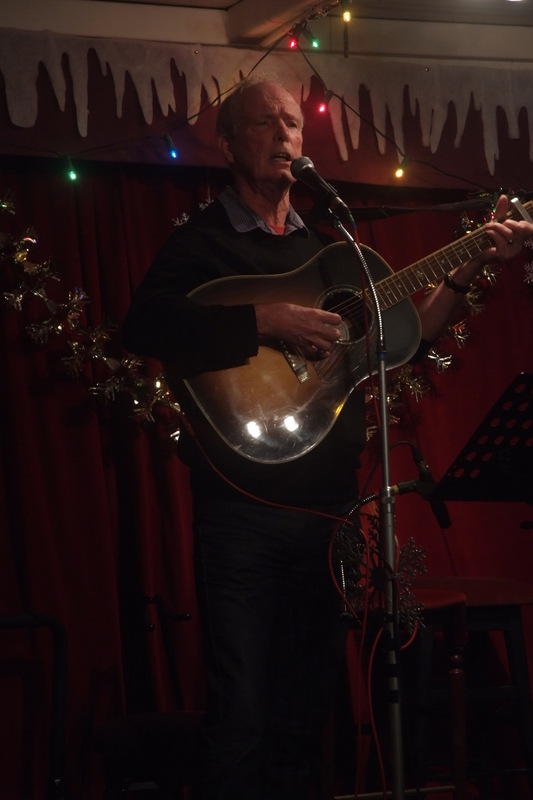 closely followed by Glyn singing Lord of the Dance. 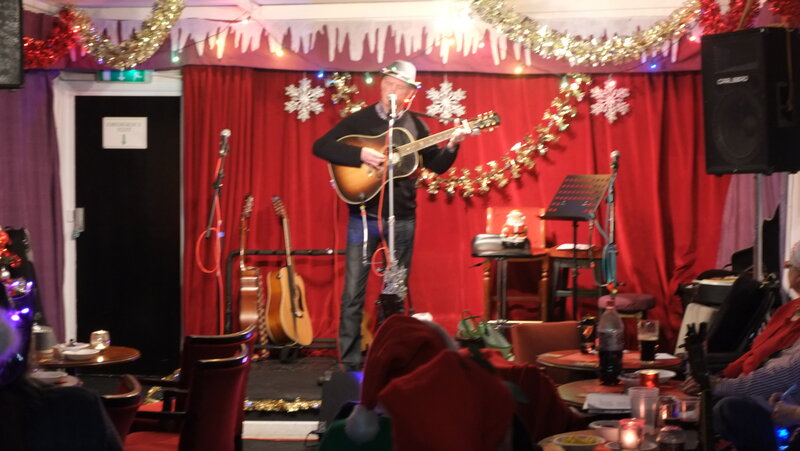 After Geoff, the mike was lowered for Mr Chris Birchall, who sang an un-dedicated Christy Moore version of Black is the Colour, using Penny’s six string. 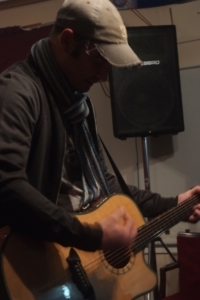 Goodnight folks, see you all later on today!! 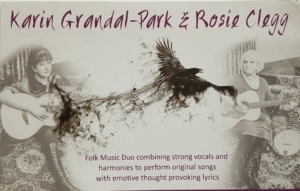 Will be with us on The 10th February 2017. 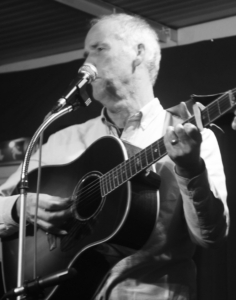 Get your tickets now!!! 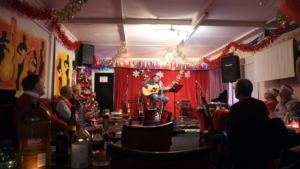 or pay £4.00 on the door. As we only have room for about fifty people, and we have over 35 going since Thursday, you need to reserve your ticket now. 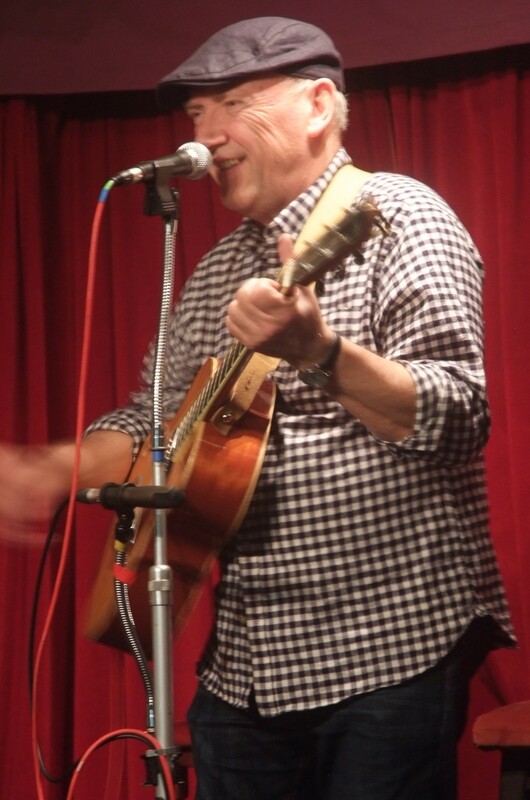 he was gambling to, he was using Penny,s favourite guitar! but he said it would be OK as long as she didn’t find out! 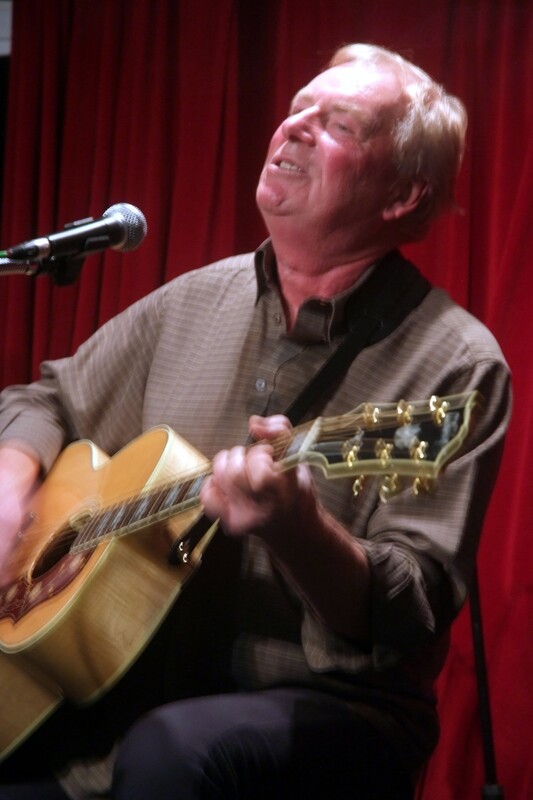 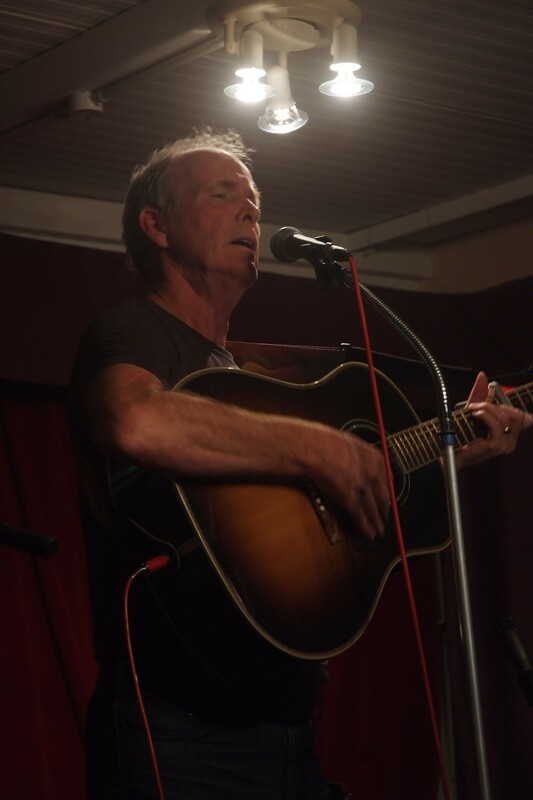 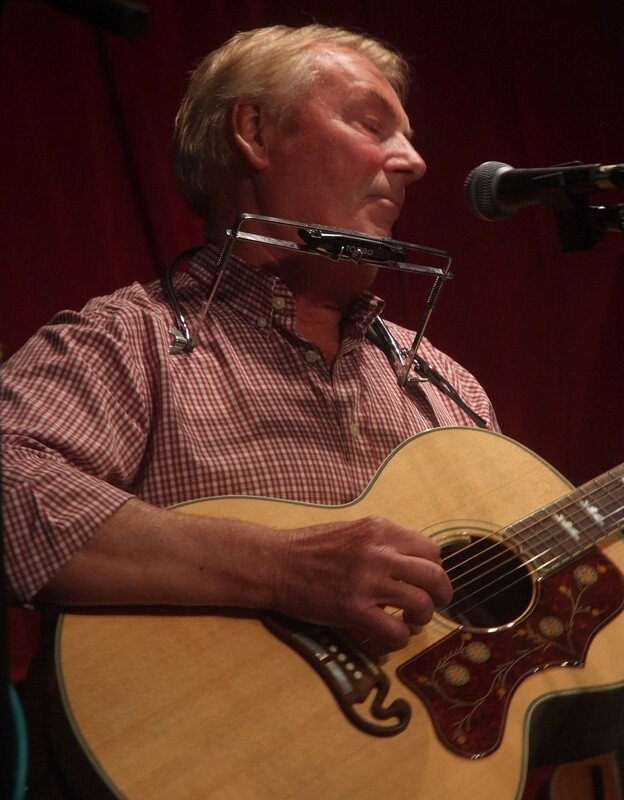 He started with a classic Dylan song, then went on to a Woody Guthrie song, about hardship on the farms in the west. 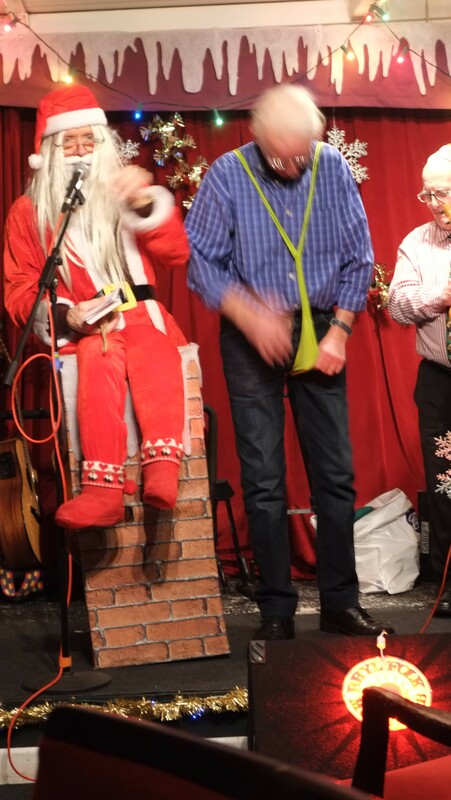 Terry came next, a lot of people were disappointed that he hadn’t worn his mankini, perhaps next week? Geoff Hollis then gave us a capella the late Cyril Tawney song The Grey Funnel Line. 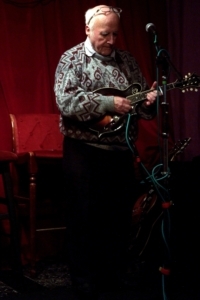 He then found his guitar, (and Tom on his Mandolin) and sang the song made famous by John Wright, Black Clothes. 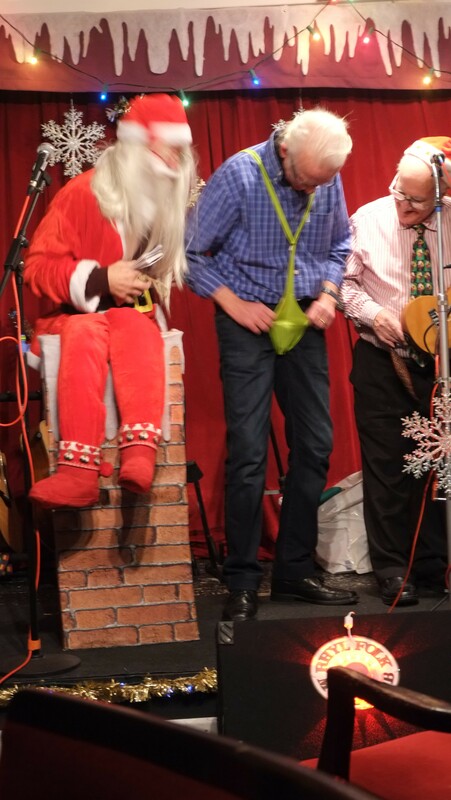 The raffle was next, surprisingly Linda didn’t win, she was one number out! singing Carolina Star, and the Peter Ronin song, Sitting on top of the world. 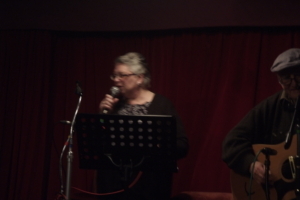 and finished with Older Ladies. 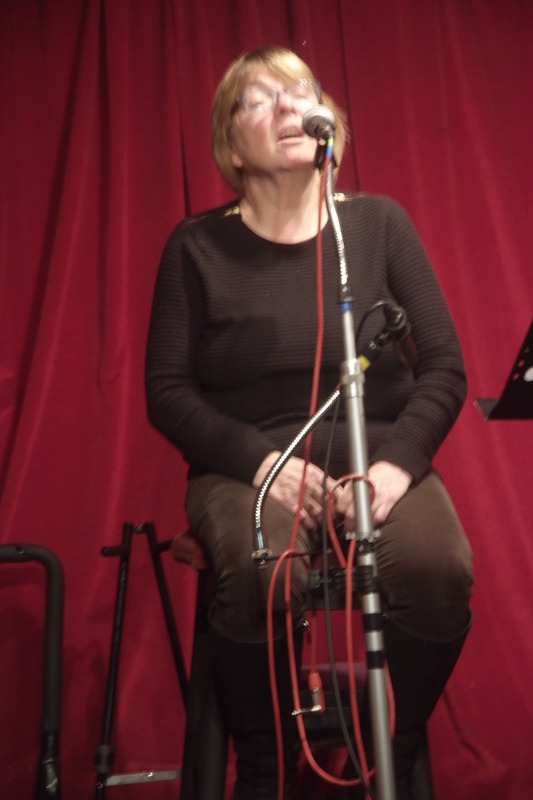 and did a song with a lot of donnas in it, probably called Donna Donna Donna, she then sang the Melodious Lark Song, and we all joined in on the chorus. Richard and Tom finished with City of New Orleans, and The Games people Play. 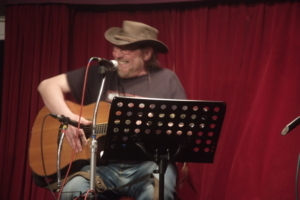 Terry then came back on and also sang a couple of love songs he often sang to Vera, Put Another log on the Fire, and T for Texas. 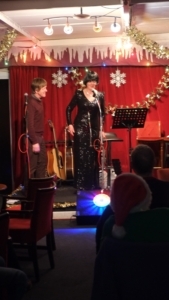 And Yes, Tom did accompany him. 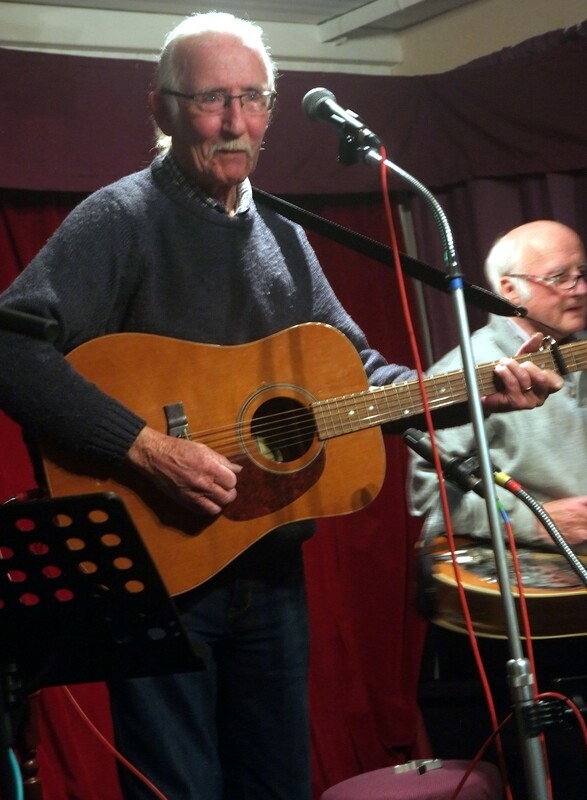 And finished with Pete Abbots Windy Harbour. Linda bought the night to a close singing Northern Plains, and the howling could be heared all over Rhyl. 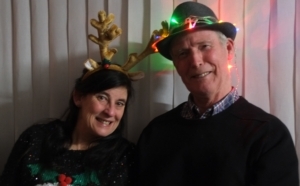 I don’t know what she’s doing to make him smile. 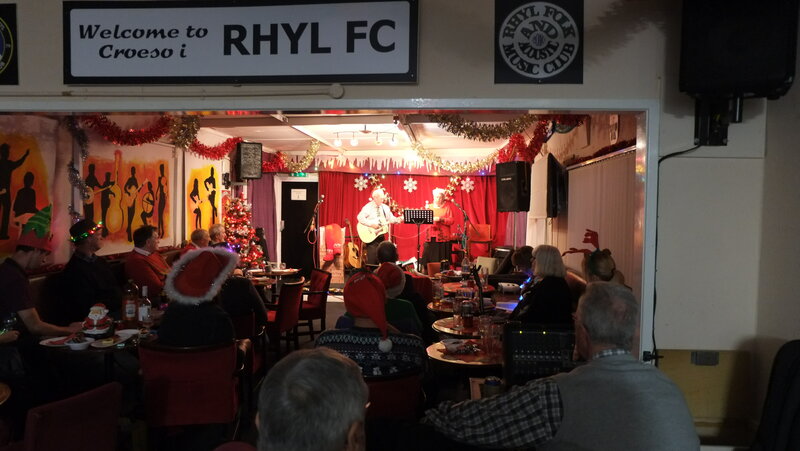 Remember No club night next Friday, next club night is 6th January 2017. 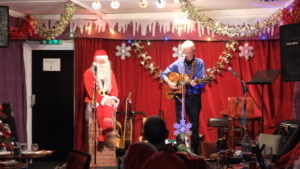 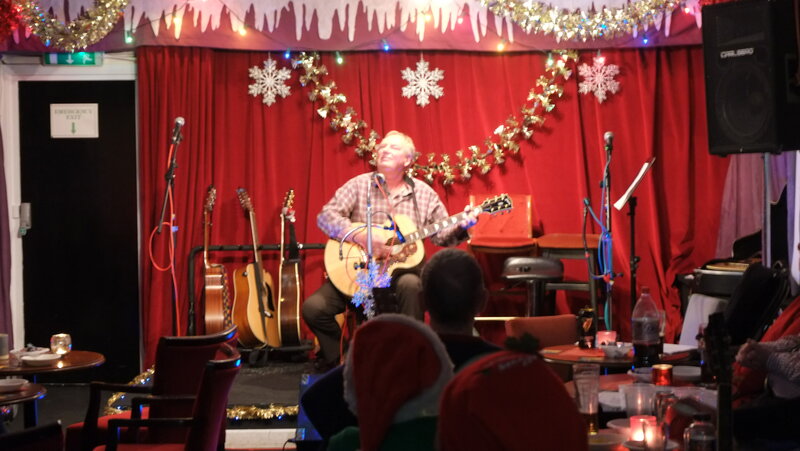 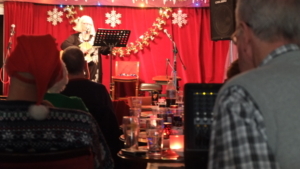 Have a happy new year from Rhyl folk and Acustic Club. 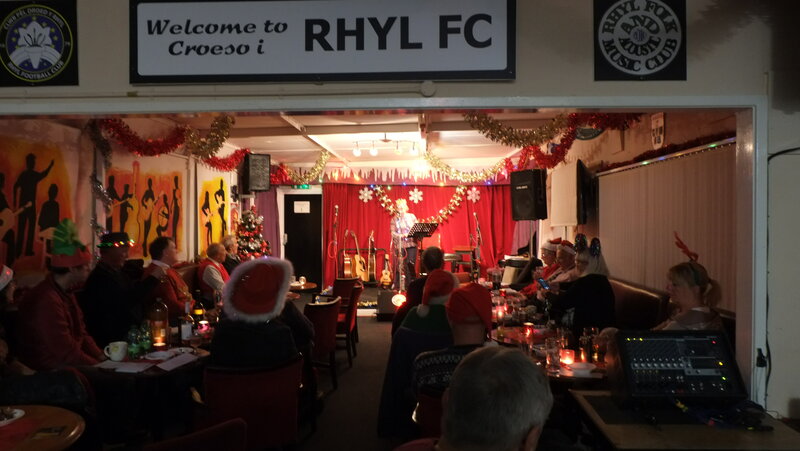 Well, the place looked transformed, some of our hard working regulars had spent a lot of time decorating the place ready for Christmas. 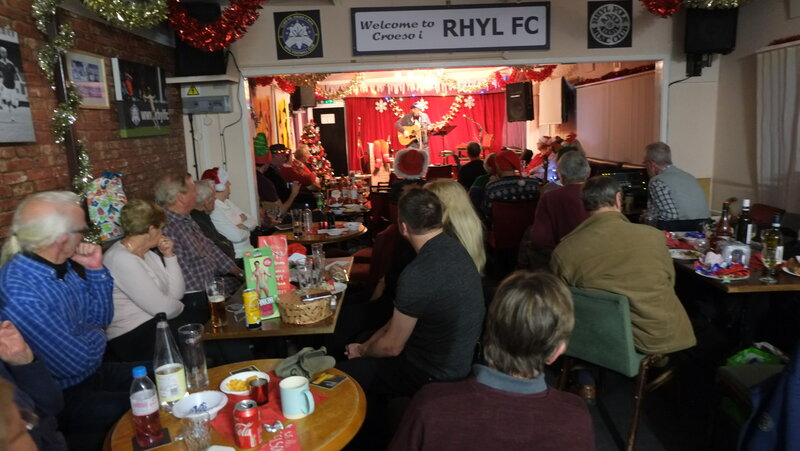 Don’t Forget it,s our Christmas party on the 23rd December, the club is providing the Smoked Salmon, Champagne and Caviar, so if everyone just brings some tasty nibbles, (NOT MINCE PIES OR BUTTYS) we should be OK. 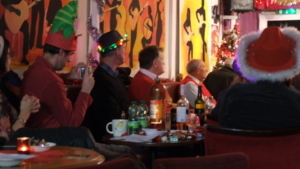 Being Friday, a lot of our regulars were at Xmas partys, but there was still enough of us to have a really good night. 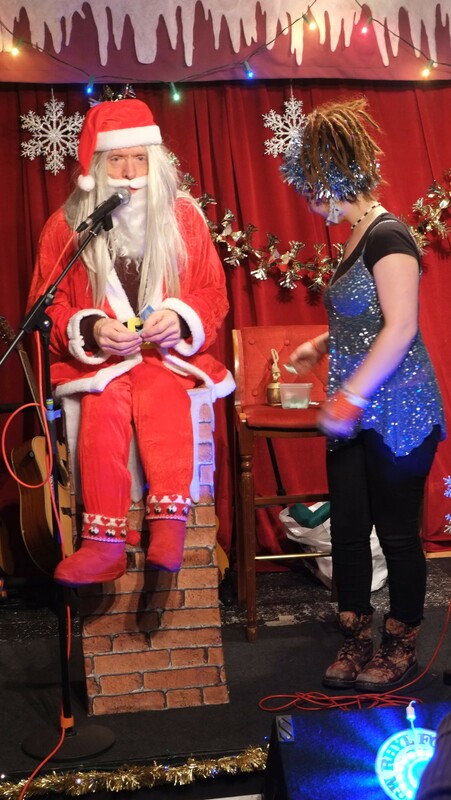 when we finally arrived!!! 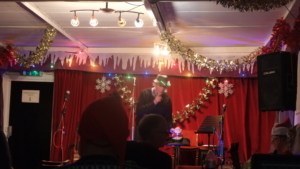 everyone was enjoying a fairytale of New York, or rather Kevin singing the Pogues / Christy MacColl Christmas classic. 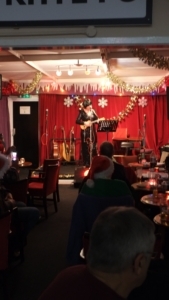 he finished his first set with a saw doctors song. 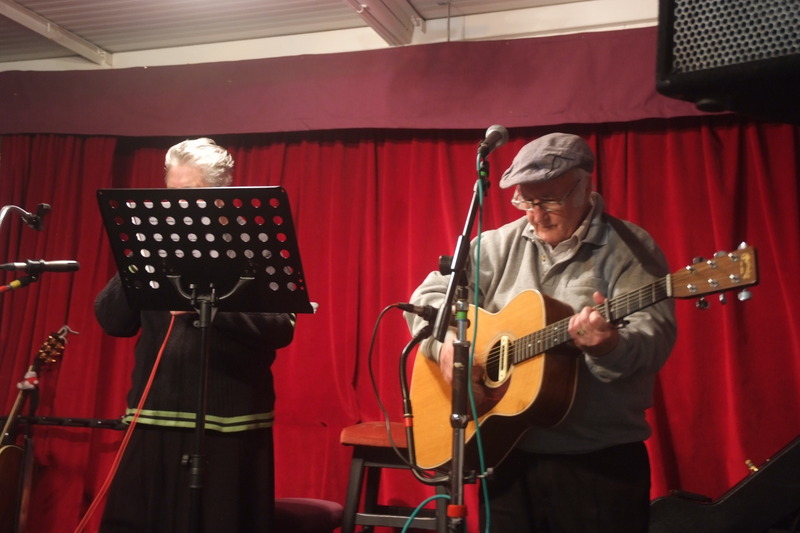 No Richard Tonight, so he missed her finishing with Edwina Hayes What Happens Now. 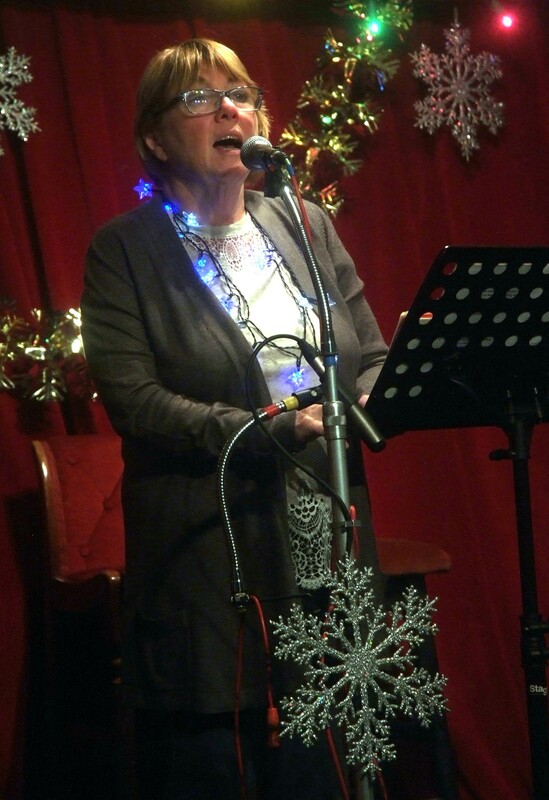 They started of getting us straight into the Christmas spirit with Mary Don’t you Know, and then Rocking around the Christmas tree. 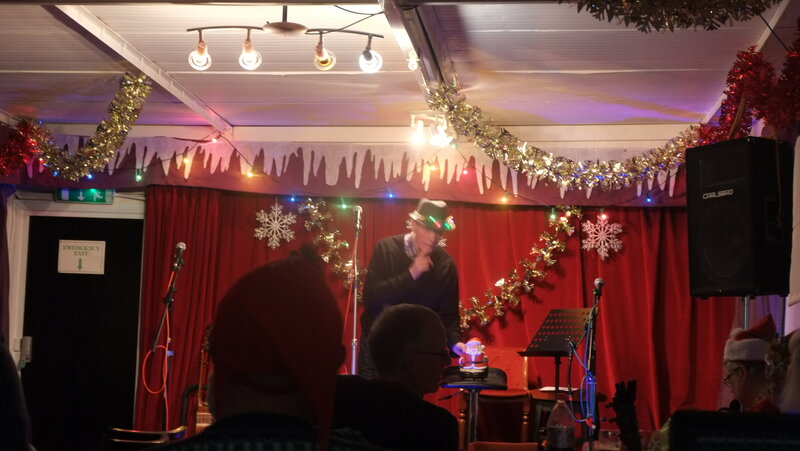 by singing While shepherds Wash their Socks by Night, we were then in for a community singing treat…..
We all had to join in on the chorus of Sweet Bells, and we were all given copy of the words, so we would get it right. 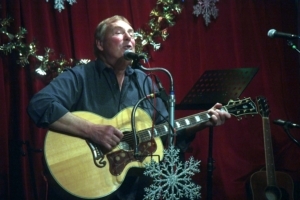 then with the James Taylor / Carol King classic You’ve Got A Friend, and finishing with Willy Nelson’s Angel Flying To Close To The Ground. 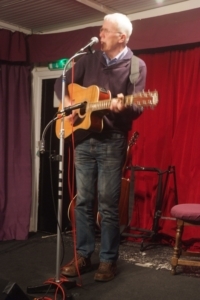 Kevin started the second half, with Dougie McLean’s Down TooDeep. 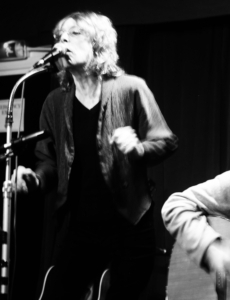 ( This life has torn the ground from underneath your feet. And I can’t reach you, you‘re down too deep) the words and kevins delivery of them makes this one of his best songs. 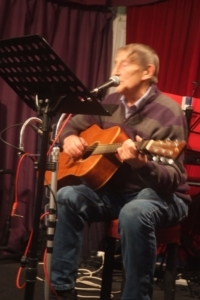 he also did ‘One hand on the radio and one on the wheel‘ … Lyrics & Music: Bill Caddick and Pete Bond, and I’l be your baby tonight. 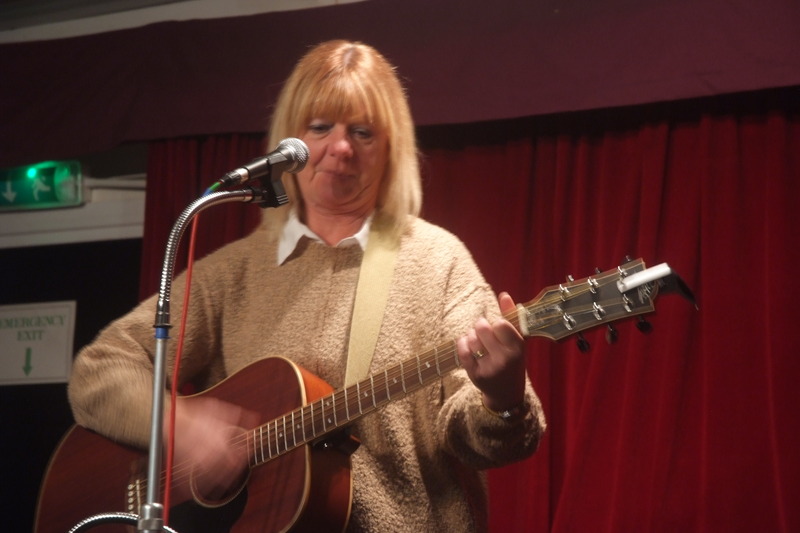 Wendy gave us the Tennessee waltz, and I want to Dance with You. 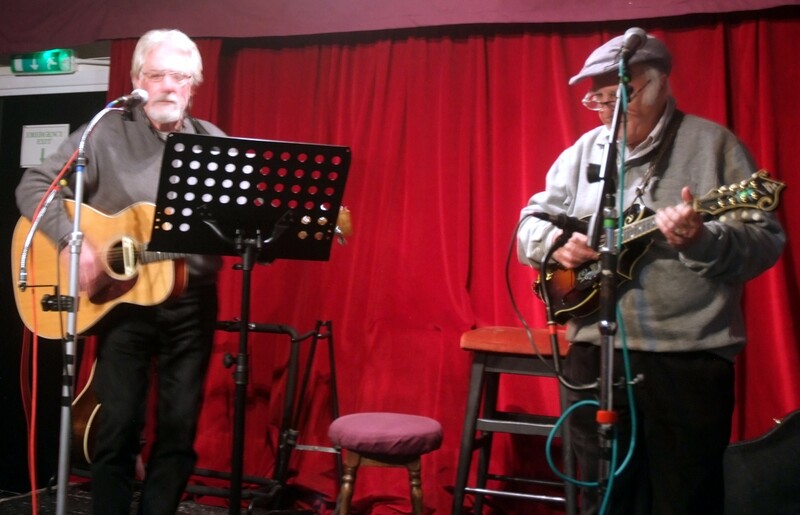 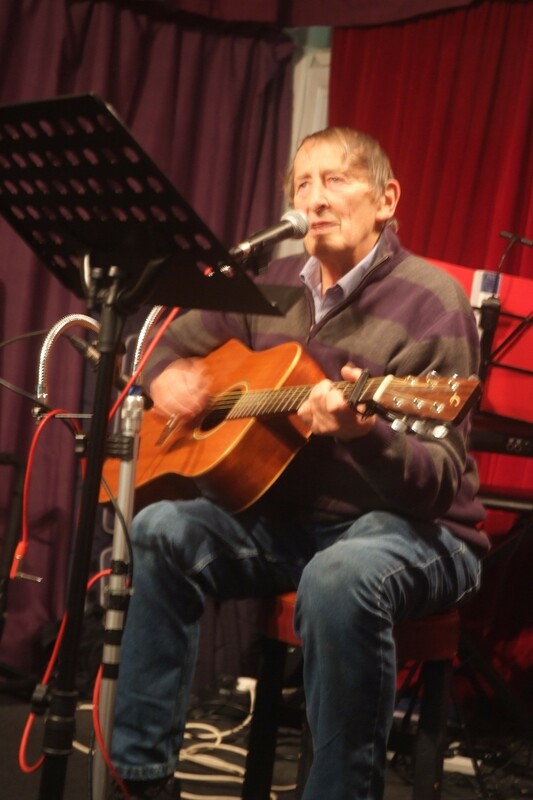 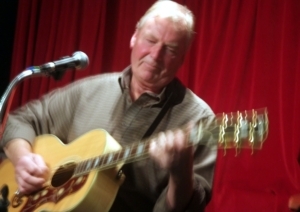 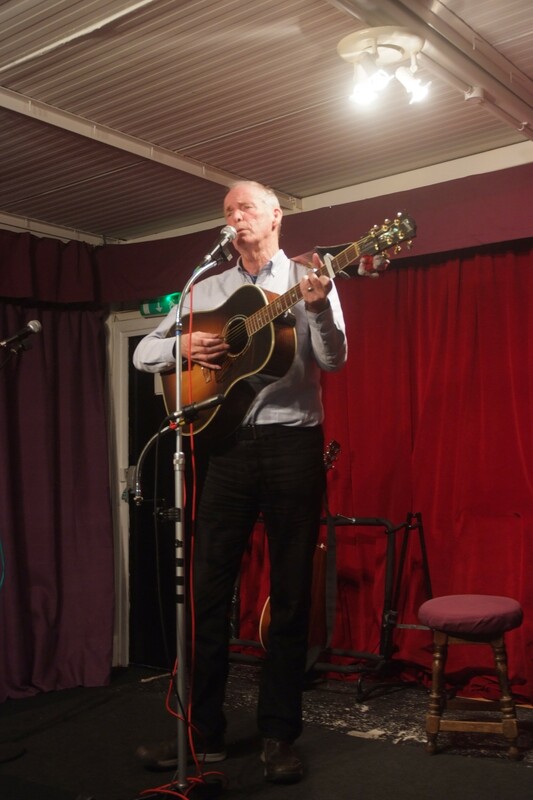 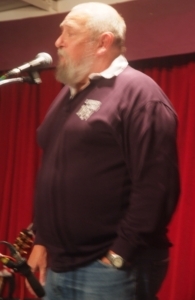 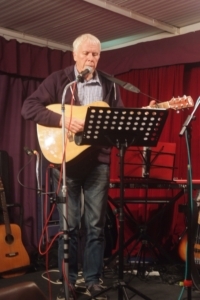 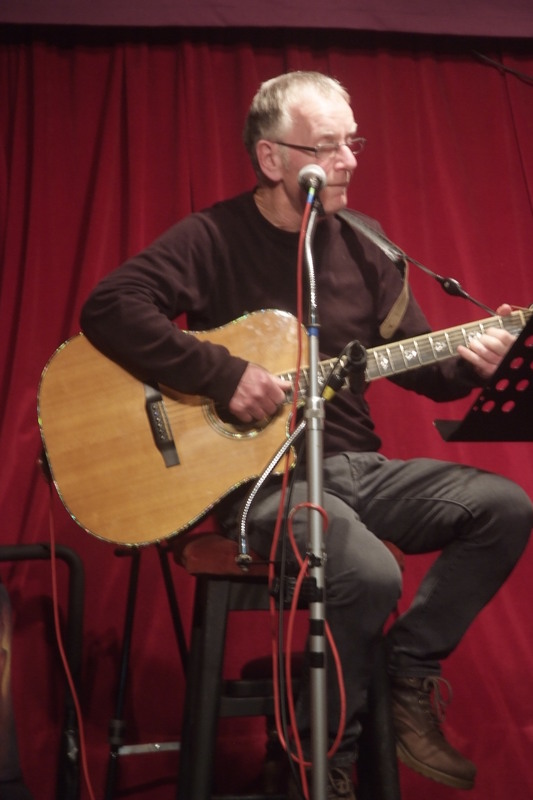 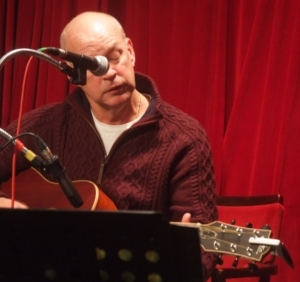 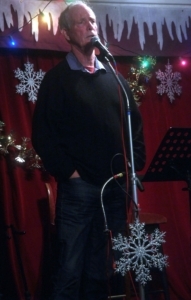 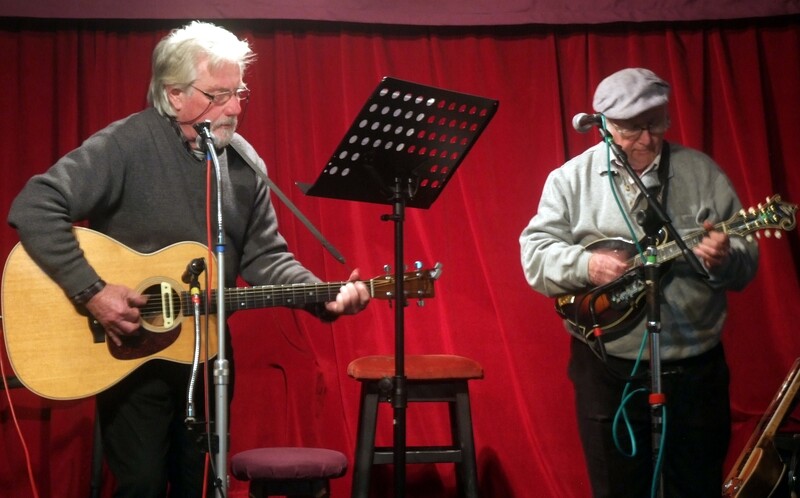 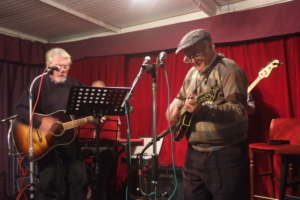 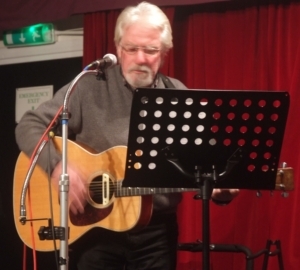 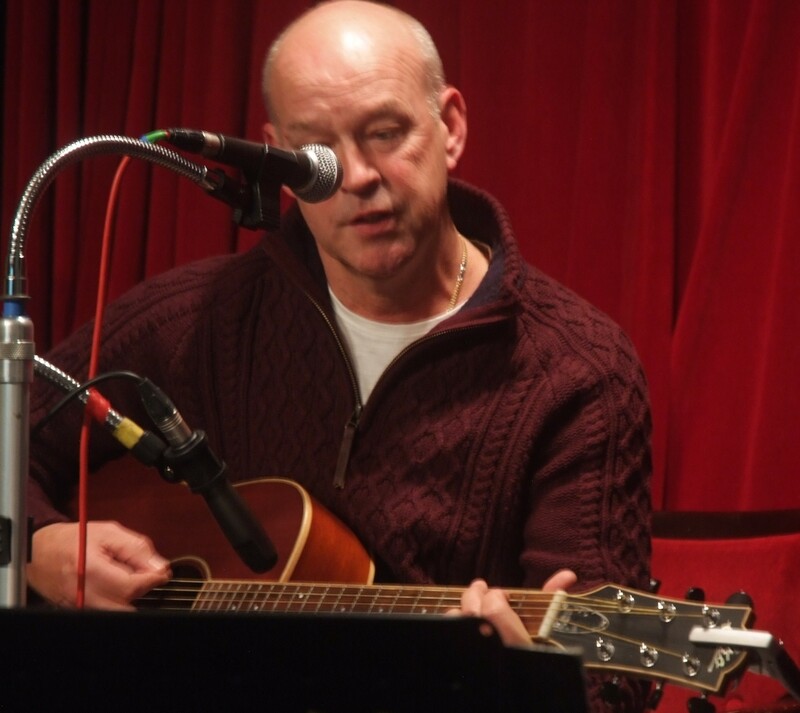 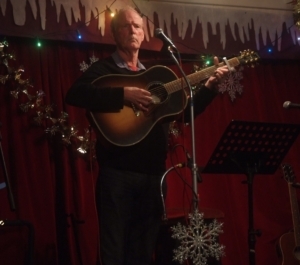 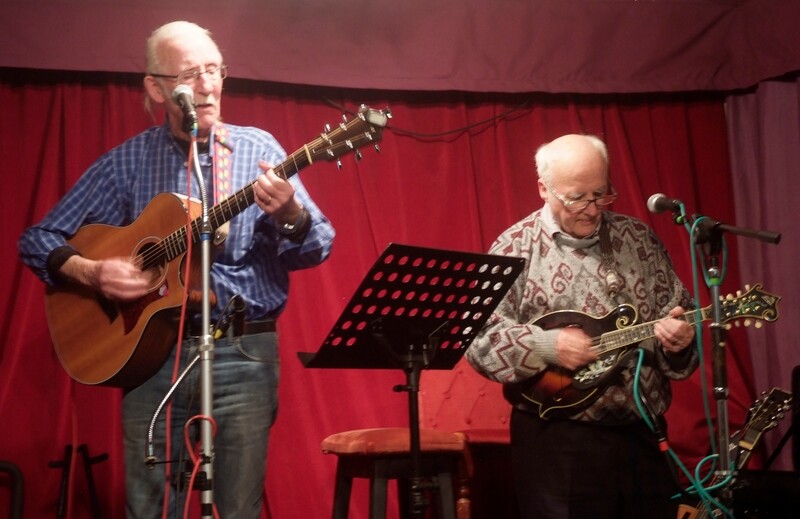 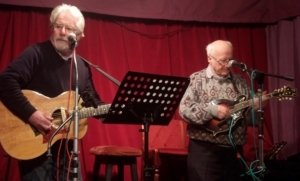 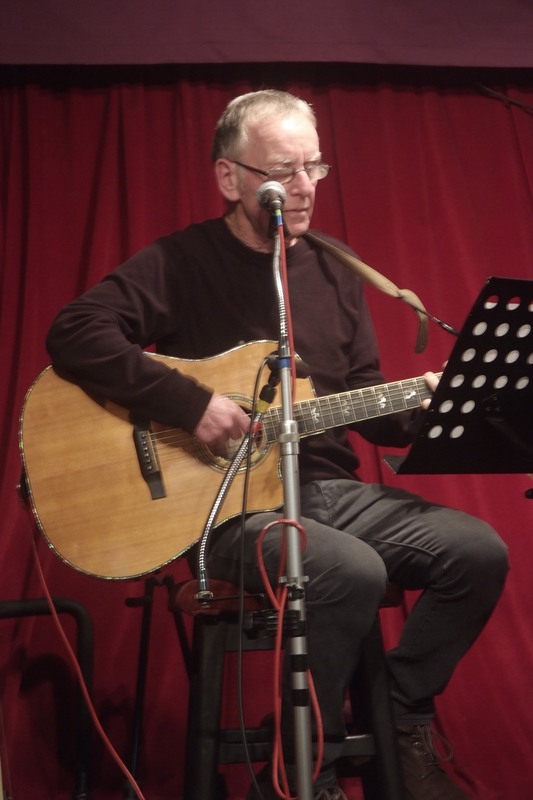 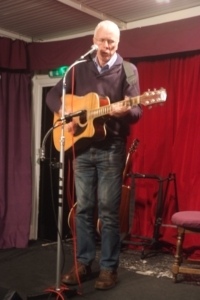 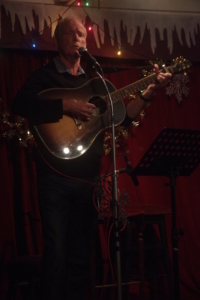 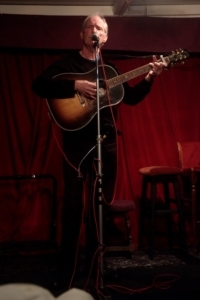 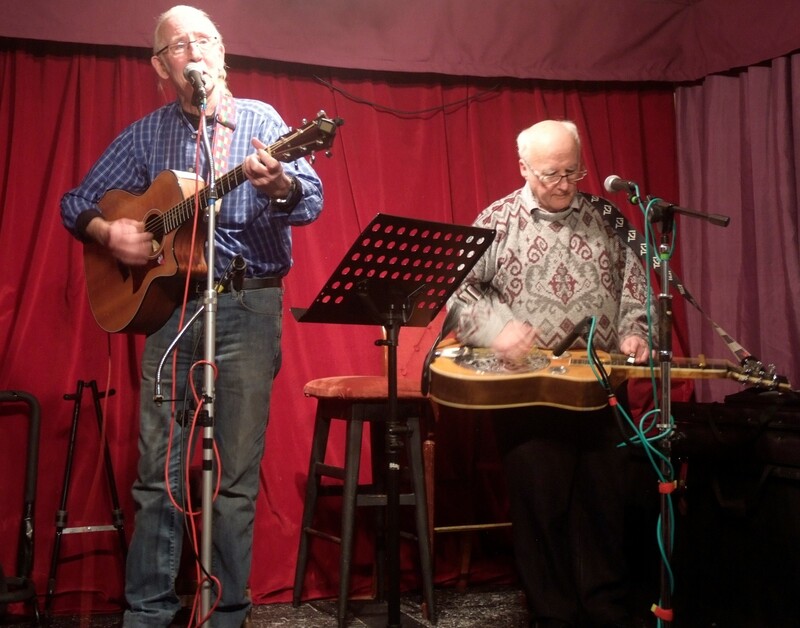 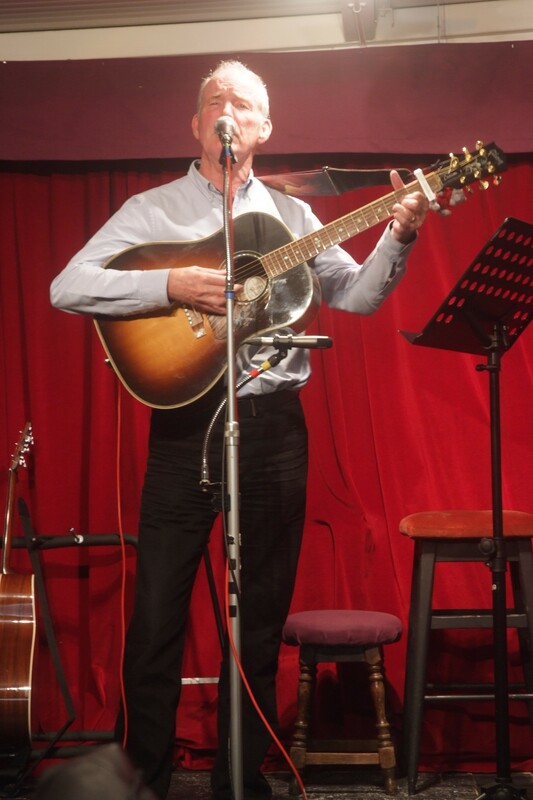 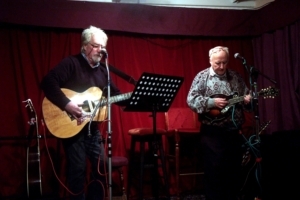 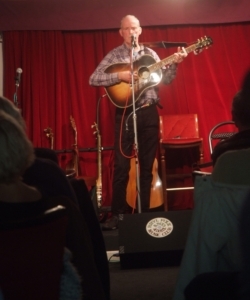 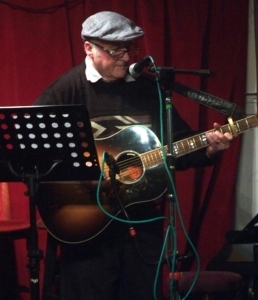 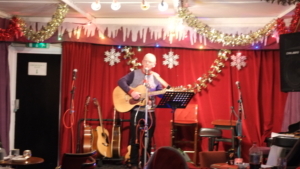 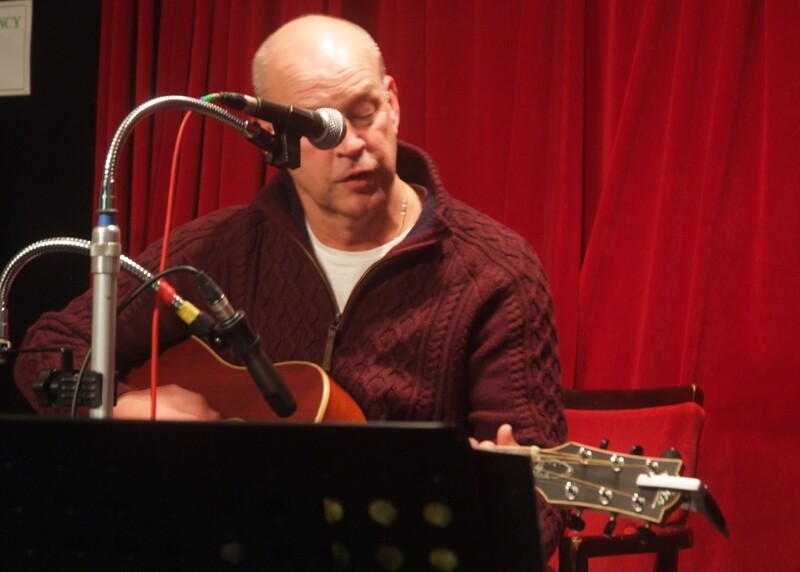 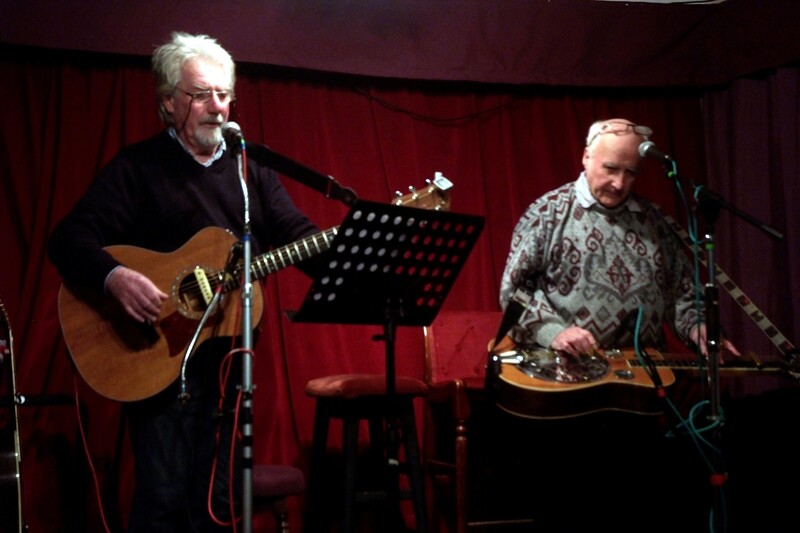 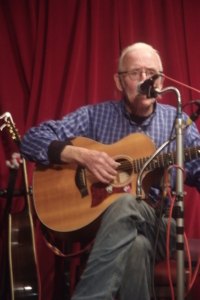 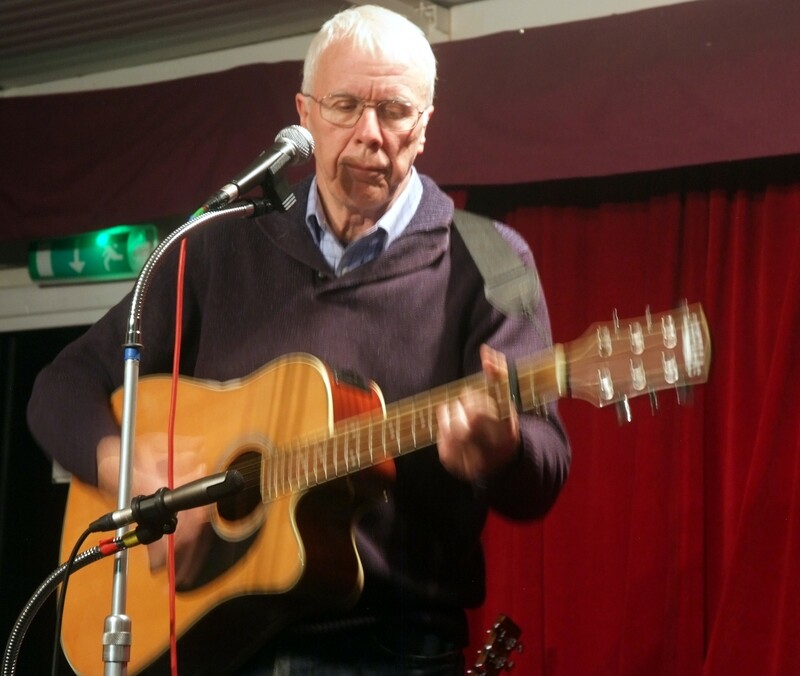 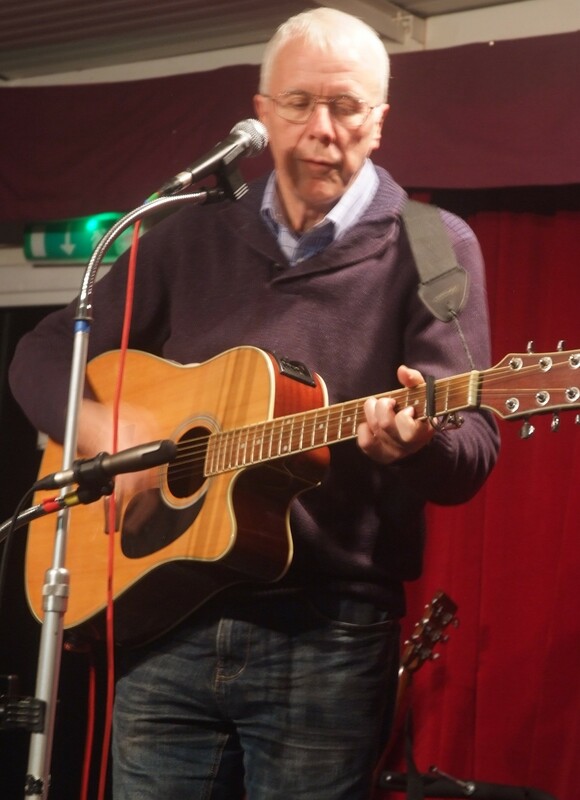 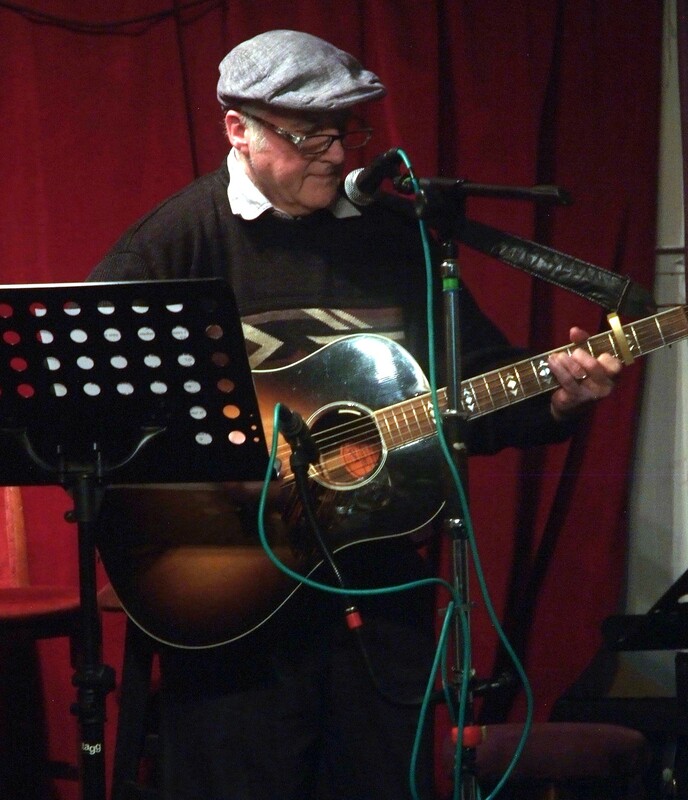 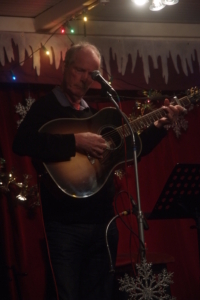 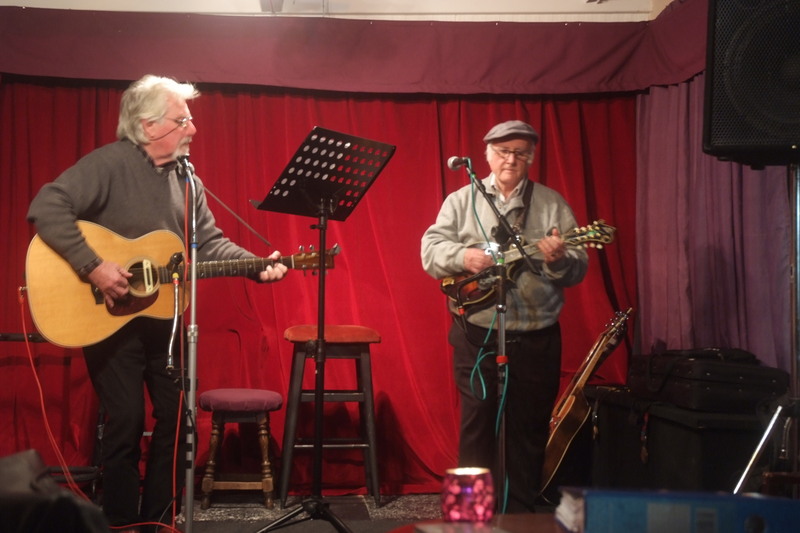 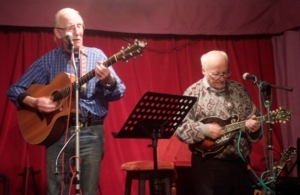 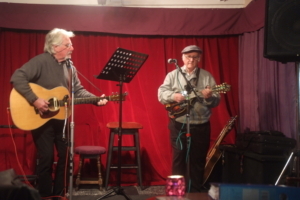 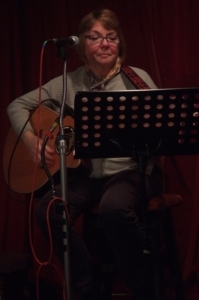 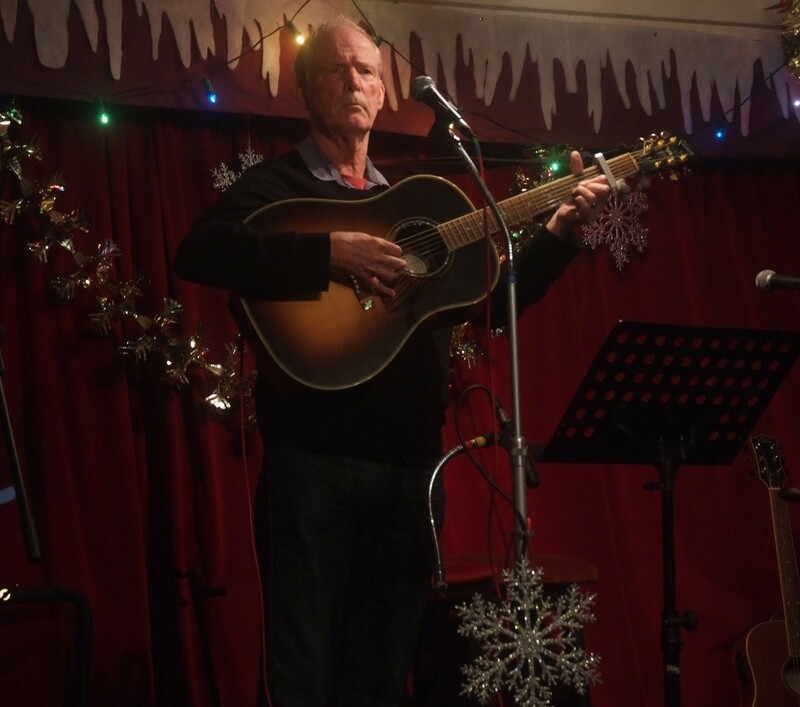 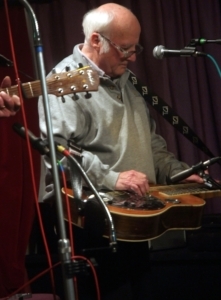 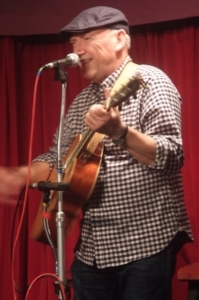 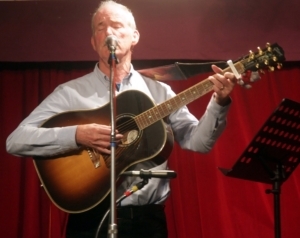 Geoff came back and sung a Keith Marsden song about the 1872 Morley mine disaster in Leeds. Tony Closed the night, with the Searchers, every time that you come in the room, and a rock medley to get us all bouncing in our seats! 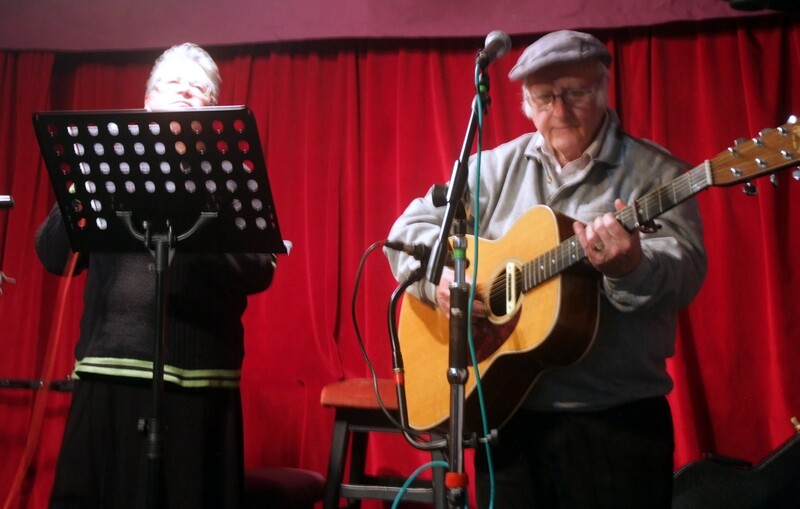 A good night, and a lot of tributes to the late and great Lenard Cohen, including Annie and Bobs version of Hey That’s No Way To say Goodbye, from 1967. 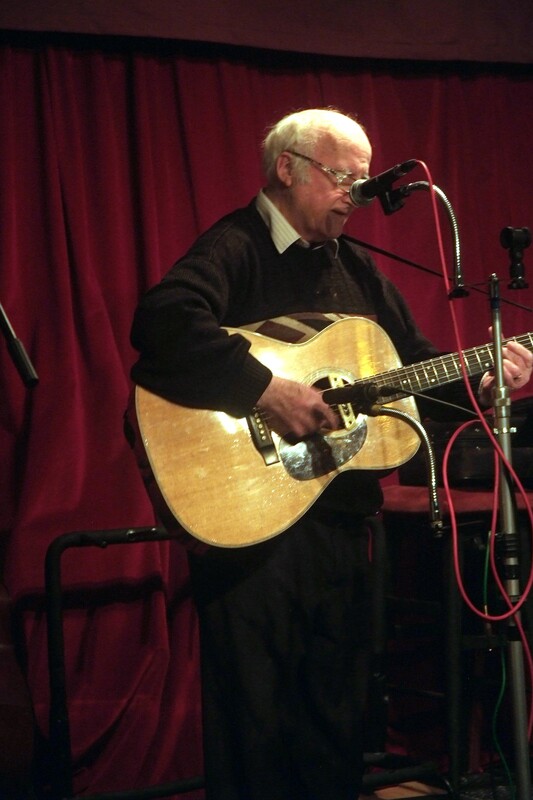 Here’s a track from his last album, released earlier this year at 82 years old. His music is timeless, listen to it while you look at the pictures from last Friday. Richard surprised us, he’s dumped his partner Wendy and gone solo! 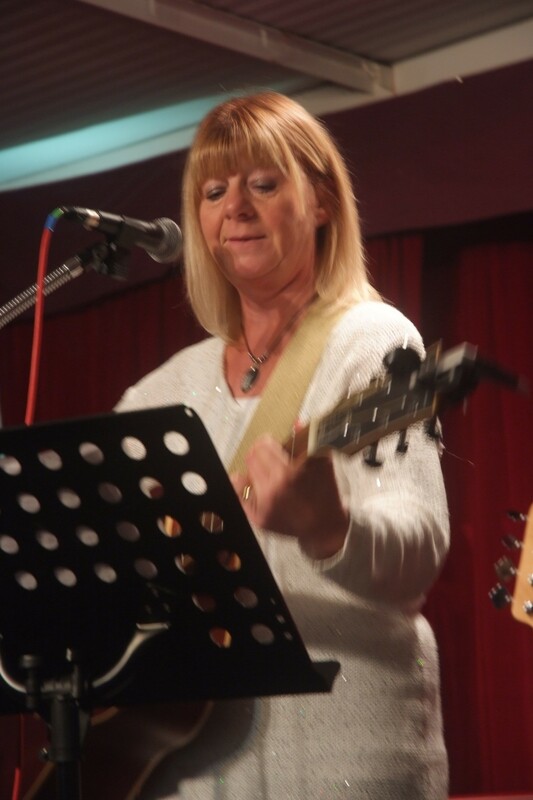 Never mind Wendy,I,m sure you’l manage by yourself! And Kevin with my favourite guitar. 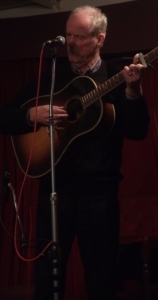 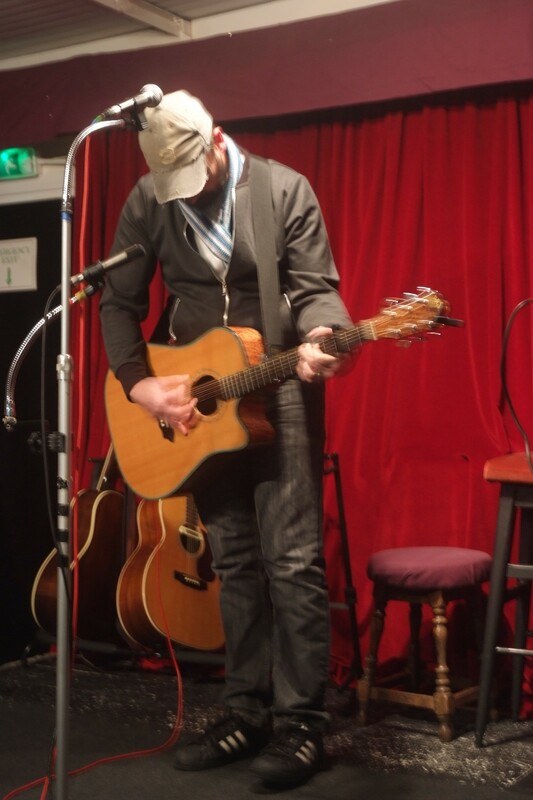 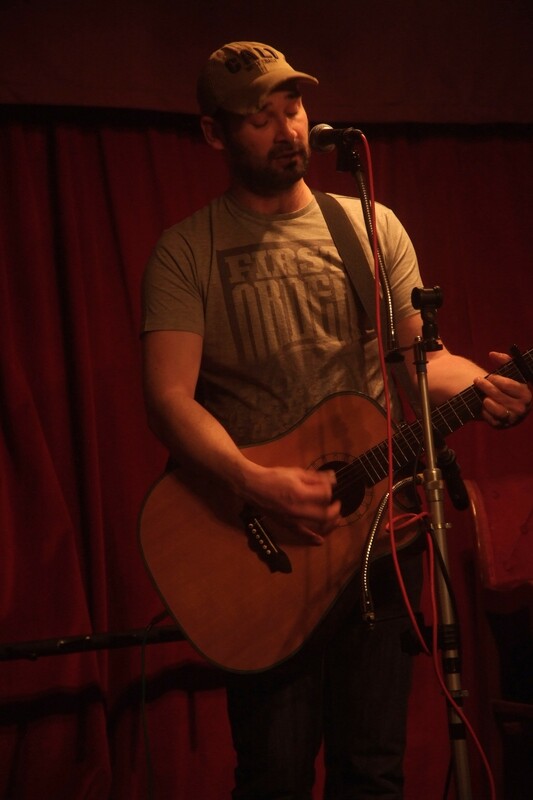 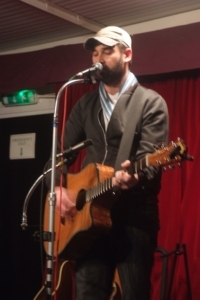 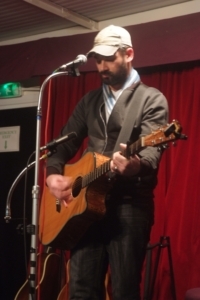 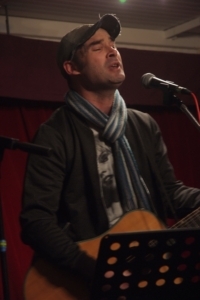 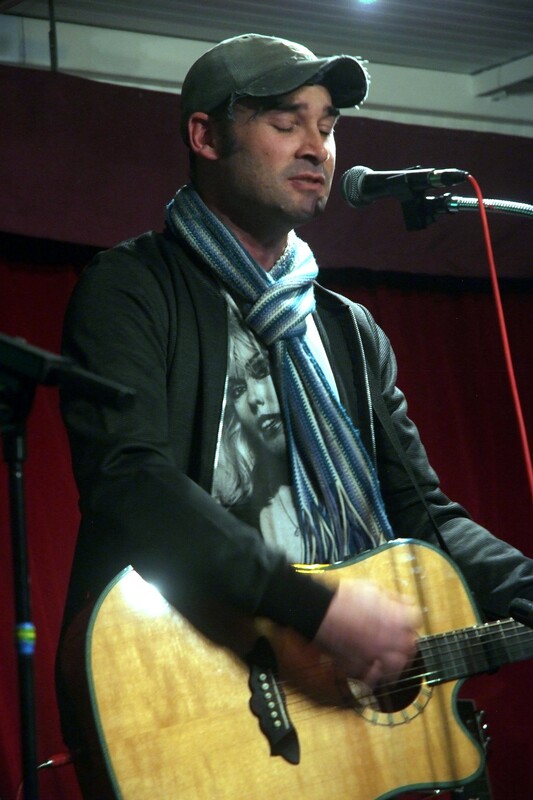 Tom Goodall, who sang his brand new song for us Second hand Rings, which sounds easily as good as his previous works. 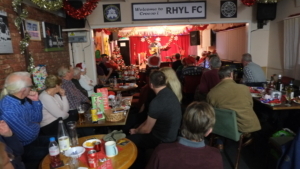 And not forgetting, Rhyl’s own BFG, Geoff Hollis, Who gave us a lot of favorites, including Stan Rogers The Lock Keeper, Bryn Philips Silver and Gold, and Cyril Tawny’s Grey Funnel Line. 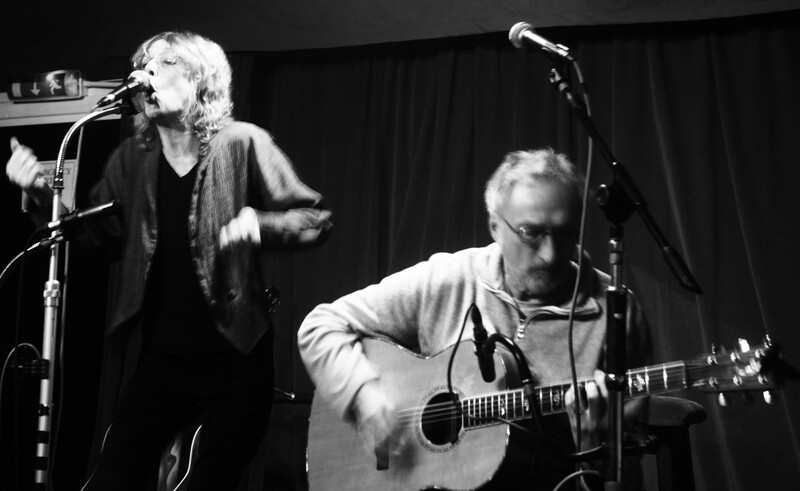 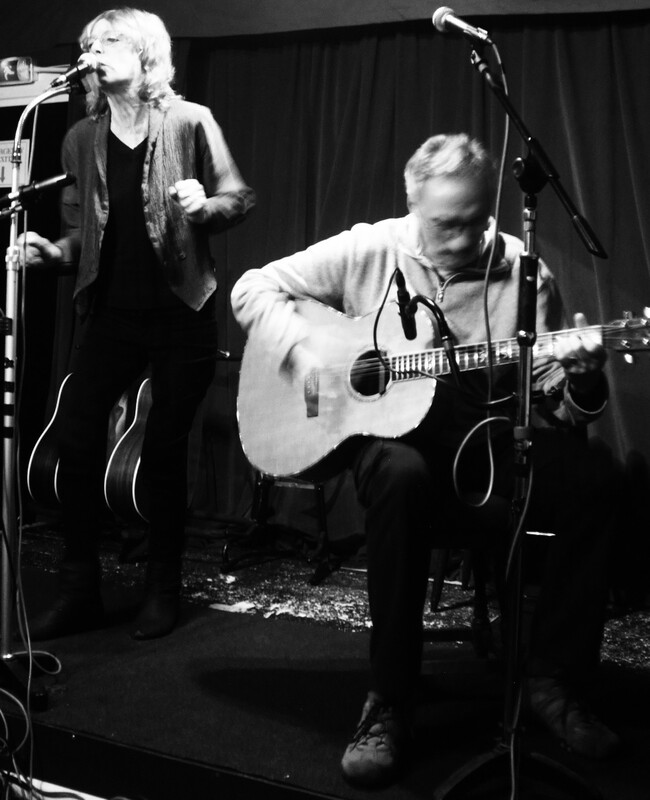 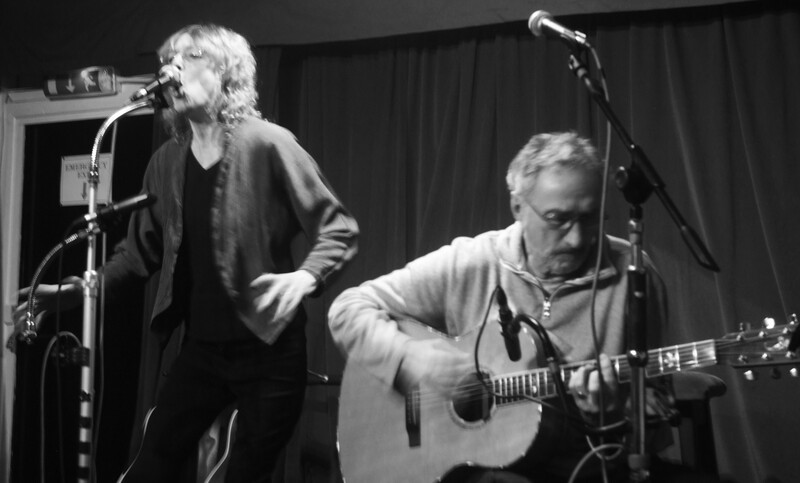 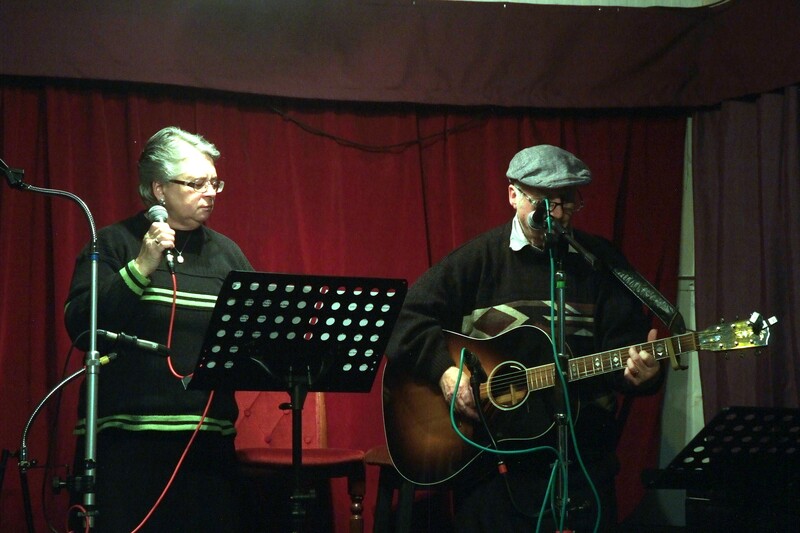 Annie and Bob closed the night for us with a song that came out when I was 10 years old, Bob Dylan’s It Ain’t Me Babe. 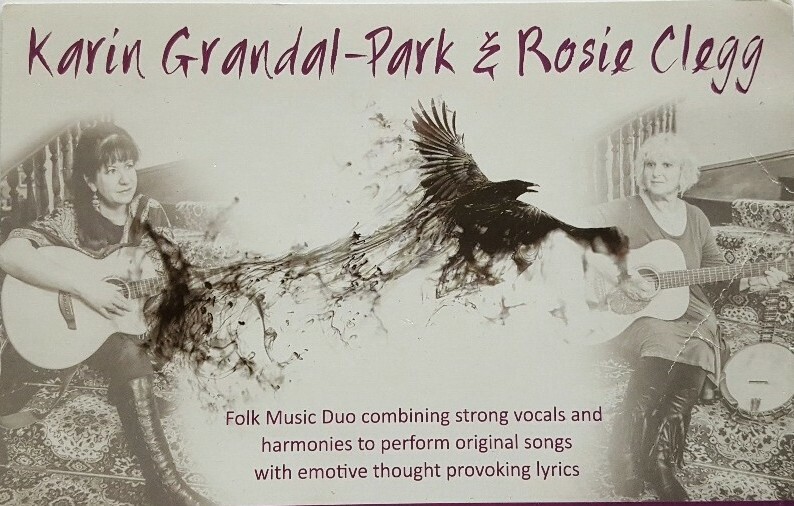 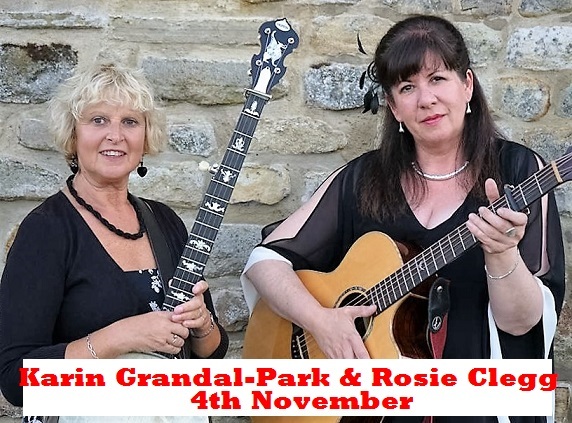 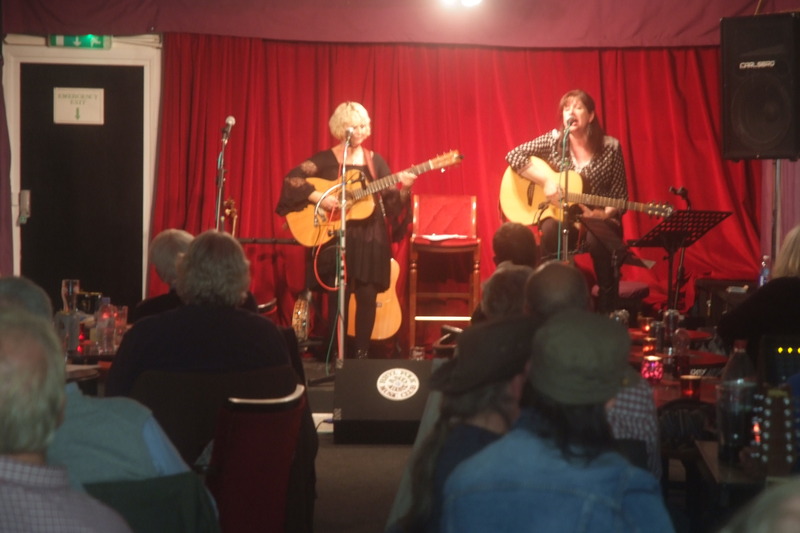 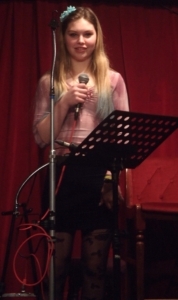 Special Guest Night with Karin Grindal and Rosie Cleg. 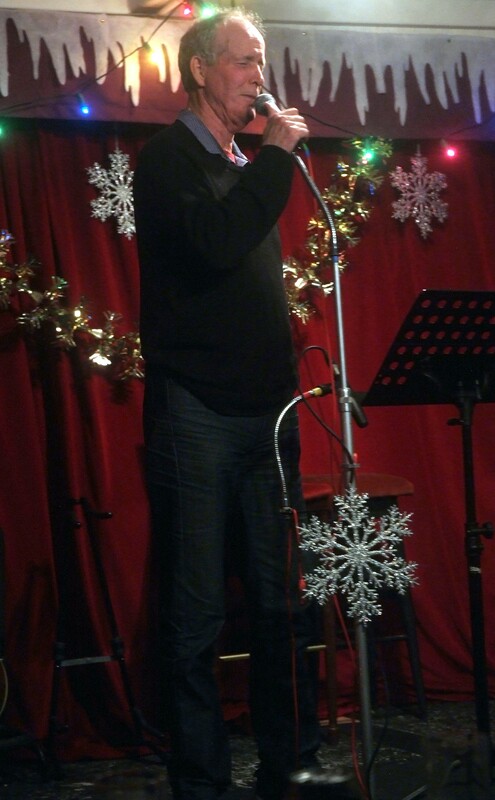 Twas brillig, and the slithy toves, did gyre and gimble in the wabe: all mimsy were the borogroves, and the mome roths outgrabe. “Beware the Jabberwock, my son, the jaws that bite, the claws that catch! 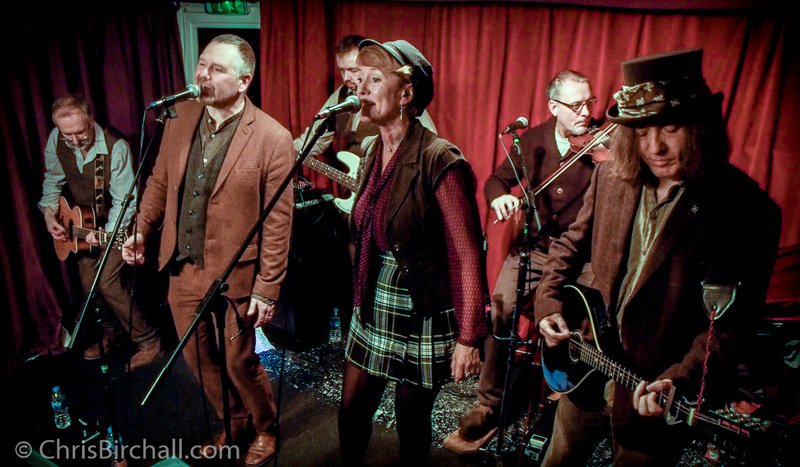 Beware theJubjub bird, and shun the frumious Bandersnatch!”…..
Ian,Gill, Gilly and Mick visit and entertain us every couple of months or so. 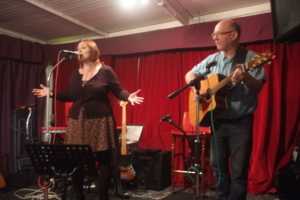 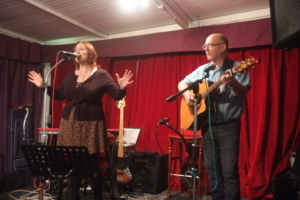 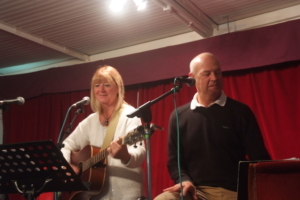 Another local duo that visit us, Dawn and Allan. 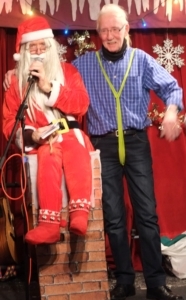 Also happened to visit on the same night! 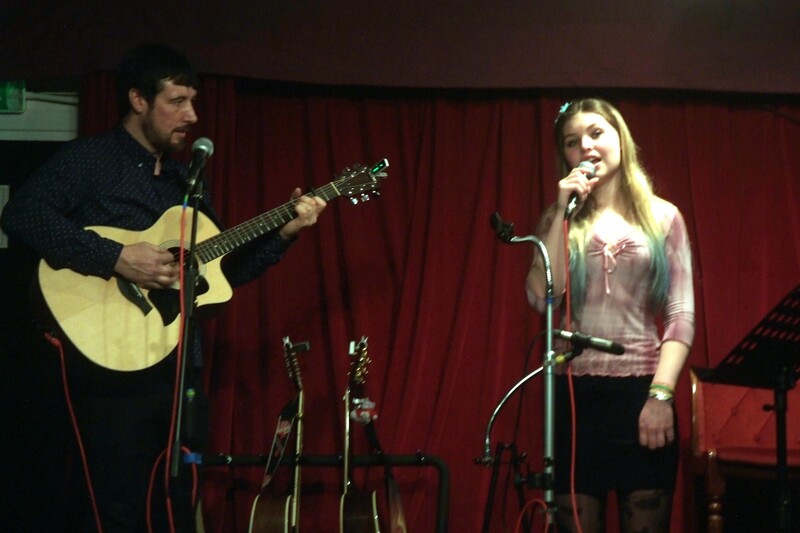 Finished their first spot with a lovely version of Run Away with Me. 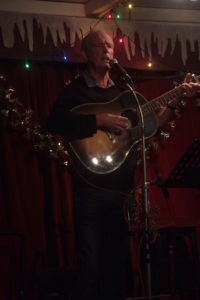 As for our regulars, Kevin sang a gill ladry song, followed by the classic John Wright, All the answers. 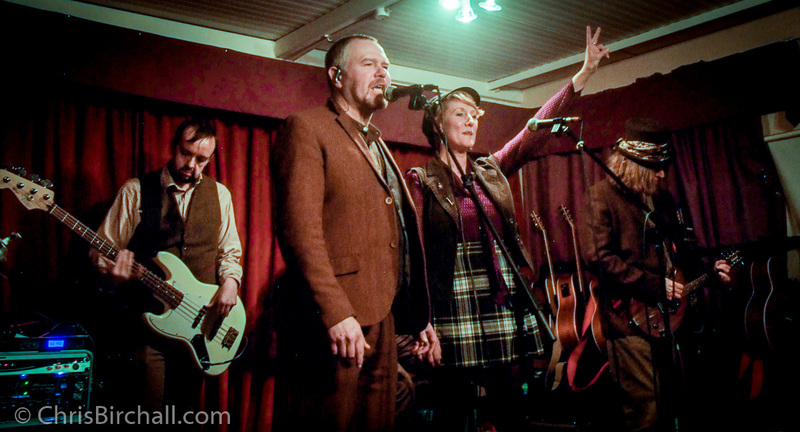 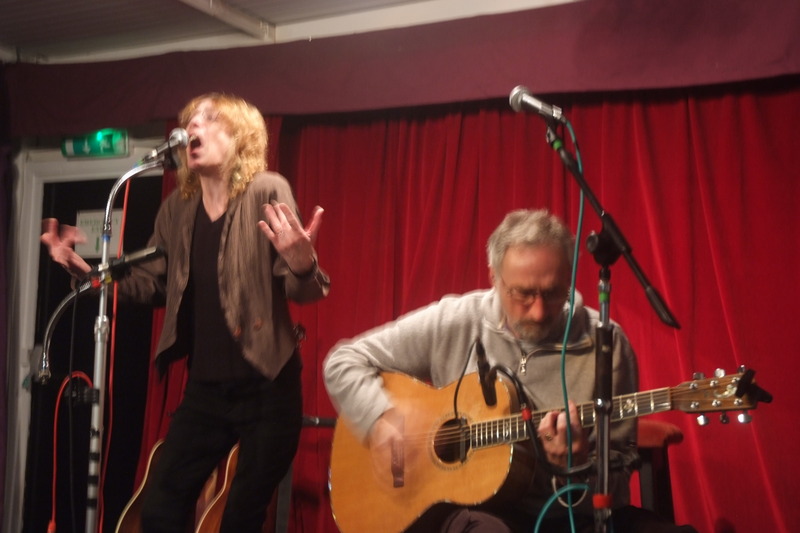 Wendy had us all crying singing about Hobo Billy’s Last Ride, (at least no one died in Geoff’s songs!). 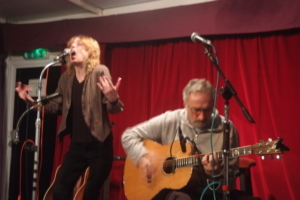 Wendy sang another Tania Tucker song, (no one died this time) and they finished with Doctor Hooks, “Who,s going to water my plants” etc. 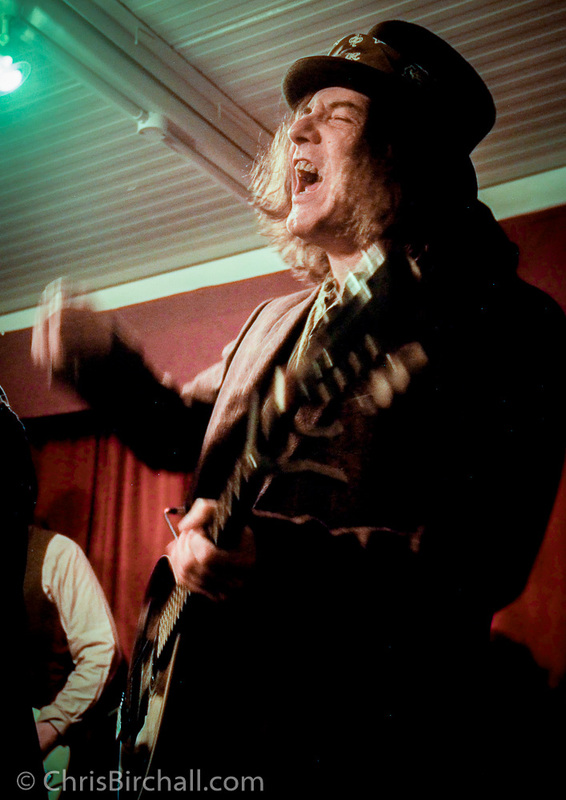 Jabberwocky finished the first half. 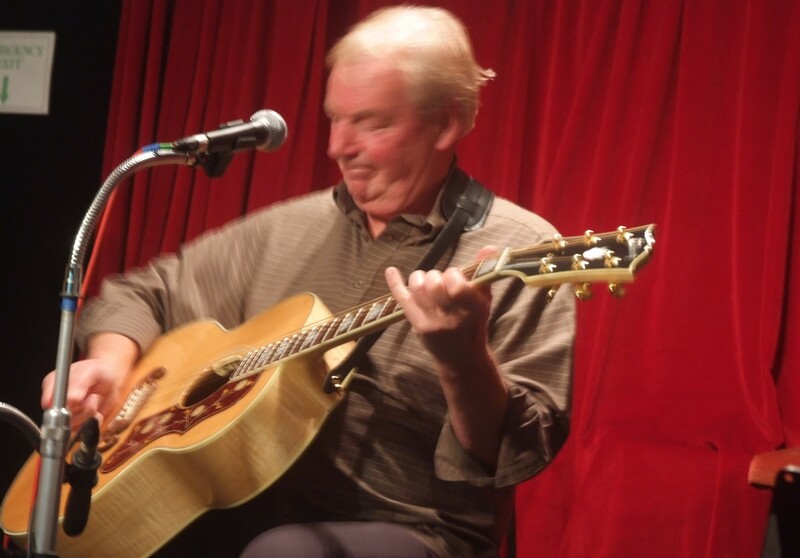 With the songs I Never New Love before, Van Morrison’s Moon Dance and Handbags and Glad Rags. 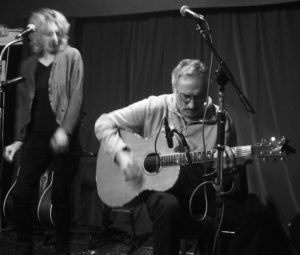 Linda and T om came back..
and started with Killing me softly, followed by a Mark Knoppler song, The Next Time I,m in Town, and finishing with waiting for the times to get better. John Taylor then sang for us a really good song about the miners strike in Barnsley. 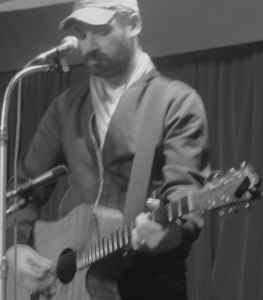 And gave us four more songs. 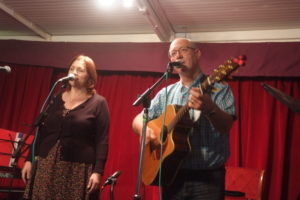 followed by Richard and Wendy, Who sang Crying Time and I wish it would Rain. 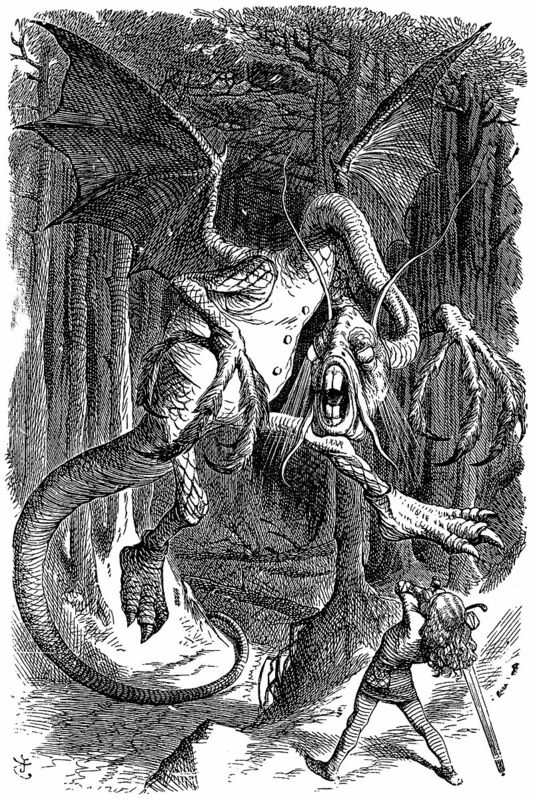 And as in uffish thought he stood, The Jabberwock, with eyes of flame, Came whiffling through the tuggley wood, and burbled as it came. 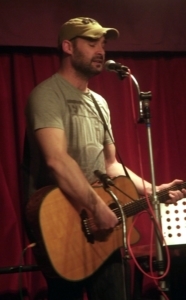 One two! One Two! 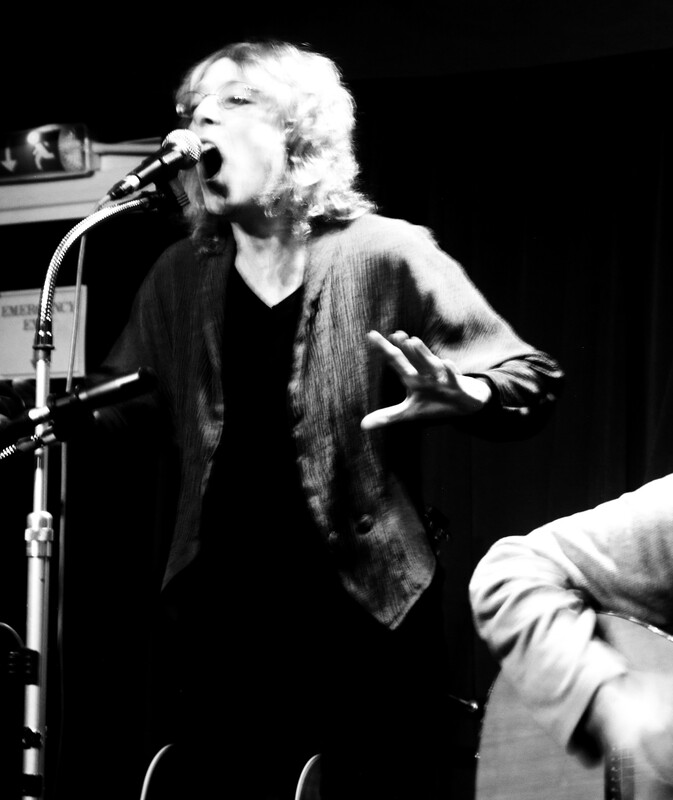 And through and through. 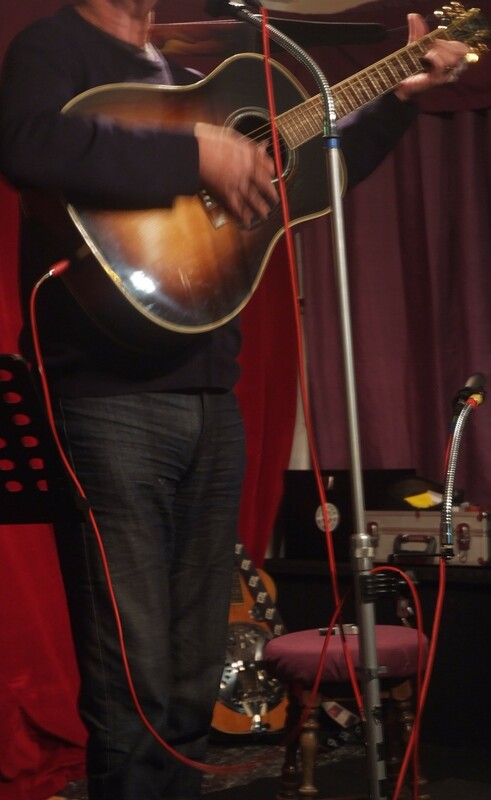 The Vorpal blade went snicker-snack! 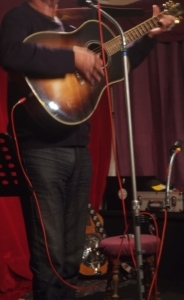 He left it dead, and with its head, He went galumping back. Don’t forget, next week is guest night, be early!!! 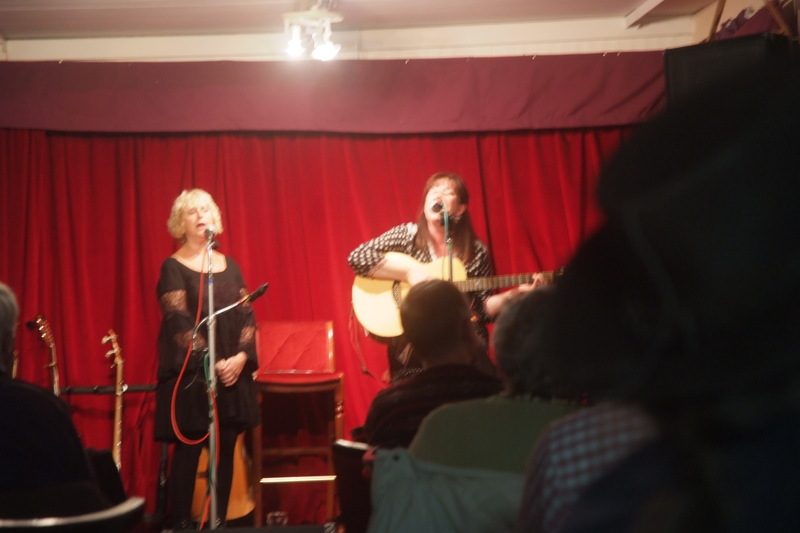 Really looking forward to seeing Edwina Hayes next year,but as I have been listening to Wendy singing the songs for so long, I will probably prefer Wends versions! 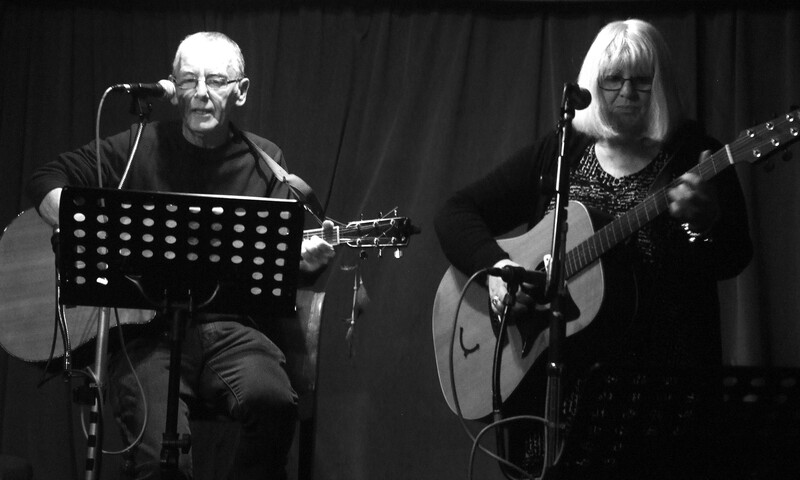 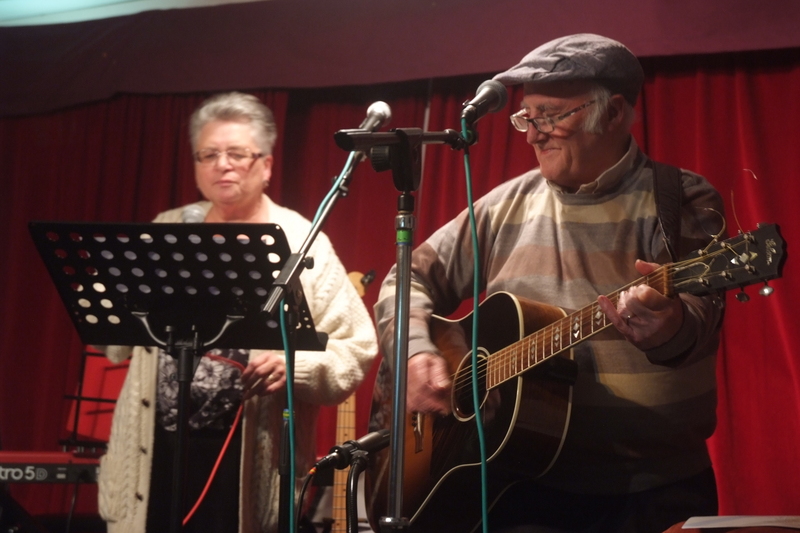 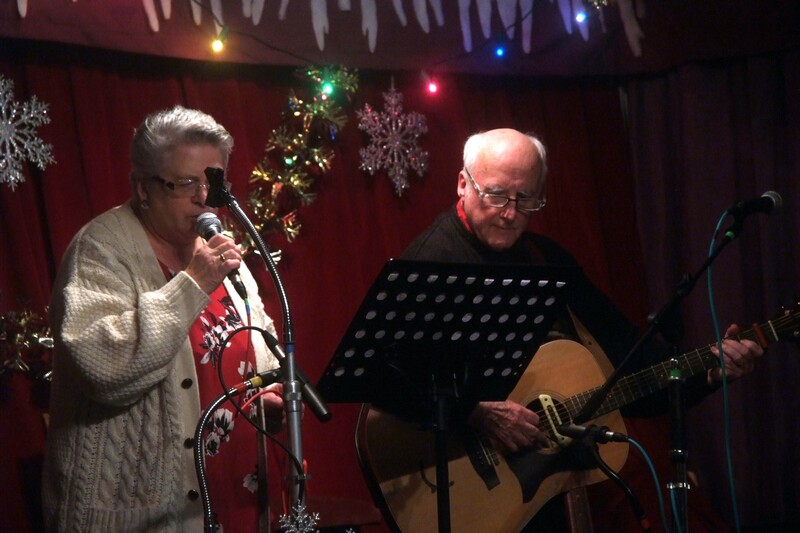 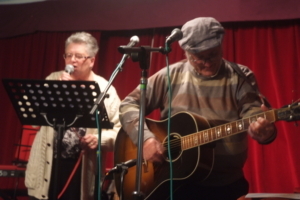 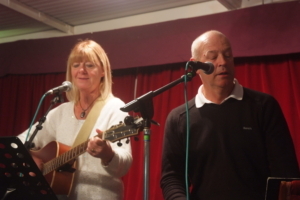 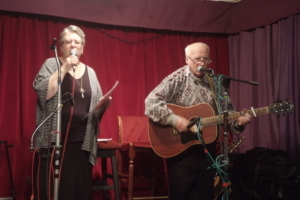 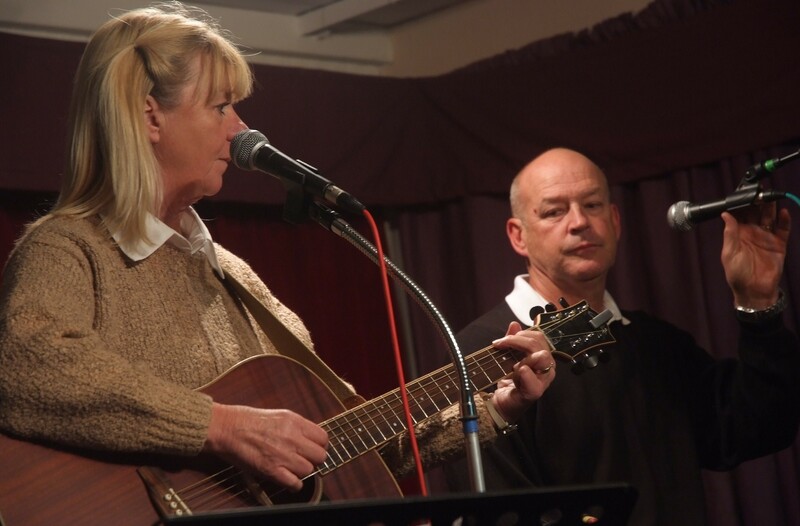 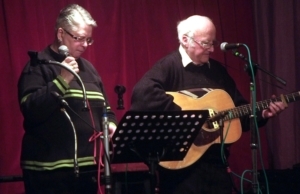 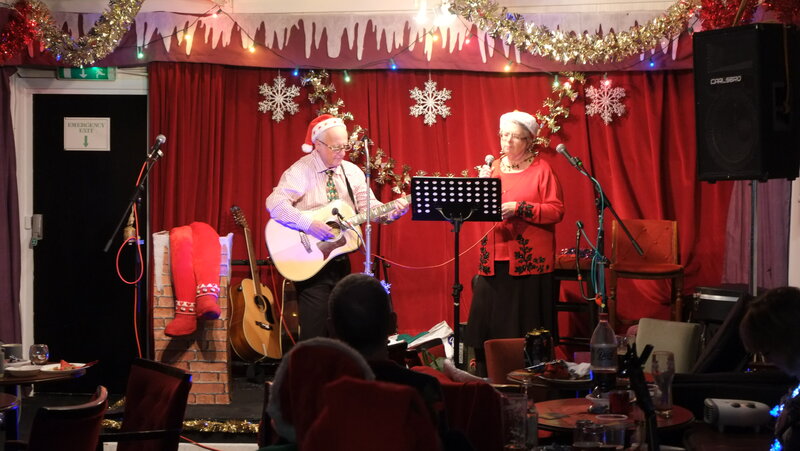 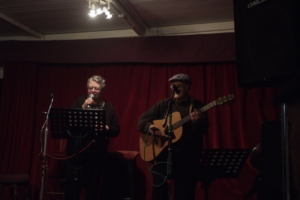 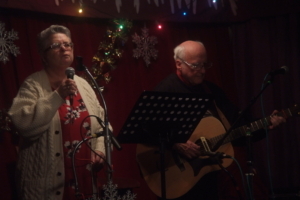 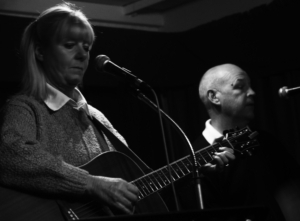 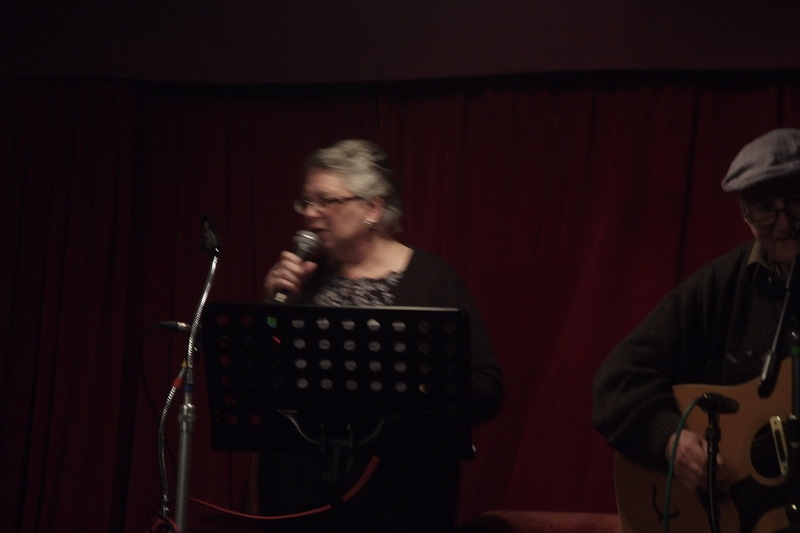 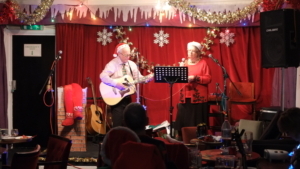 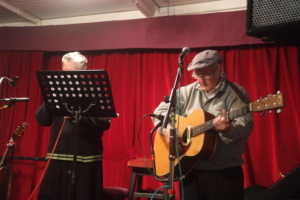 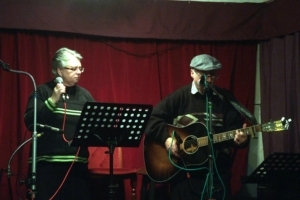 Next we had The Singing Degneys, (Tom and Linda) to entertain us with anew song, (I forgot the title!) 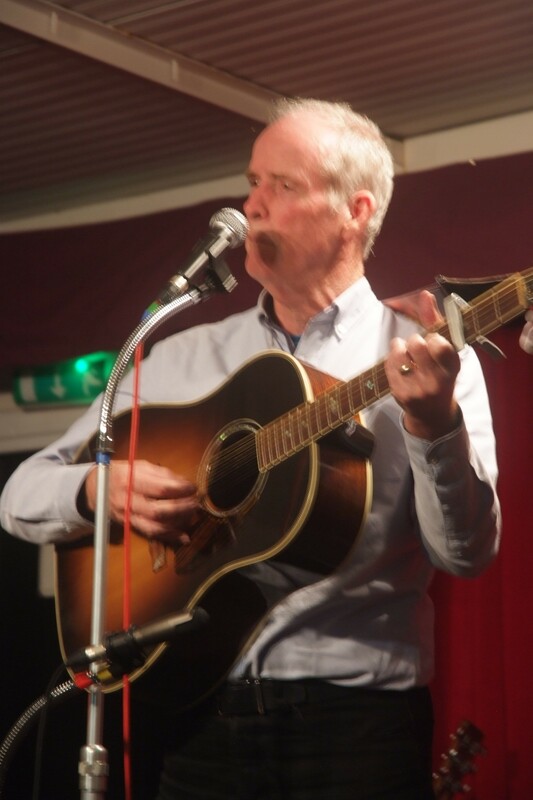 and an old favourite Four Wheel drives blue Ridge mountain Girl. 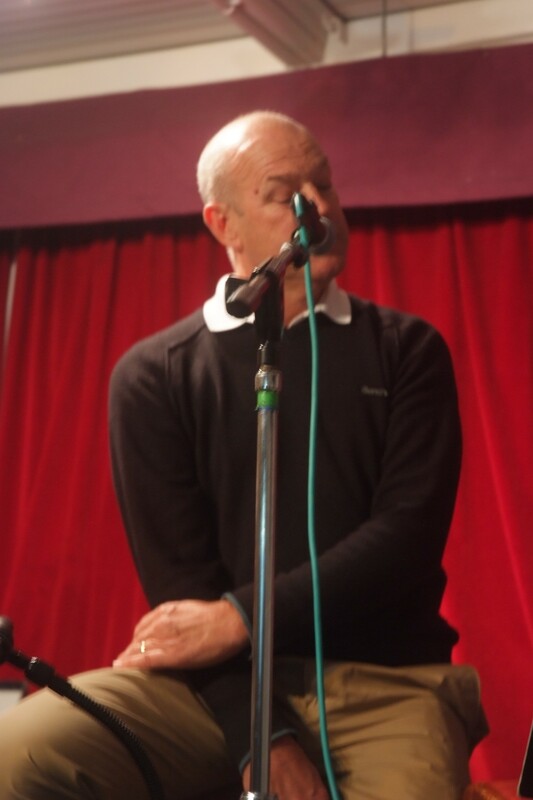 Richard, who was comparing this evening then told a joke (Neil Style!!!) about a friend of his called Paddy who went to buy a pizza, ( A true story) . When the laughter eventually died down he introduced Tom Goodall, Who started of with a really good Bruce Springsteen cover. To complete an excellent set. 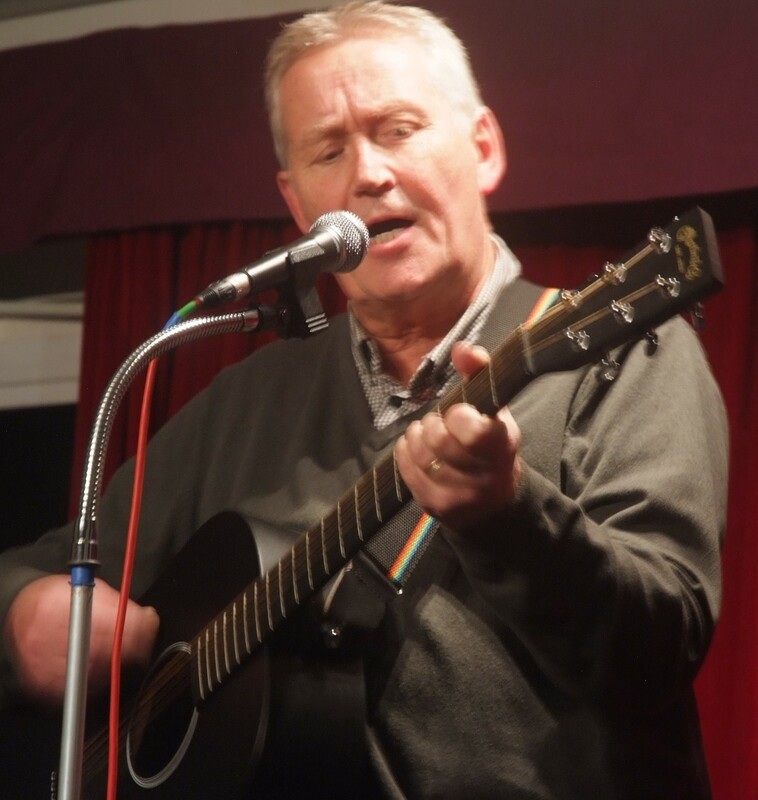 but amply rose to the challenge, by borrowing one of Geoff Hollis favourites, All the Answers, and one I haven’t heard him sing before, You,l never be the Sun. 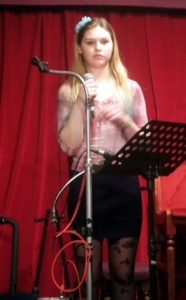 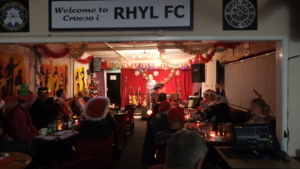 It was time to crank up the microphone to its highest height, and welcome Rhyl,s own BFG on stage. 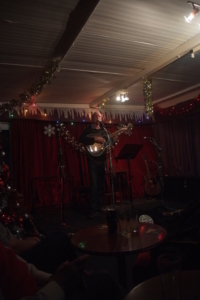 I really must get a panoramic camera, or move further back! 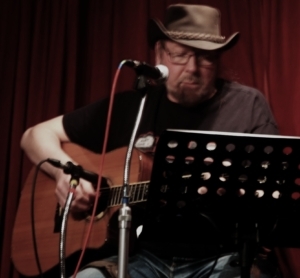 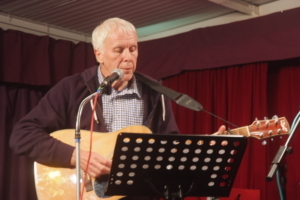 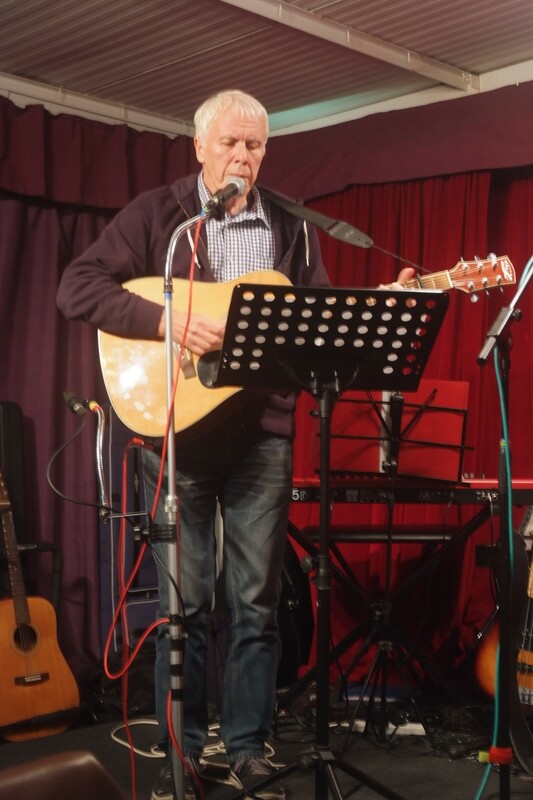 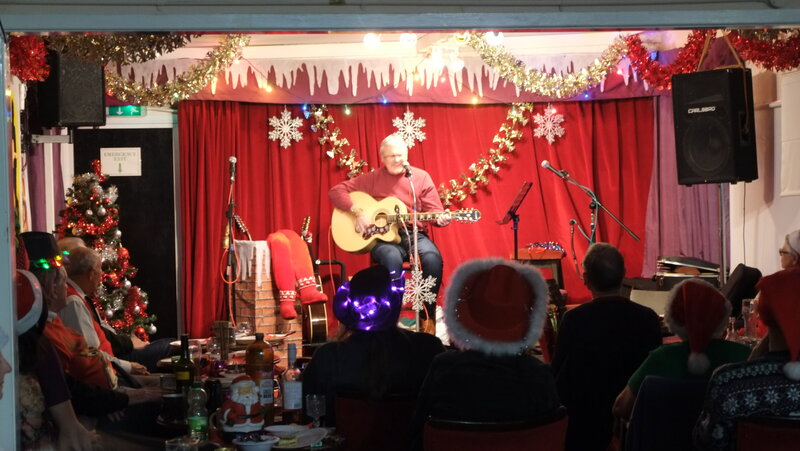 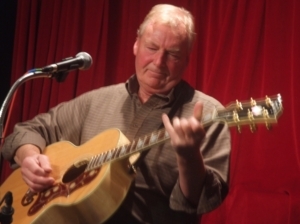 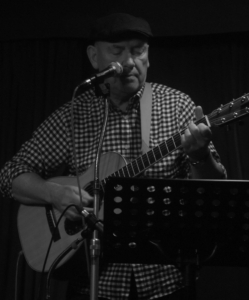 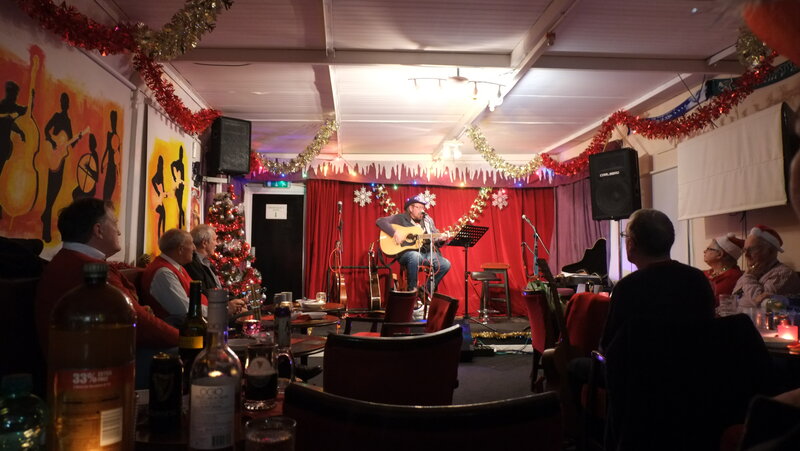 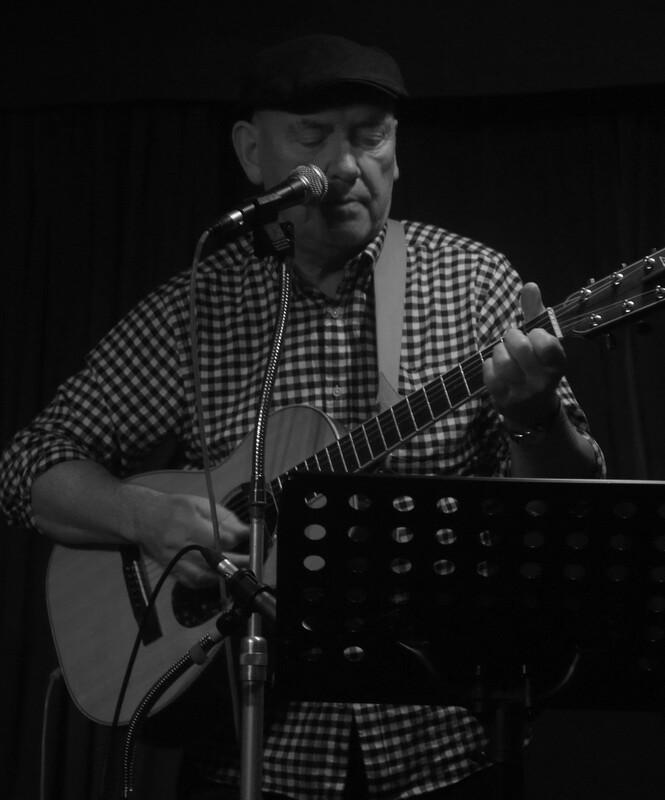 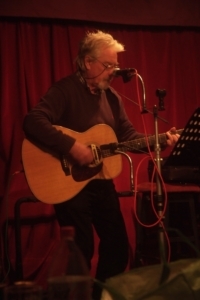 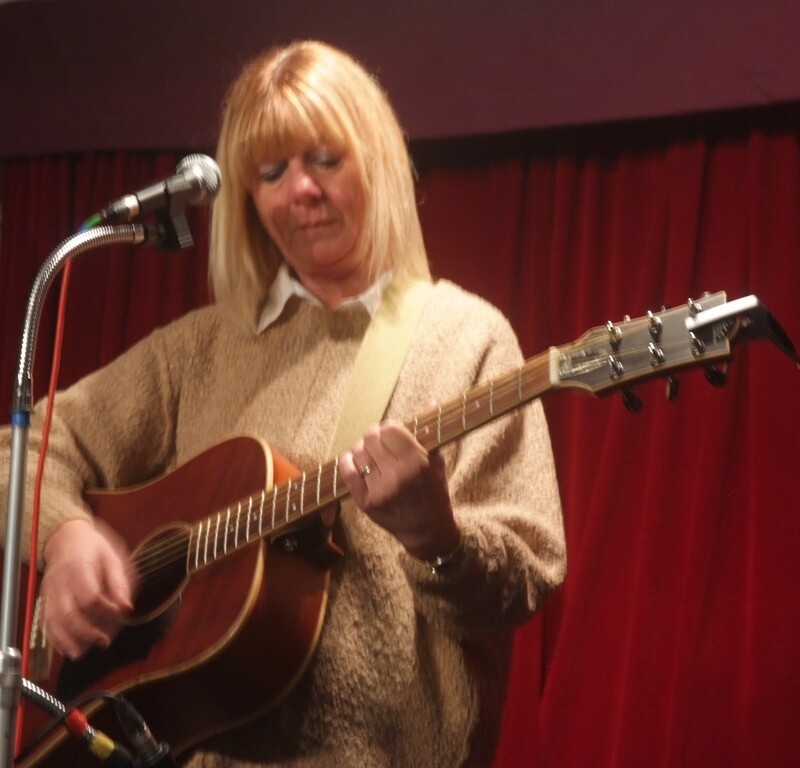 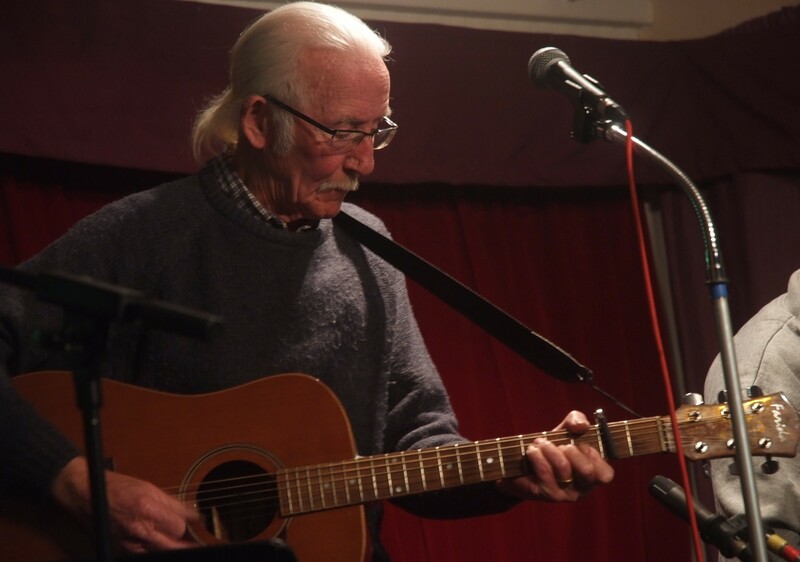 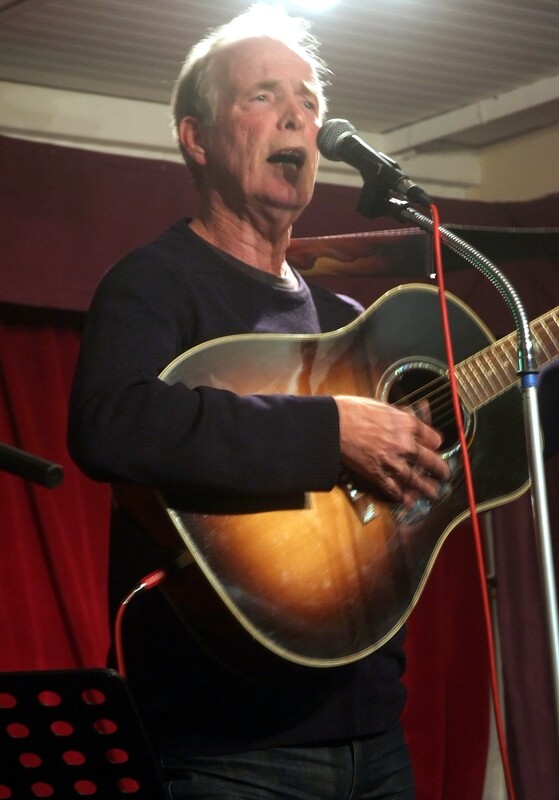 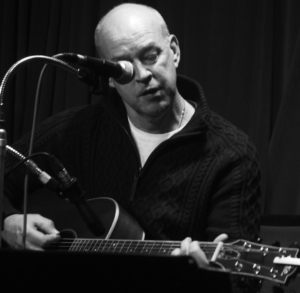 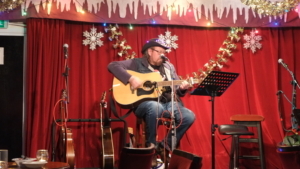 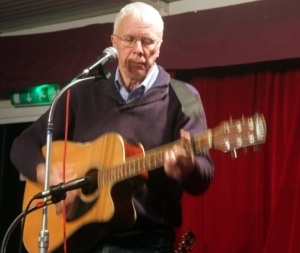 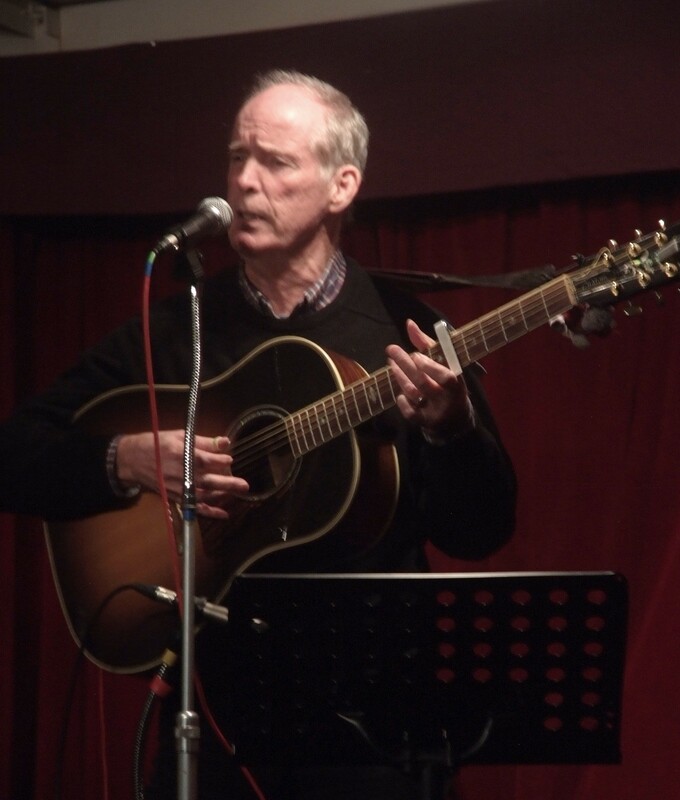 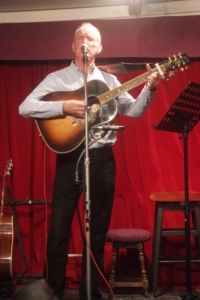 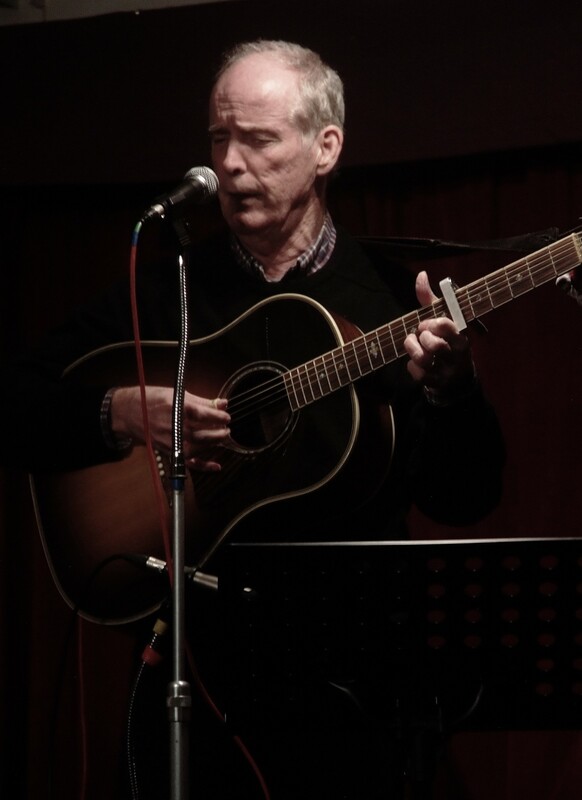 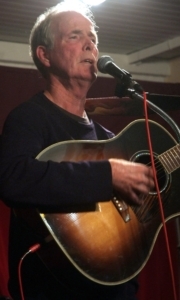 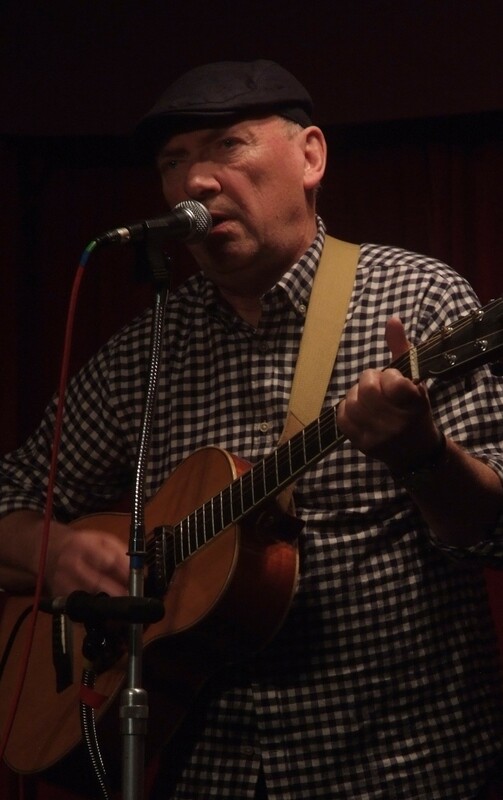 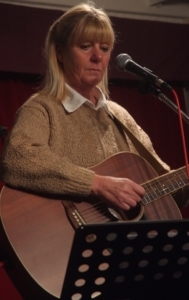 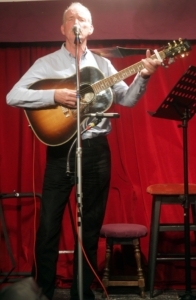 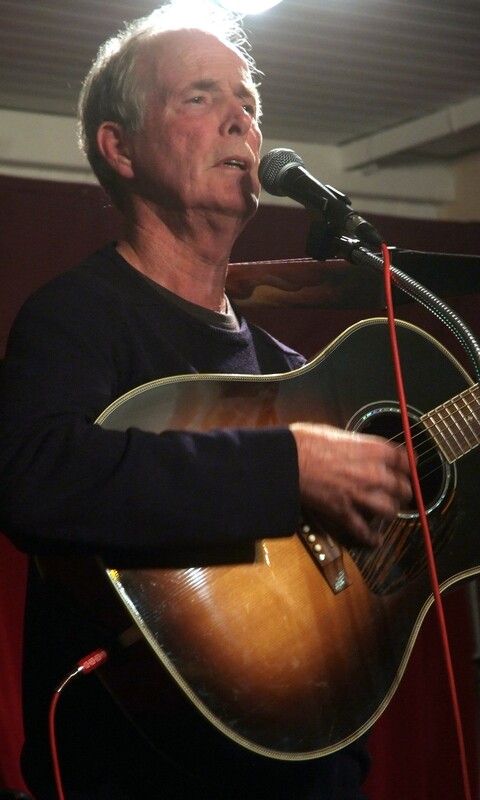 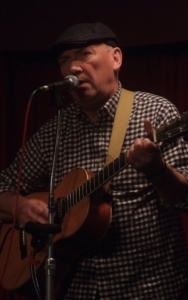 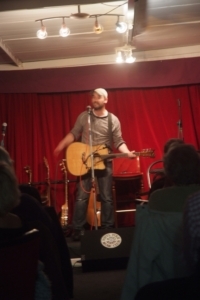 Goeff started with the poignant Bryn Phillips song about the true story of an ex Bridge End miner, For those of you interested….This is by Bryn. 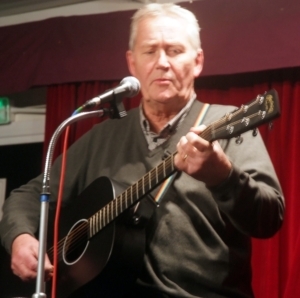 John Gates was a miner in South Wales, near Bridge End, before he was made redundant at the age of 50 when the pit in his local town closed down. There was virtually no chance of getting a job in the area and so he turned to a hobby which he had for years – embroidery. 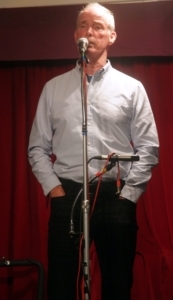 He is now a successful teacher and lectures on the subject all over the place. 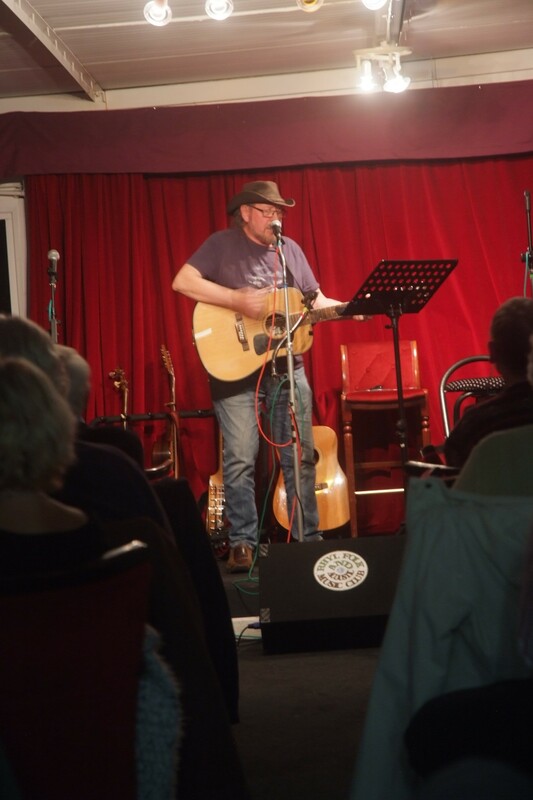 I first heard his story on Woman’s Hour, whilst travelling back from Bridgnorth Folk festival. 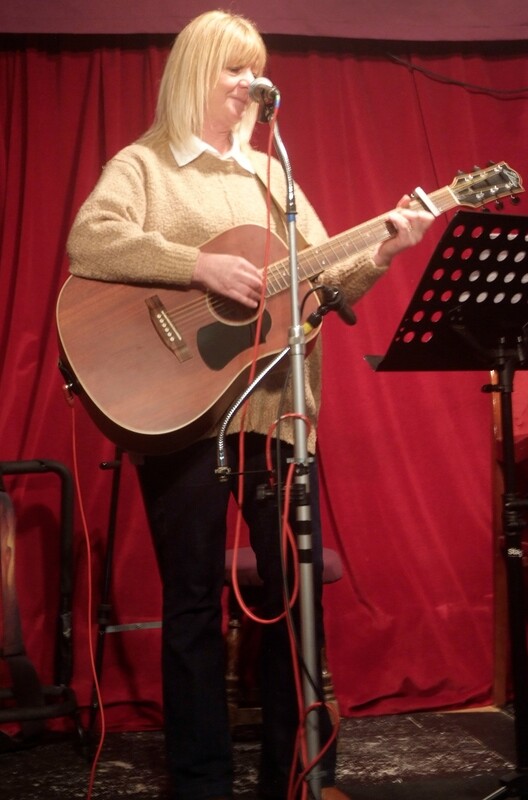 Immediately I arrived home I started to write the song. After I had written it I managed to trace John and sent him a recording of the song to make sure he was happy about my performing it. 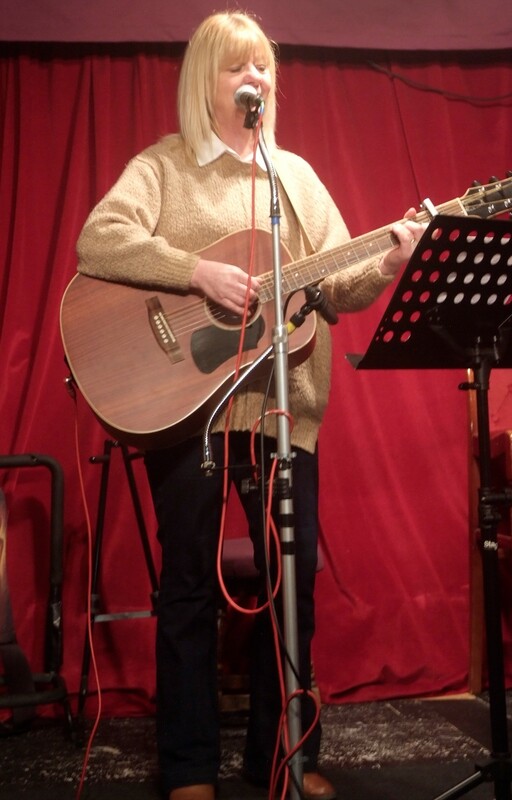 Thankfully he was, and what’s more he sent me some photographs of the wedding dress which features in the song and also an embroidered badge, which I treasure. 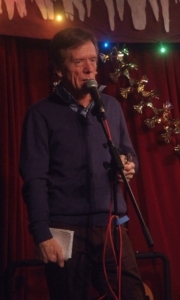 If you click on the image (top right) you can see this fine example of his detailed work in, of course, silver and gold. 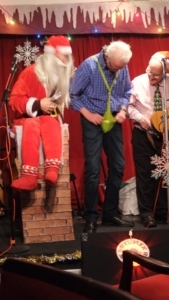 And for those of you wondering, he hasn’t got a halo, it’s the light bulb about 4″ from his head!!! 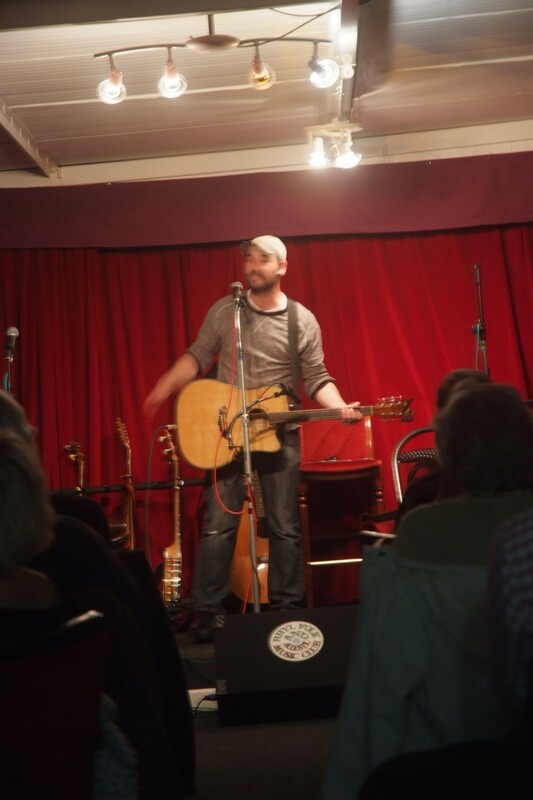 Next he sang for us a song he has been working on for the last 9 weeks, his first performance of the Stan Rogers song about the Mary Ellen Carter. this could well turn into a favourite. 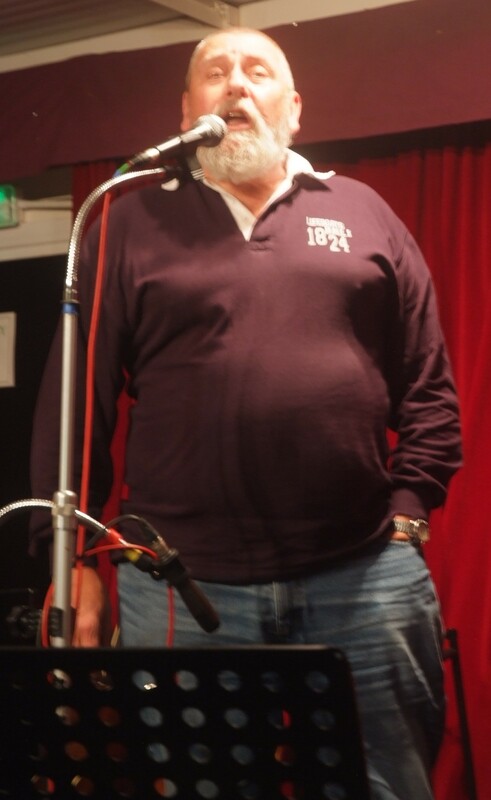 We only had to wind the mike down a little bit for our next guest, Terry is quite long too!! 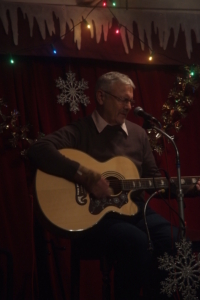 he started of with a Mel haggard song, and finished with the classic Hank Williams, Willy nelson song Old Flames. 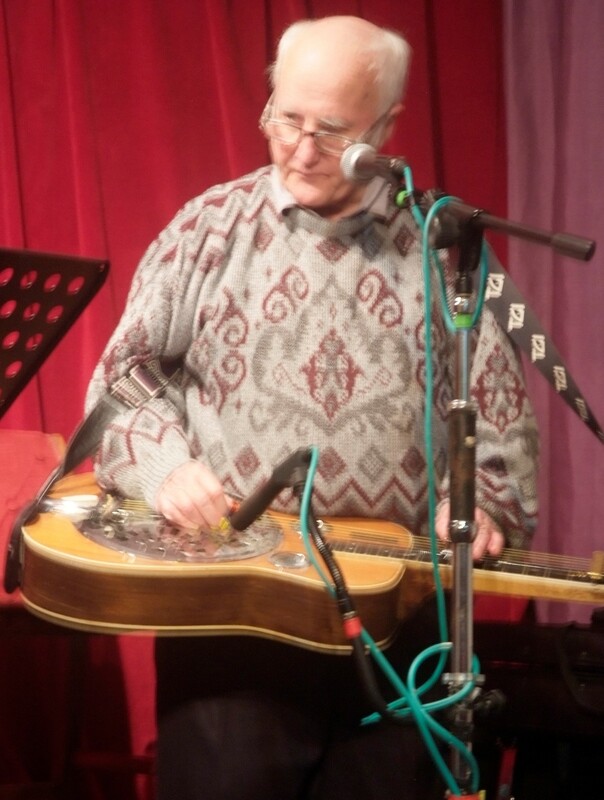 accompanied of course by Tom on slide guitar. We then had the raffle, then most artists did another song. 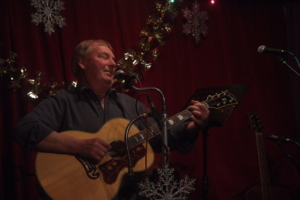 Tom Degney did South Bound Freight. 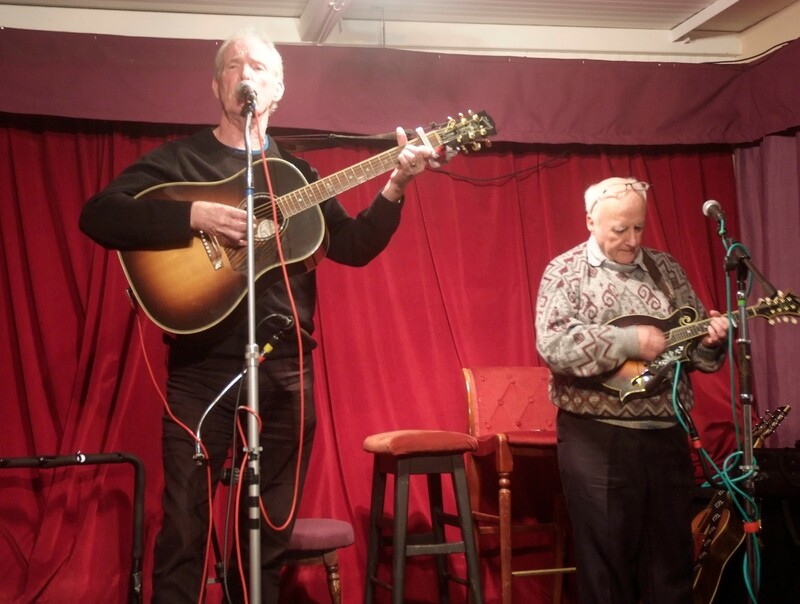 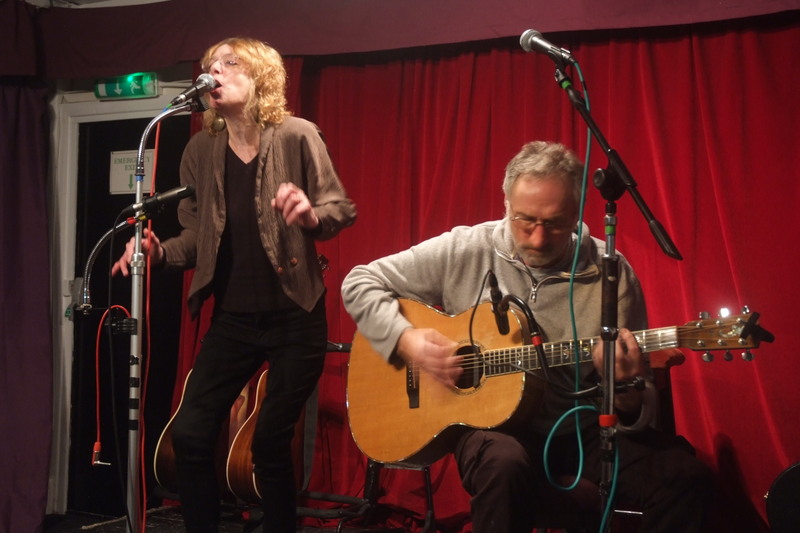 Then Richard sang The Games people play, with Tom accompanying on the mandolin. Tom Goodall came back, and gave us a very good version of Creedance Clear Water Revivals Proud Mary, (Even Hotter than Tina Turners) Richard and Wendy were Next, I missed Richard first time round. They sang Welcome to my world as a duet. 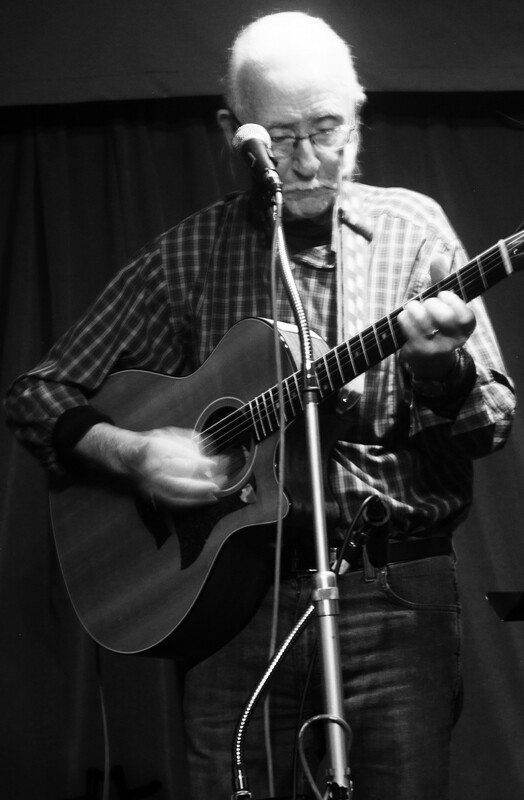 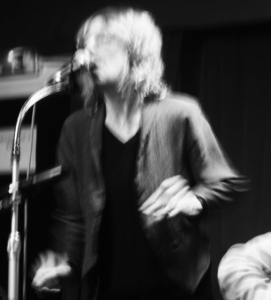 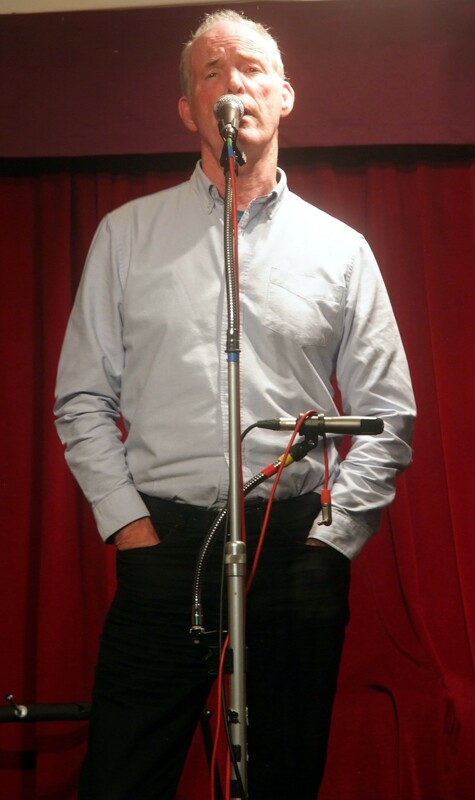 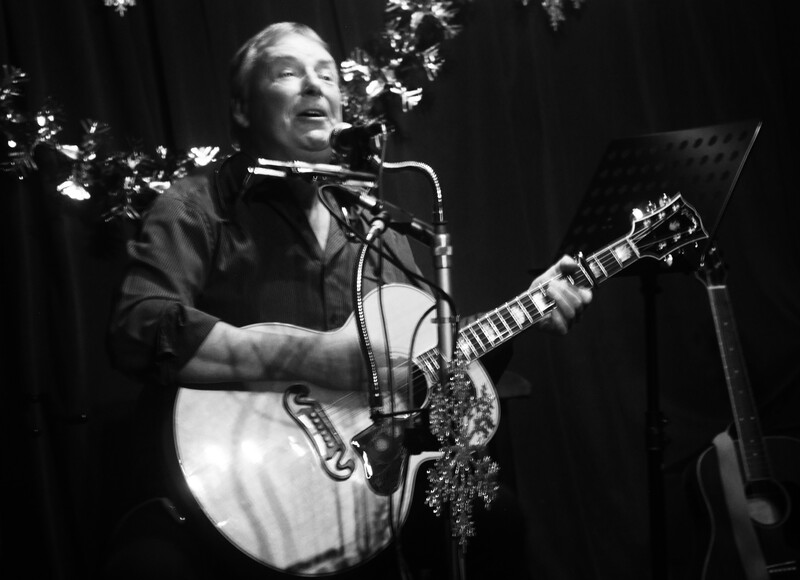 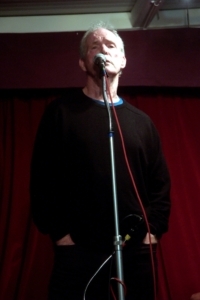 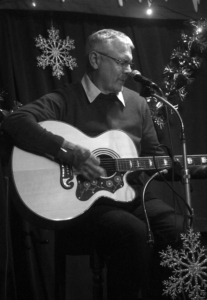 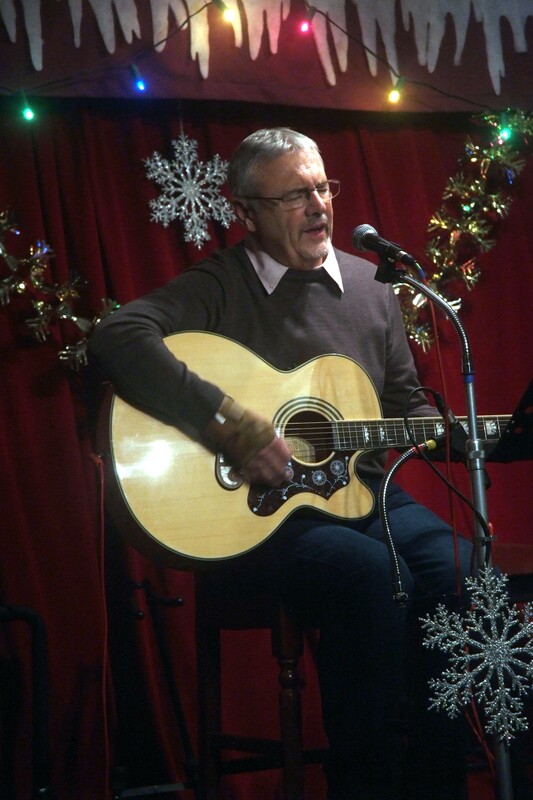 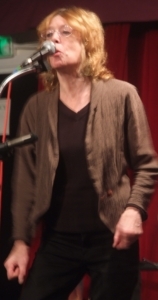 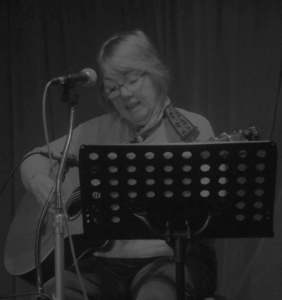 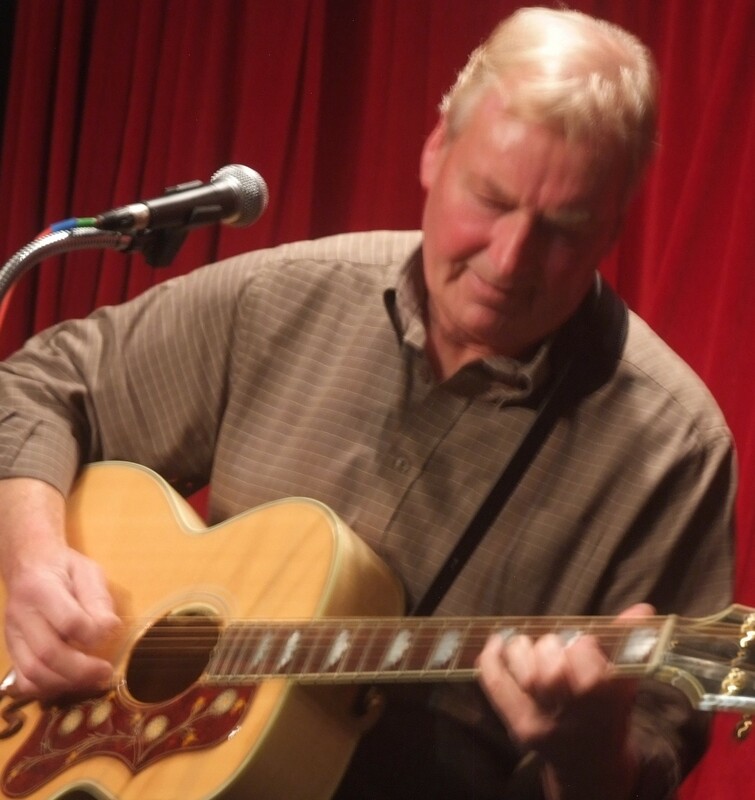 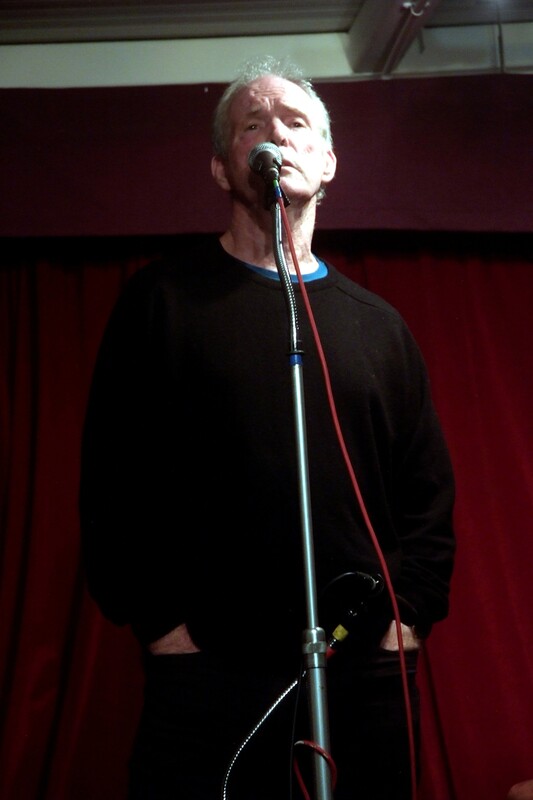 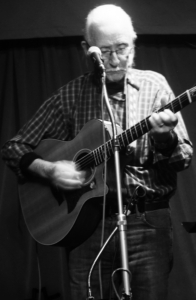 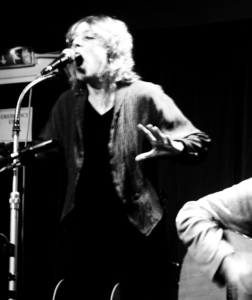 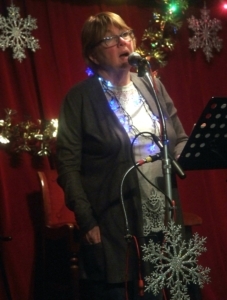 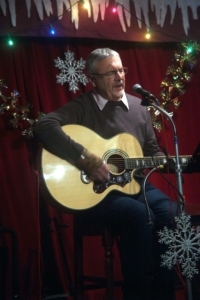 Geoff Hollis sang windy Harbour, Linda gave us a sing-a-long, or more accurately a howl a-long, The Northern Plains. Tery Mealey gave us the John Prine favourite Put Another Log on the Fire, always a favourite educational song for the girls. 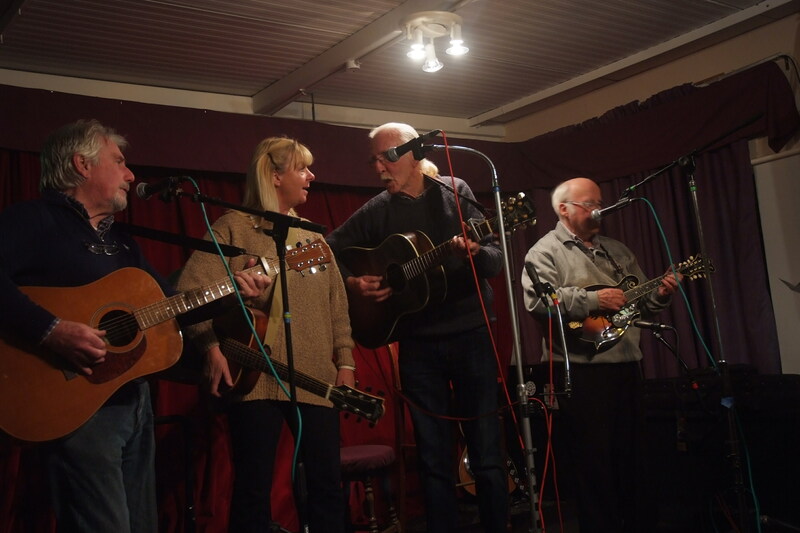 To Finish Richard, Tom Terry and Wendy all sang The Speed of the Sound of loneliness, then finished with Hank Williams Wedding Bells. 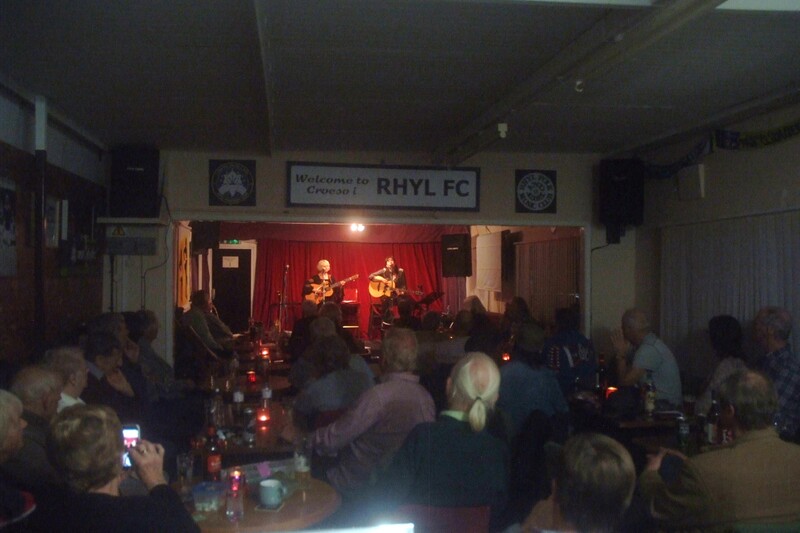 DONT FORGET 4TH NOVEMBER GUEST NIGHT, MEMBERS £1.50 AS NORMAL, GUESTS £3.00. 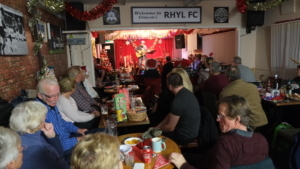 THE BEST VALUE NIGHT IN RHYL. 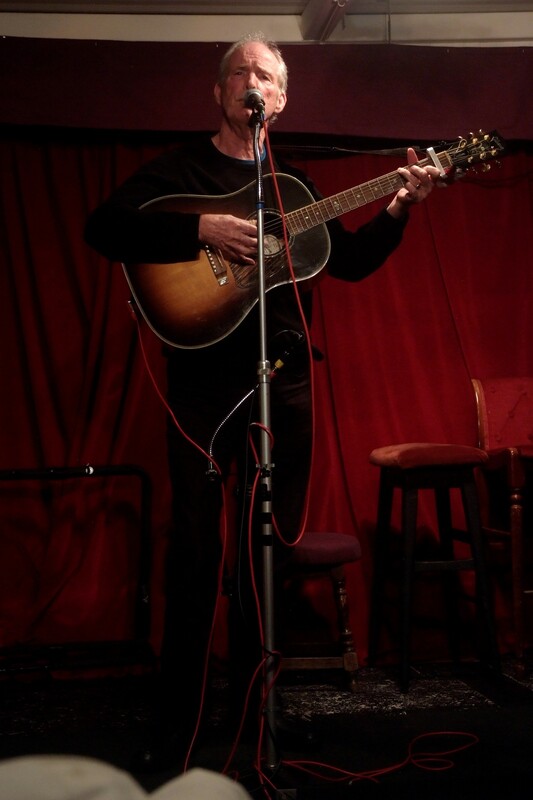 See you all next week. 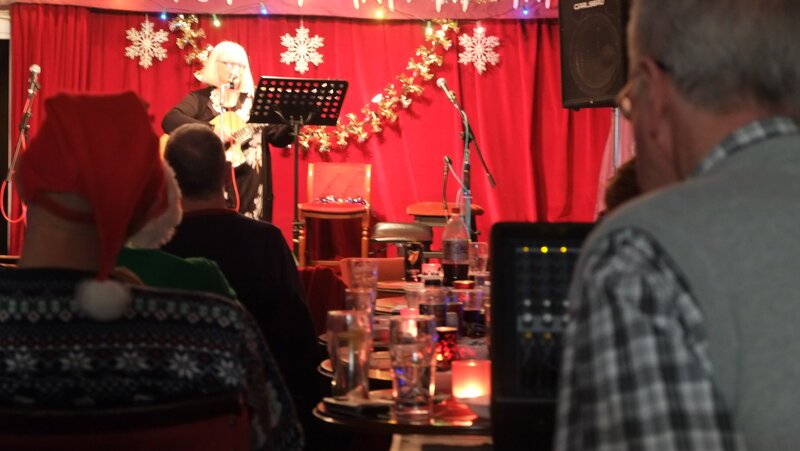 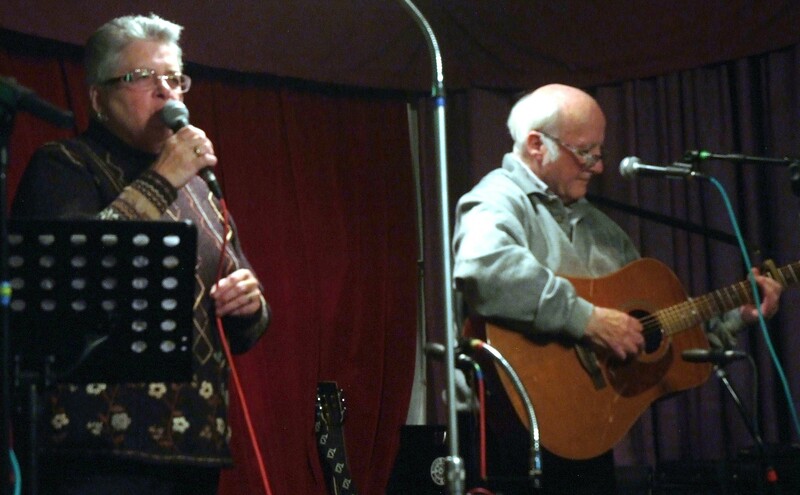 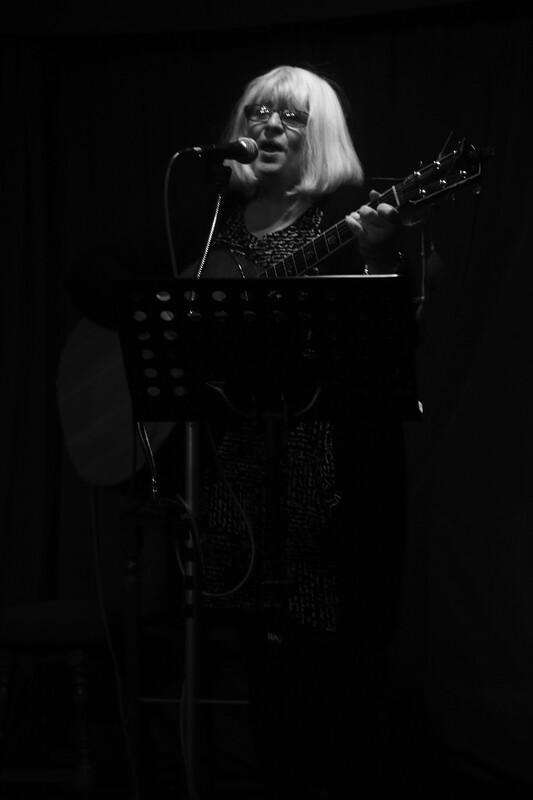 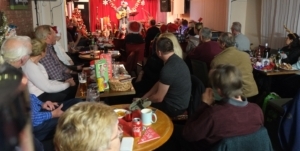 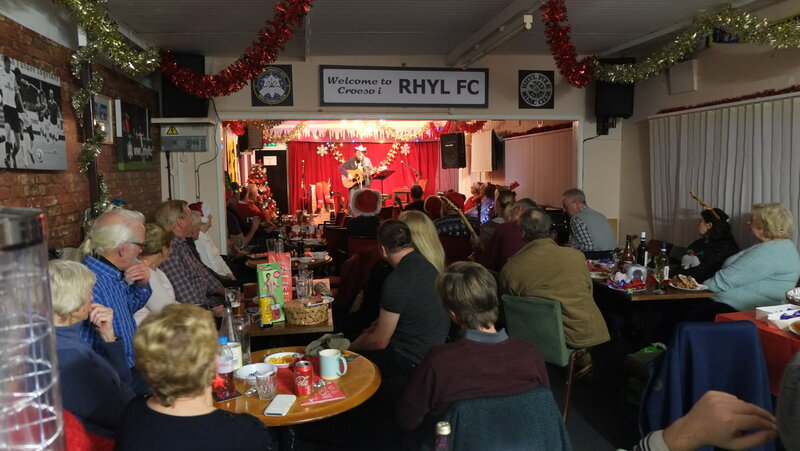 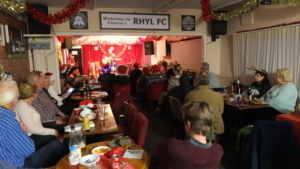 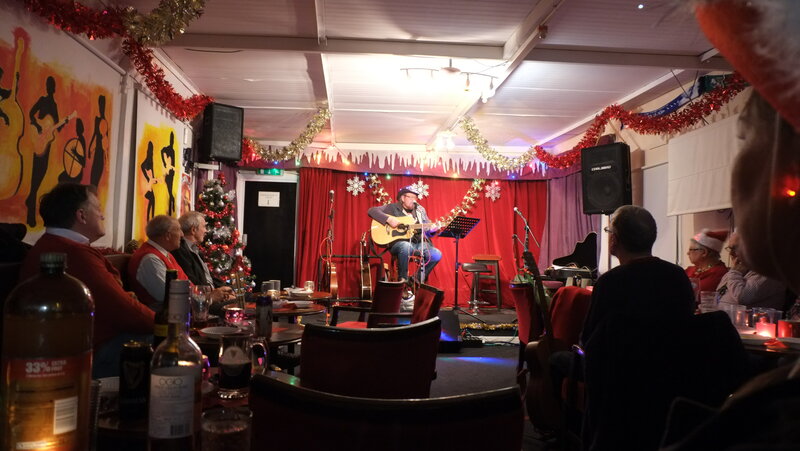 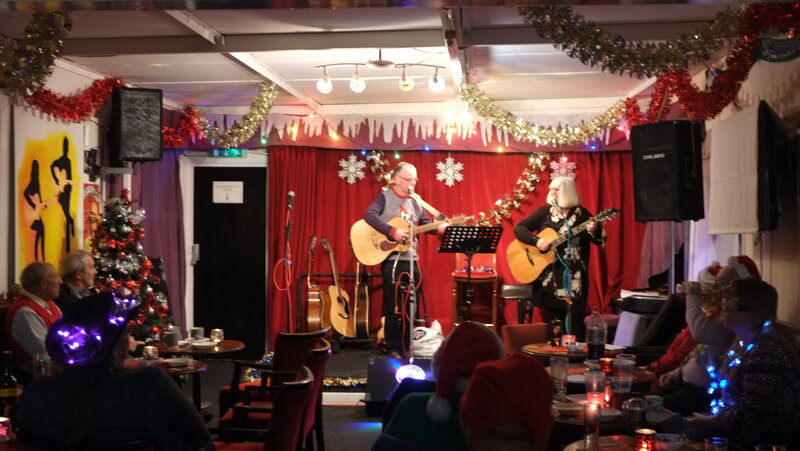 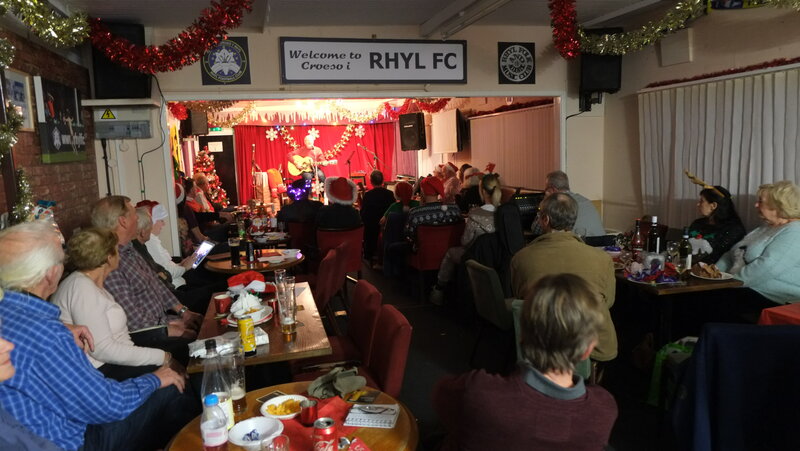 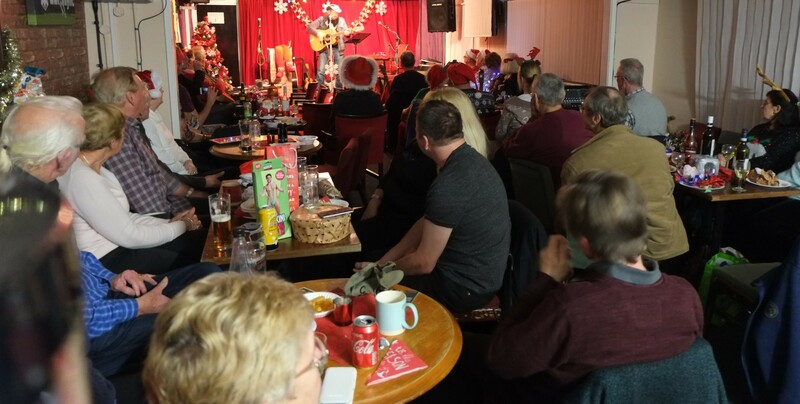 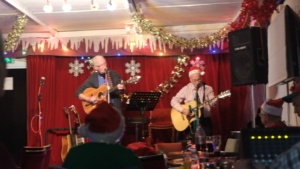 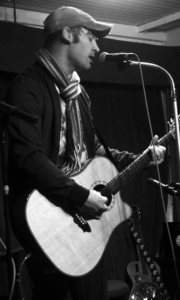 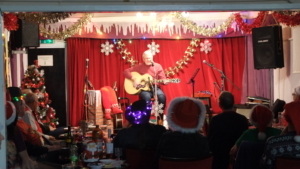 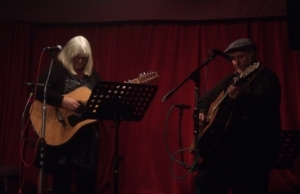 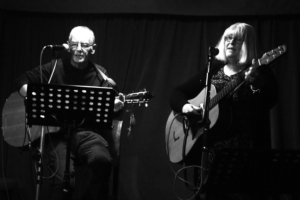 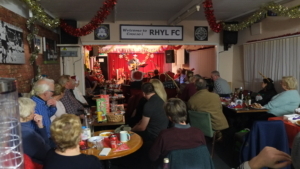 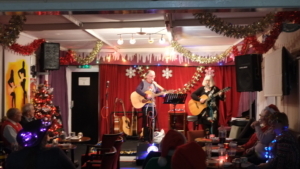 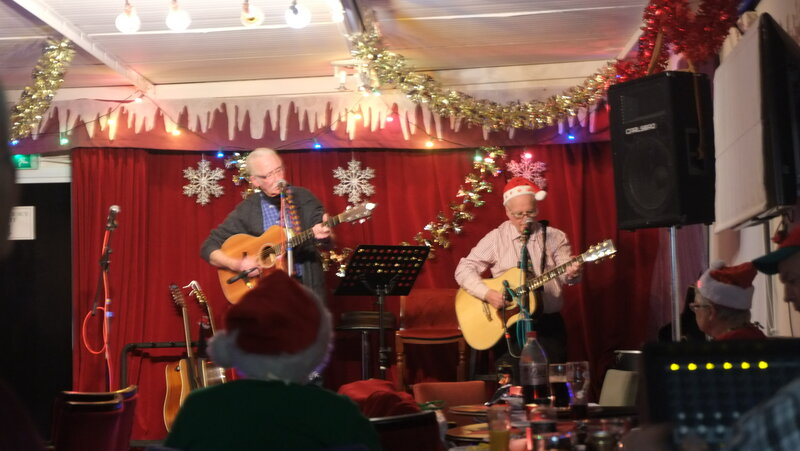 It’s Singer’s Night at Rhyl Folk and Acoustic Club every Friday at 8.00pm in the The Corbett Sports Stadium Lounge at Rhyl Football Club which boasts comfortable seating, a stage with a PA system, and a large safe car park. 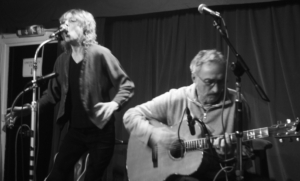 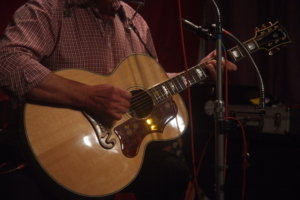 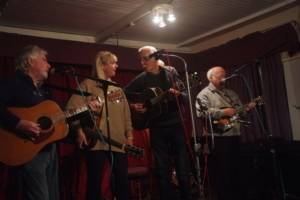 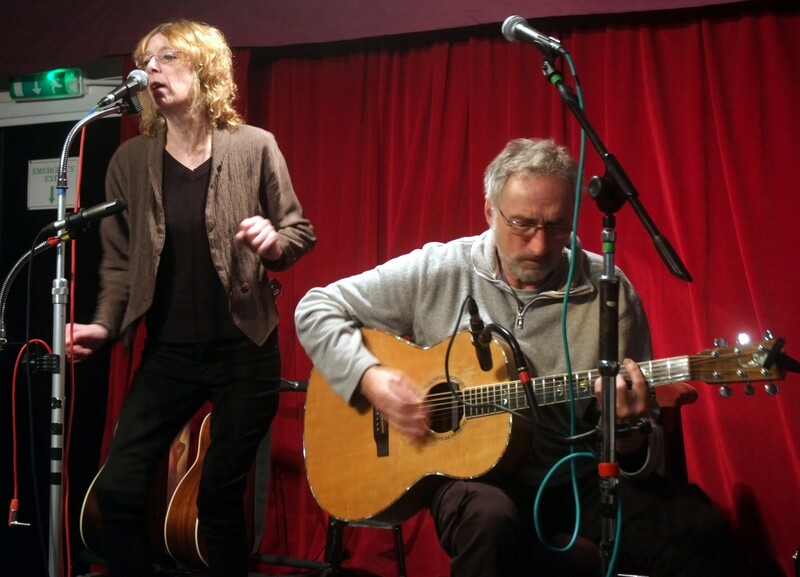 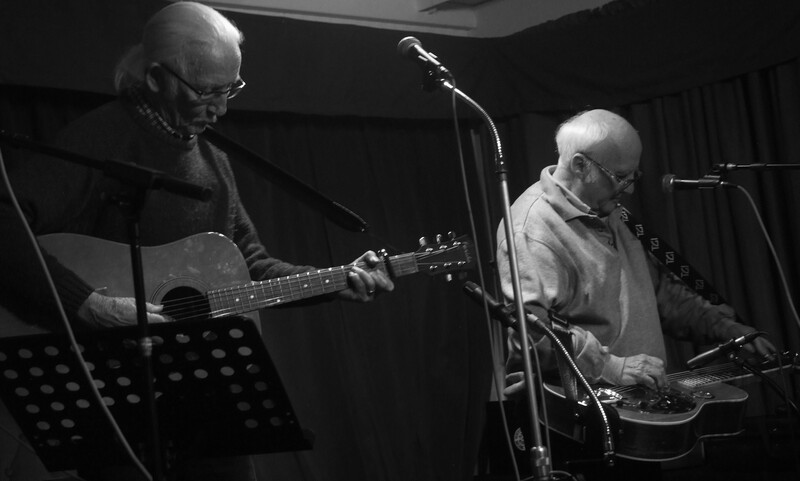 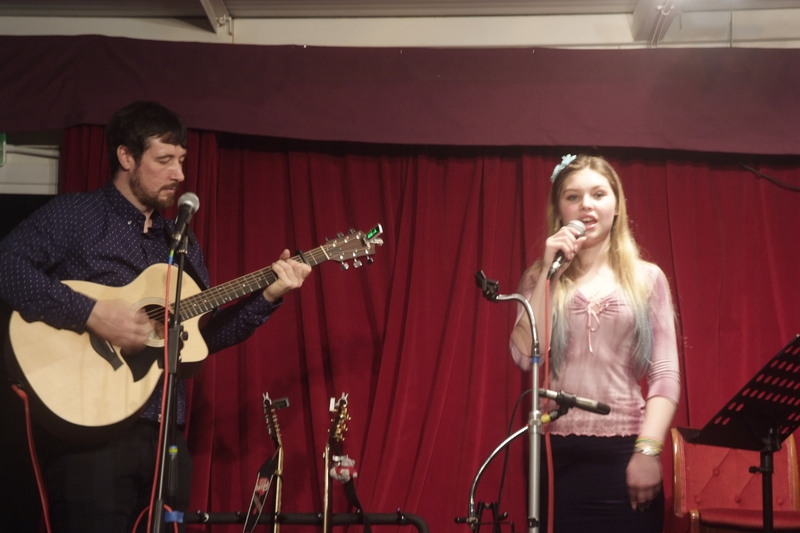 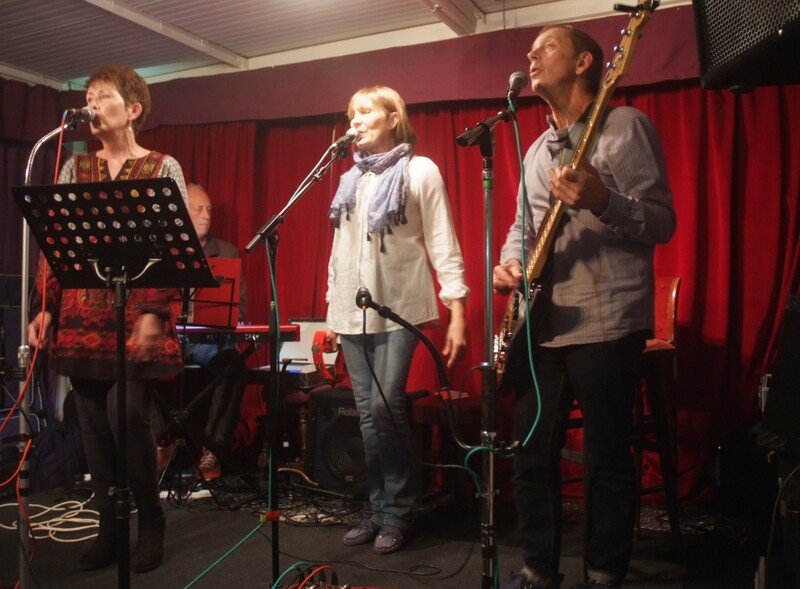 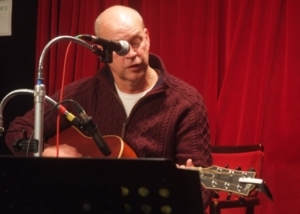 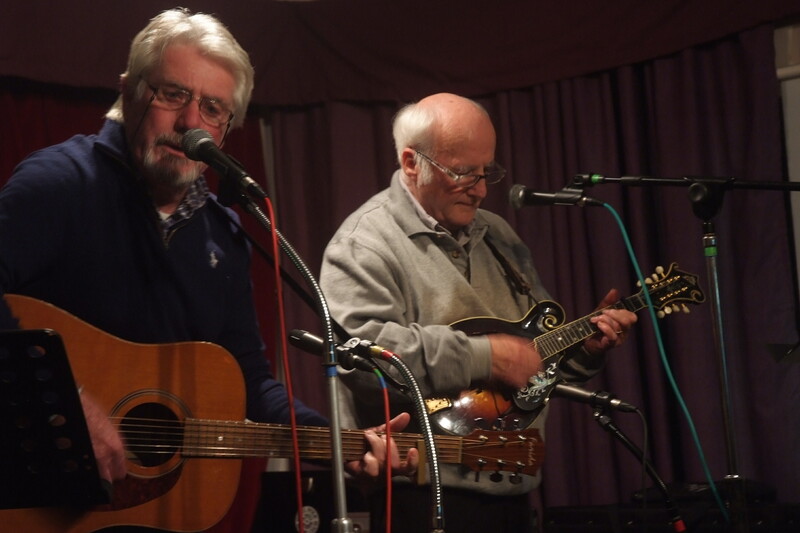 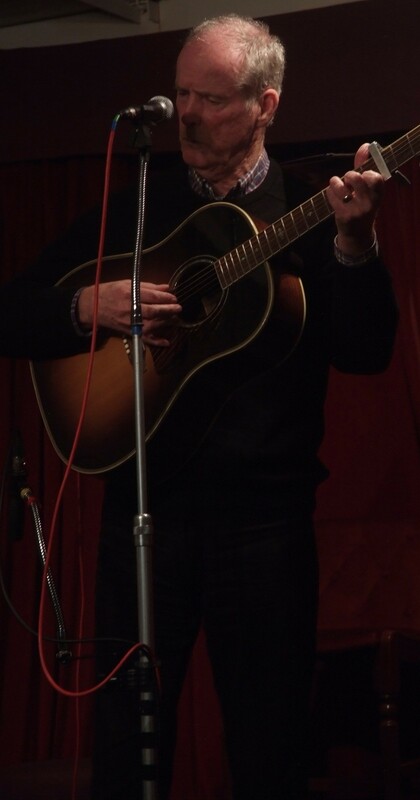 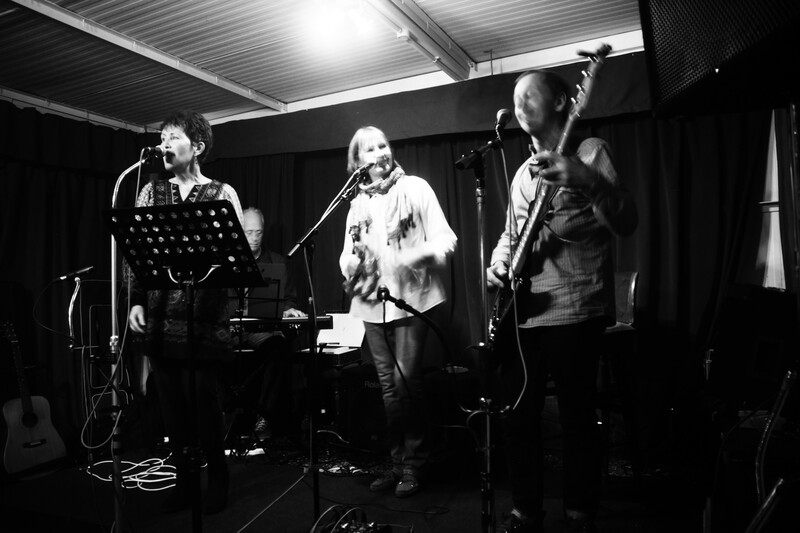 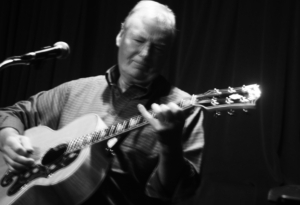 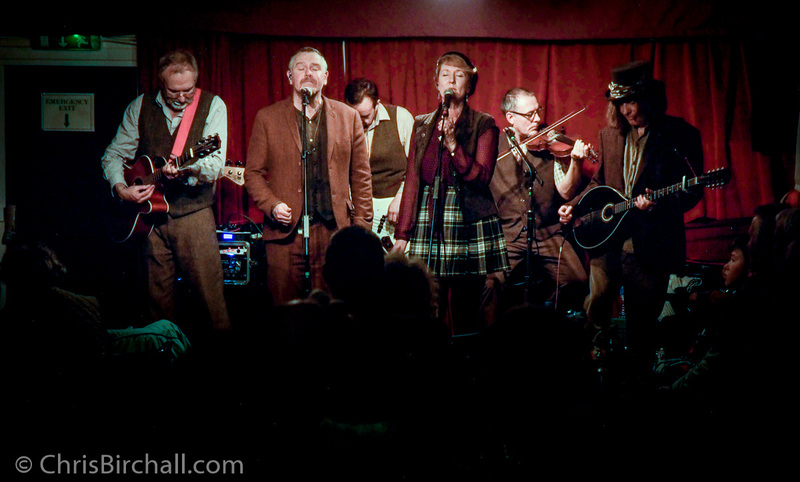 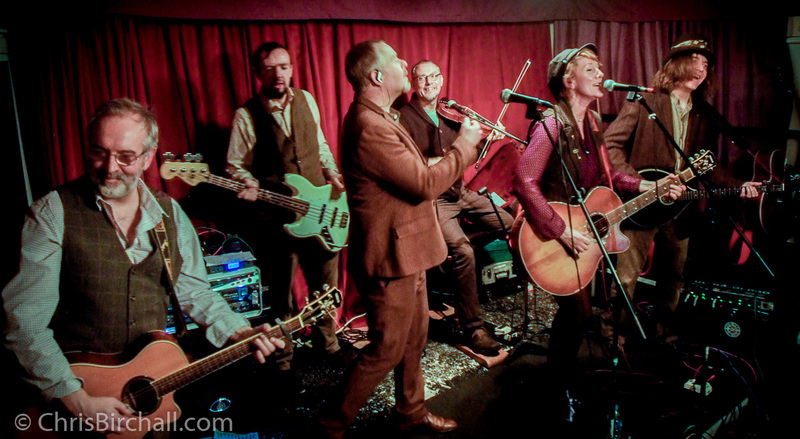 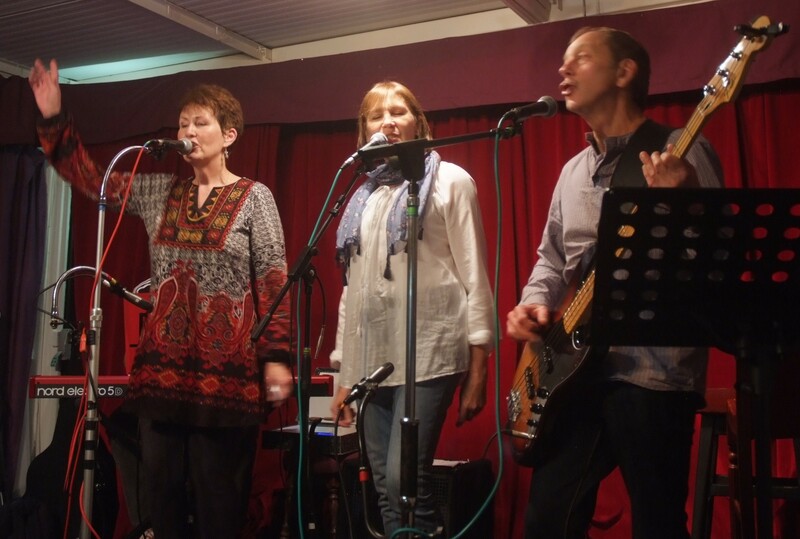 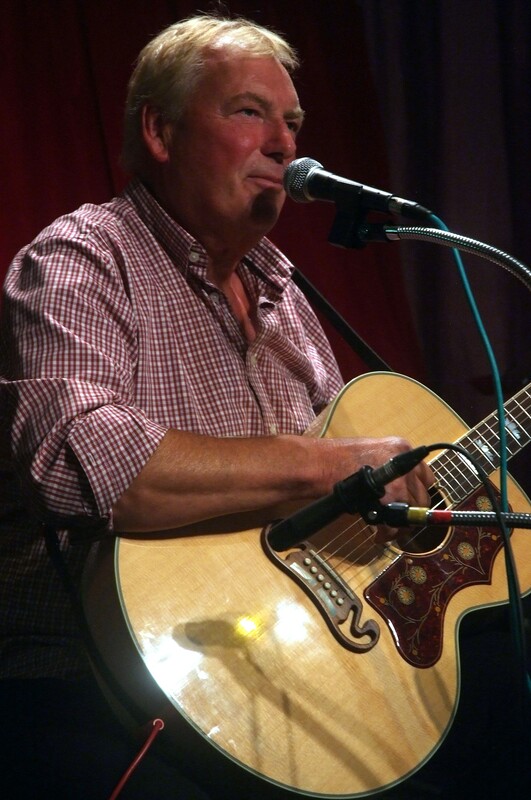 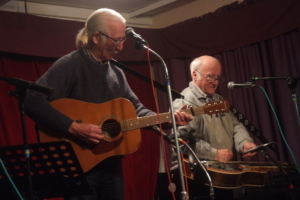 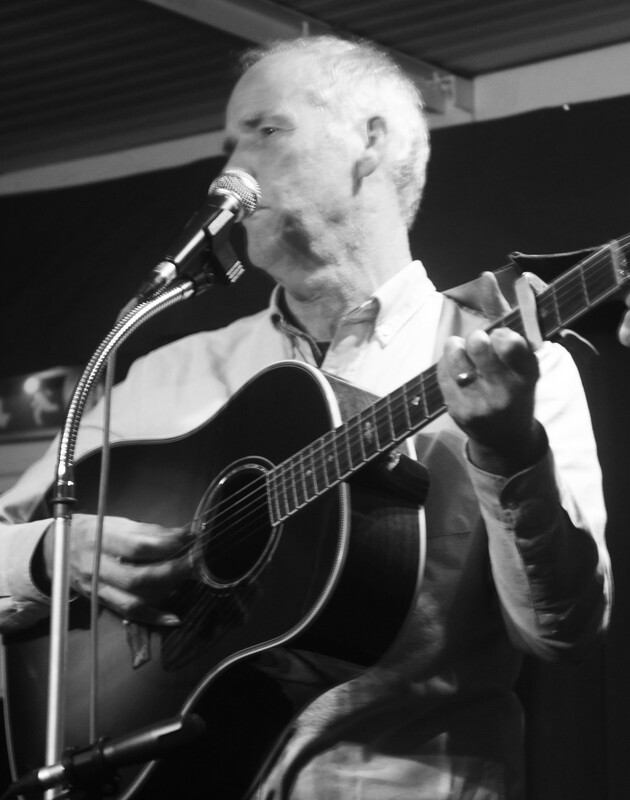 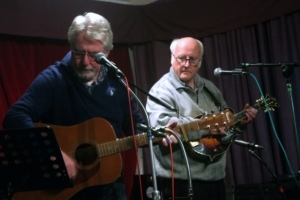 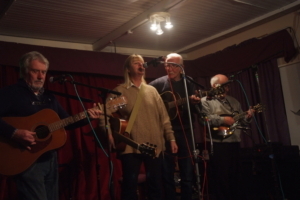 All styles of music are catered for from Folk to Blues to Country, and all abilities too! 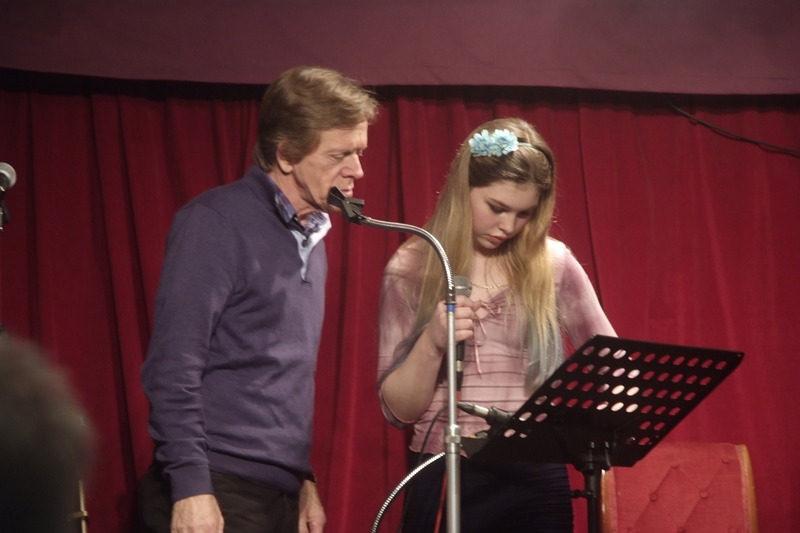 On our singer’s nights we extend a warm welcome to visitors, whether as performers or just to relax and enjoy the music. 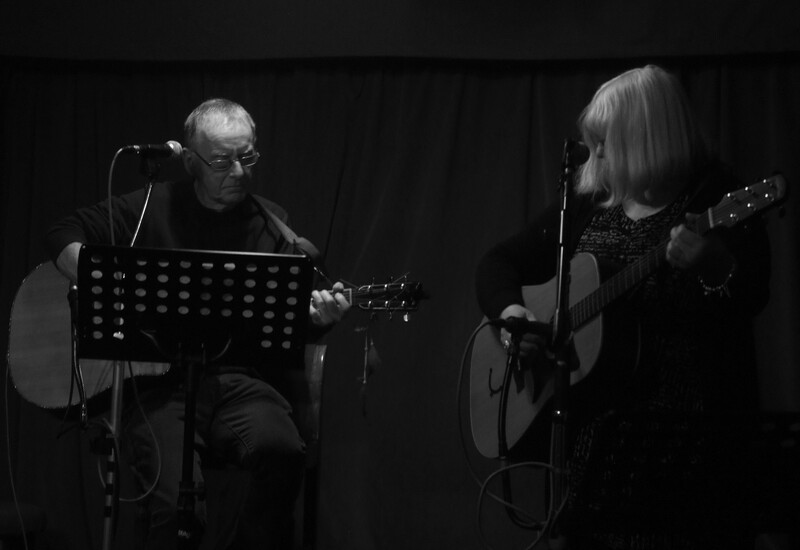 Even when we have a guest act booked, there us usually an opportunity for regular members to take the floor for a song or two. 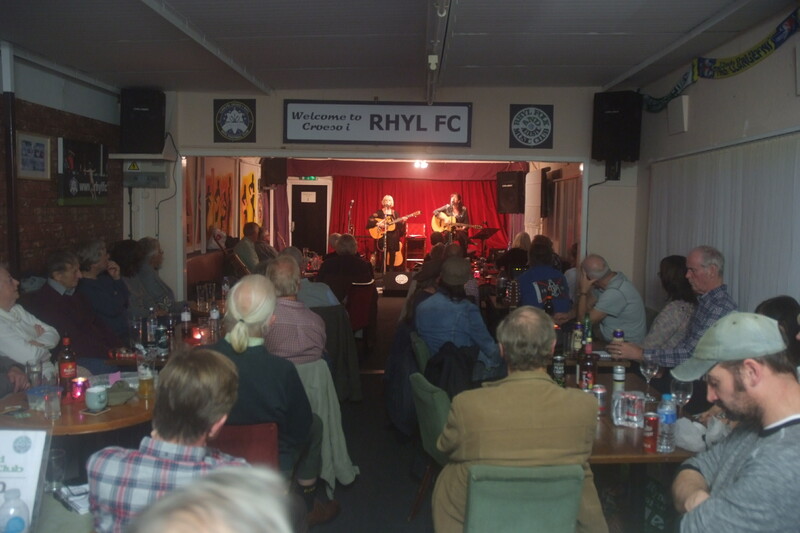 Admission is just £1.50 and that includes a free ticket for the bottle raffle! Certain Guest Nights may cost a little more. Please check the calendar on our website for full details. Beryl Worthing on DUE TO FRIDAY NIGHT FOOTBALL MATCHES ON 27TH OCTOBER AND 30TH NONEMBER……………..
tom degney on Friday 19th May.